Keep checking back as I have several hundred parts to list here from my personal stockpile. These parts are located near Collingwood, Ontario, Canada. Small and medium sized items can be shipped anywhere in Canada or the USA via Canada Post/USPS. 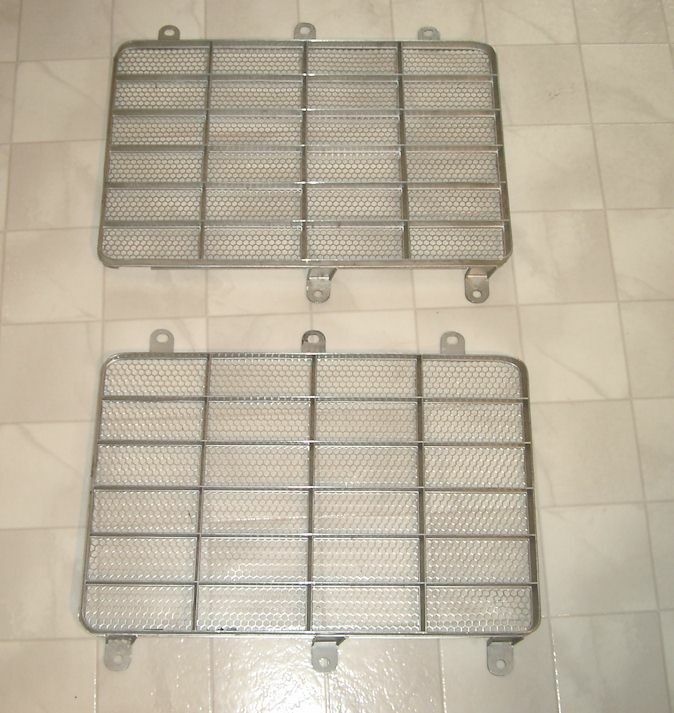 Most larger items (grilles/bumpers) will be very expensive to ship out of Canada and are recommended for local pick-up or delivery only. Click on blue text links for a photo. PayPal Accepted. Contact Allan at 519-922-3321 or E-mail allan.lewis@sympatico.ca for more information. 1964 AMC Rambler American Grille - In aged original condition. Slight bend at one end. No emblem - $20. 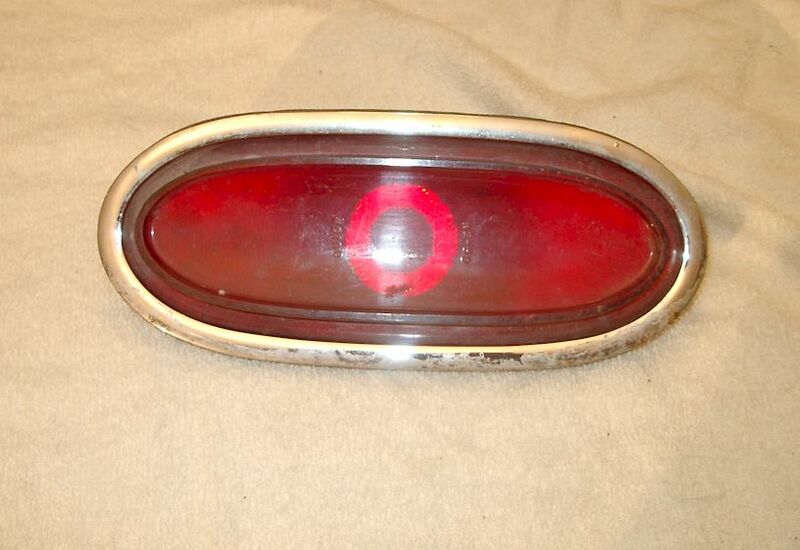 1966 AMC Rambler Station Wagon Taillight Bezel - Part # 3553575. In driver condition with one pit and a small nick - $20. 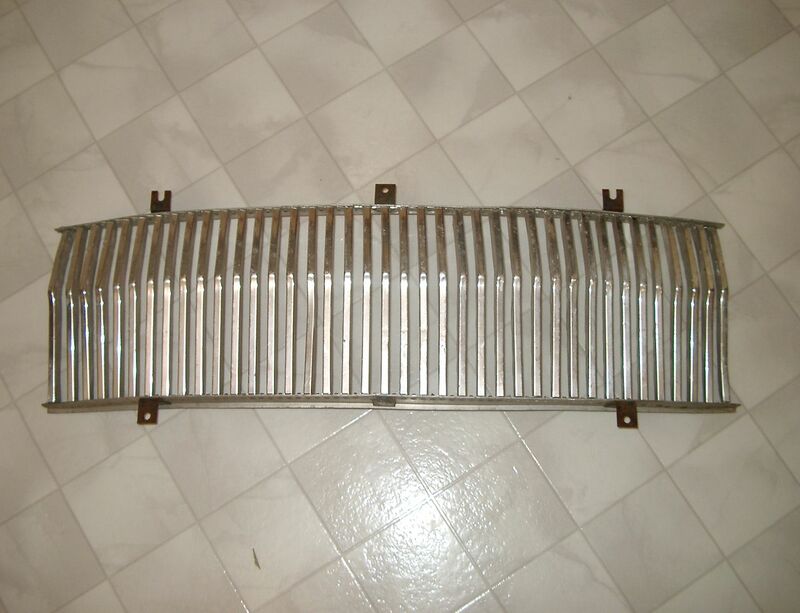 1969 AMC Rambler Grille - In good overall condition but shows many light scratches and one bar has a slight bend - $20. 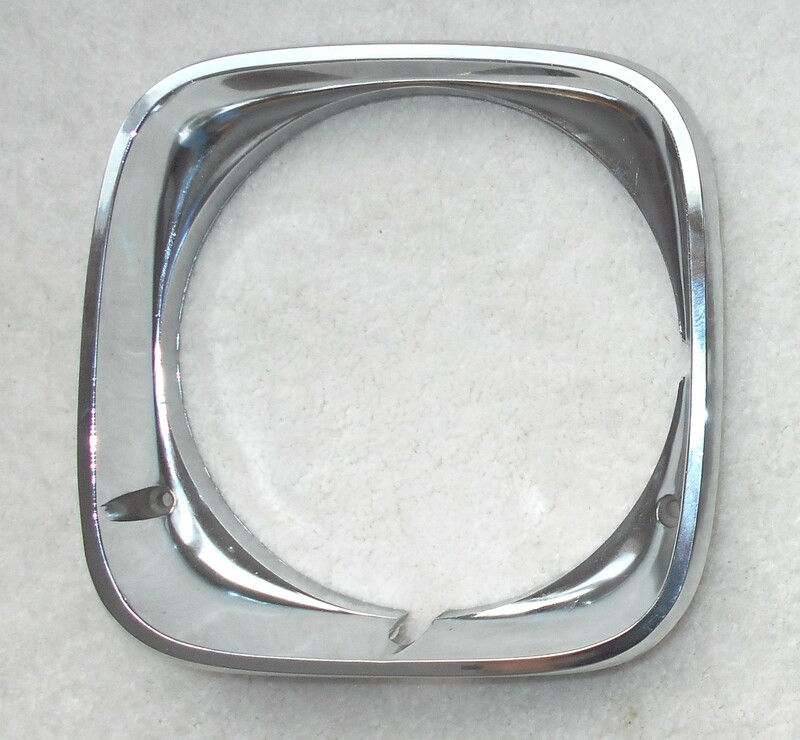 1970 to 1972 AMC Hornet Headlight Bezel LH - Part # 3615723. In driver condition with a repair on its inside edge - $SOLD. 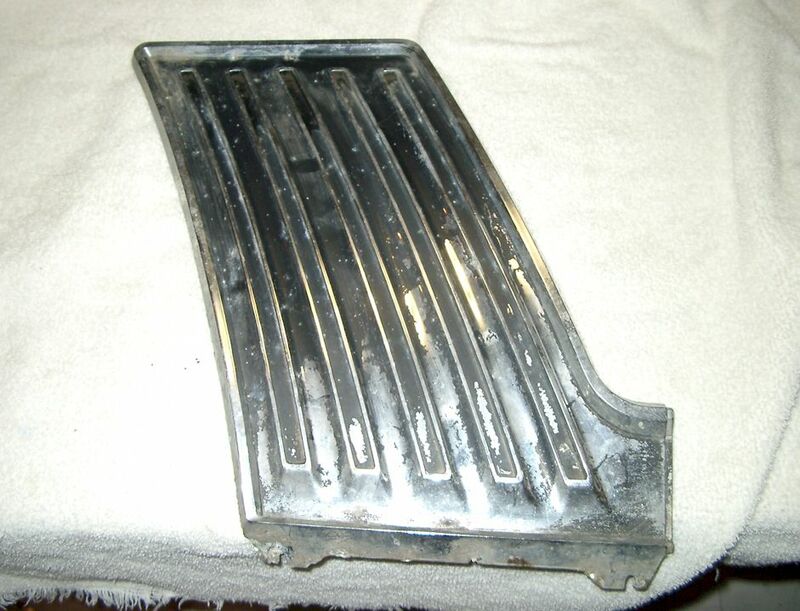 1970 AMC Rebel Grille - Part # 3615920. 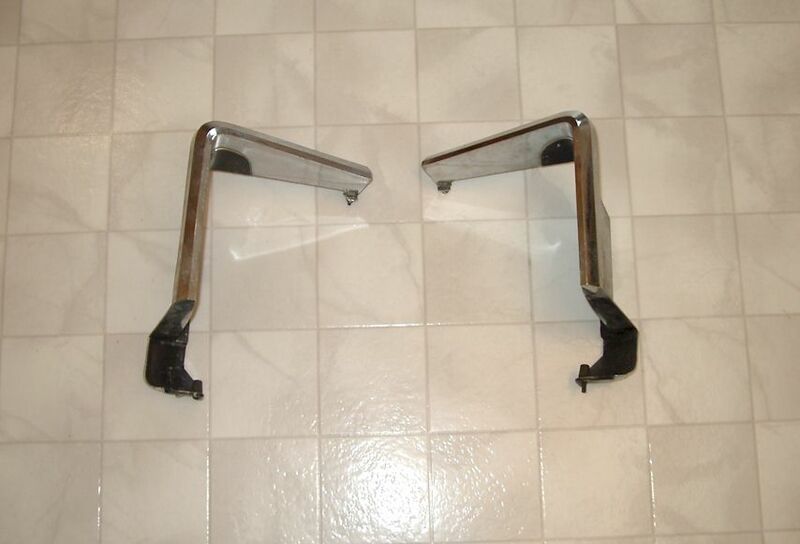 Two broken mounting tabs (one broken piece included) - $SOLD. 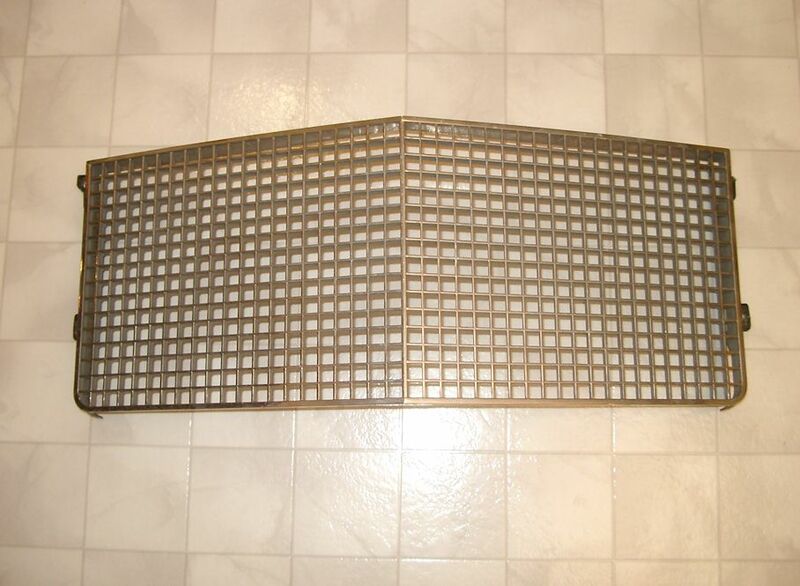 1971 AMC Ambassador Grille - In good original condition outside of one damaged mounting tab - $20. 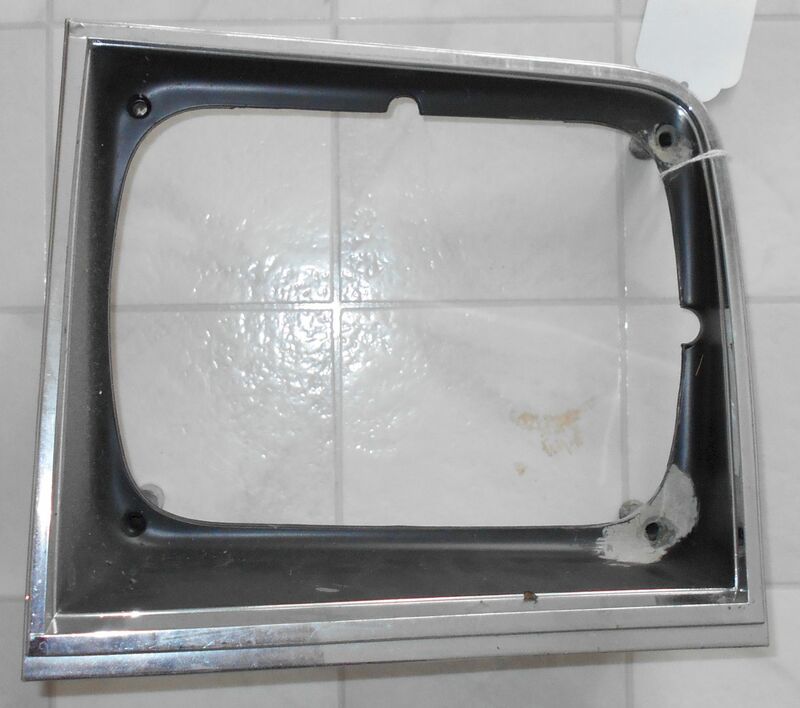 1971 AMC Ambassador Headlight Bezel RH - Part # 3632322 31878. Good original condition. One ding & minor crack on its bottom edge - $20. 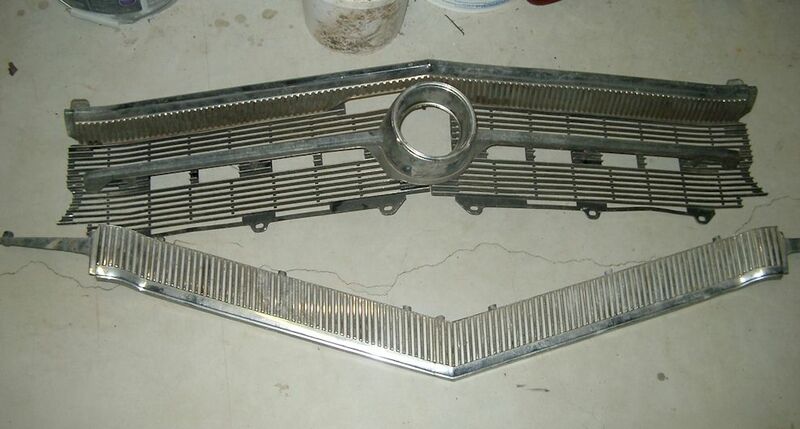 1971 AMC Hornet Grille - In good original condition. Ready to install - $SOLD. 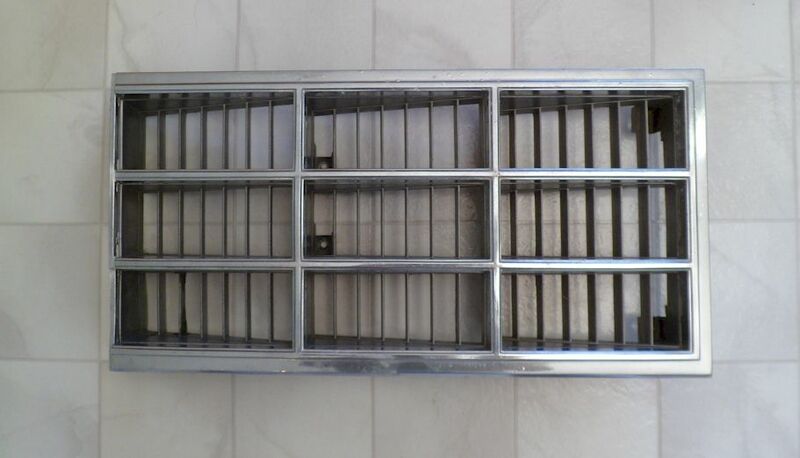 Austin Healey Grille BJ7, BJ8, late BN7 and BT7 - In good original "driver" condition. A few small dings and scratches - $SOLD. 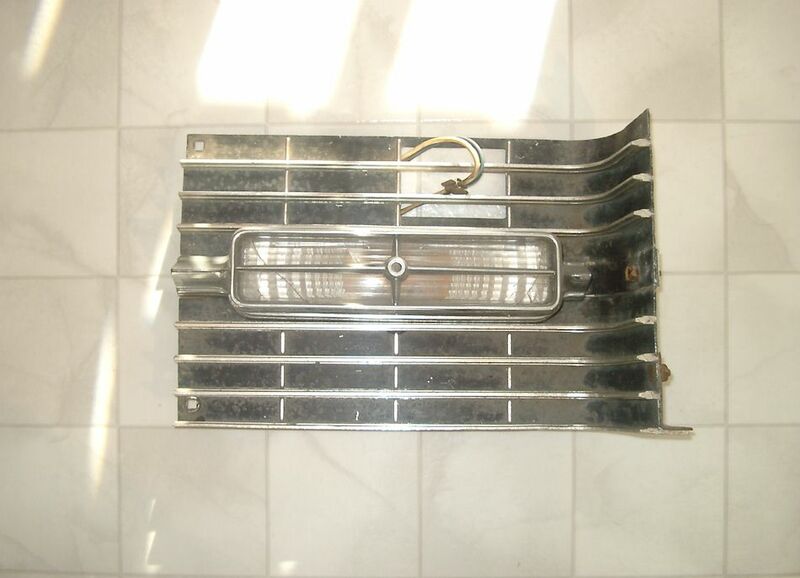 Austin Healey Grille 100/6 - For parts or restoration. Emblem aged. support bars poor or missing. 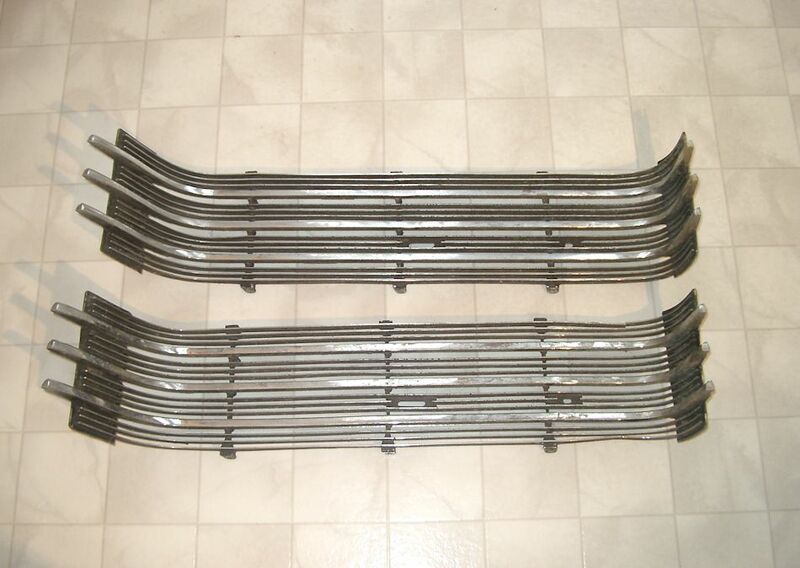 Horizontal vanes good - $SOLD. 1987 BMW 325e E30 Rear Exhaust System - Aged but still useable. 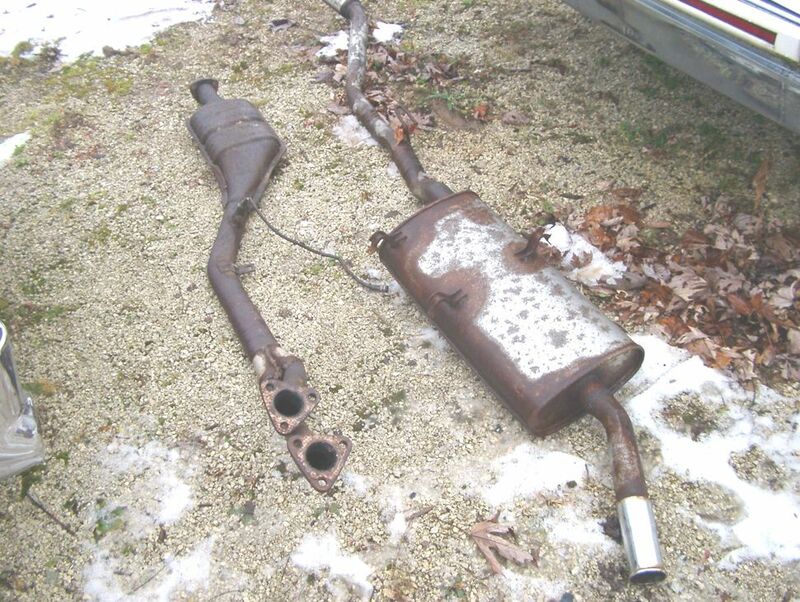 Rear half including muffler (catalytic converter already sold) - $20. 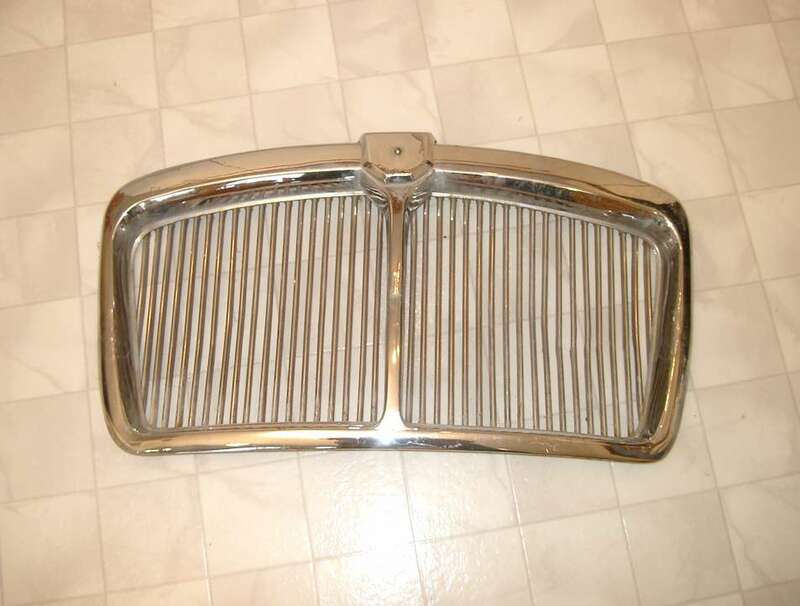 1960 Buick Complete Grille Assembly - In good original condition with some pitting in spots. Paint loss on emblem - $50. 1963 Buick LeSabre Headlight Bezel / Door RH - Some light pitting and a small repaired crack on bottom edge. Includes insert - $10. 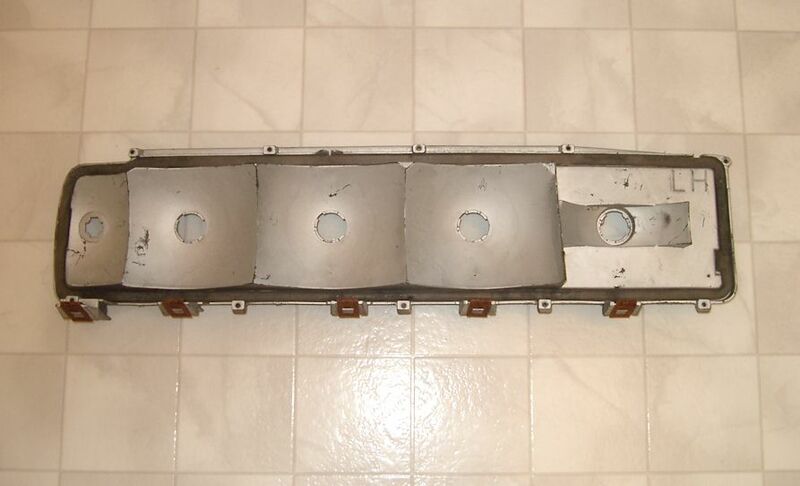 1964 Buick Wildcat Grille Assembly - For parts or restoration. 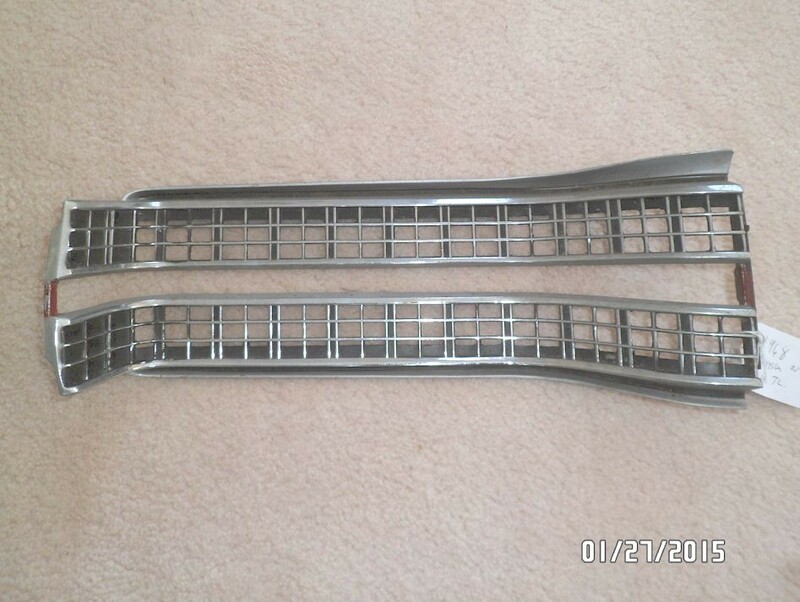 Cracks in die cast sections, bends to grille, no emblem - $30. 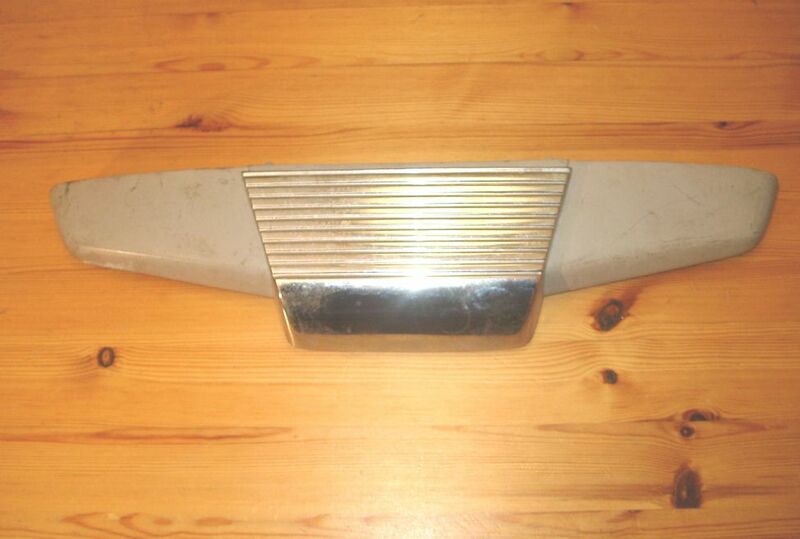 1965 Buick LeSabre and Electra Side Marker Light - Pt. #5956402. One ding at front. One stud broken. Lens good - $SOLD. 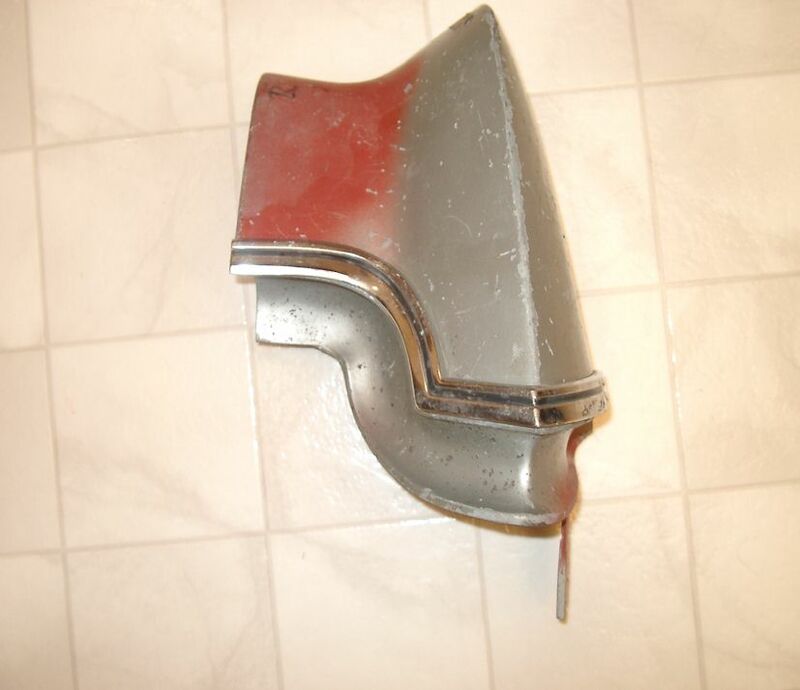 1965 Buick Special Front Fender Trim Spear - In good original condition. Part # 1372508 - $10. 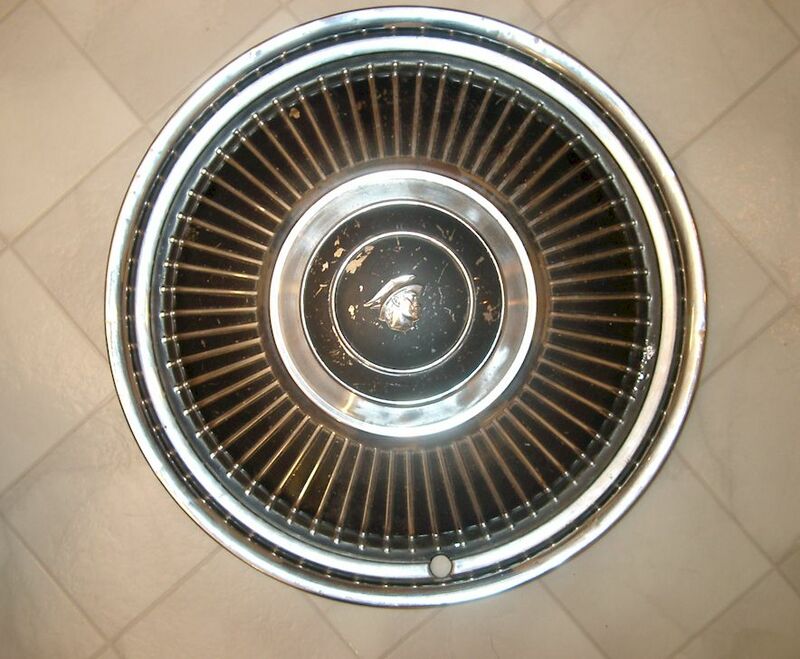 1965 Buick Wildcat Hubcap - OEM original hubcap in driver condition. One small ding, a scrape and some paint loss - $10. 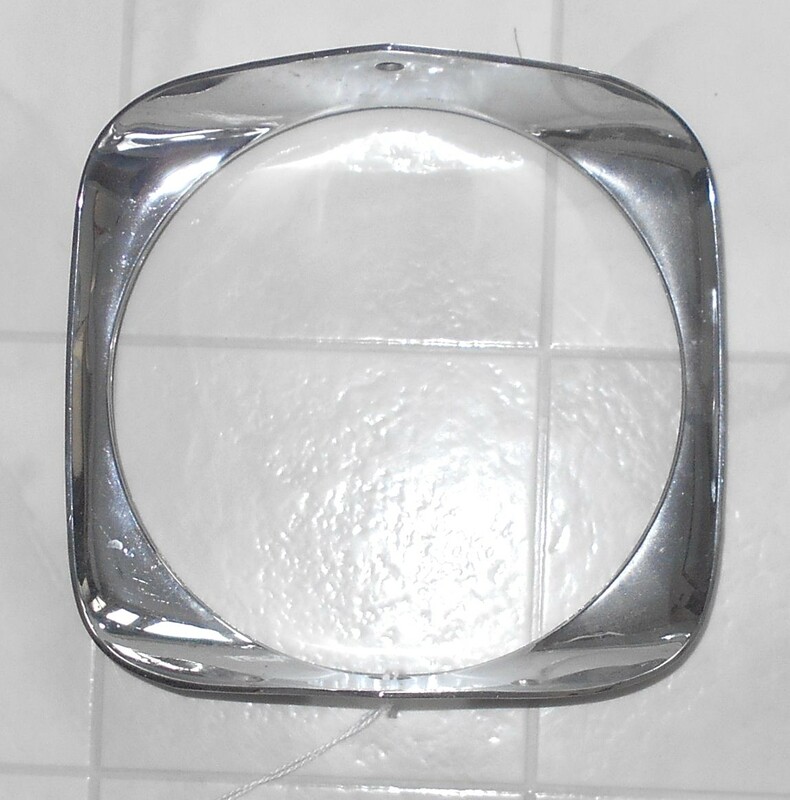 1966 Buick Electra Headlight Bezel - Part # 1374303. In good driver condition. Some minor pitting - $10. 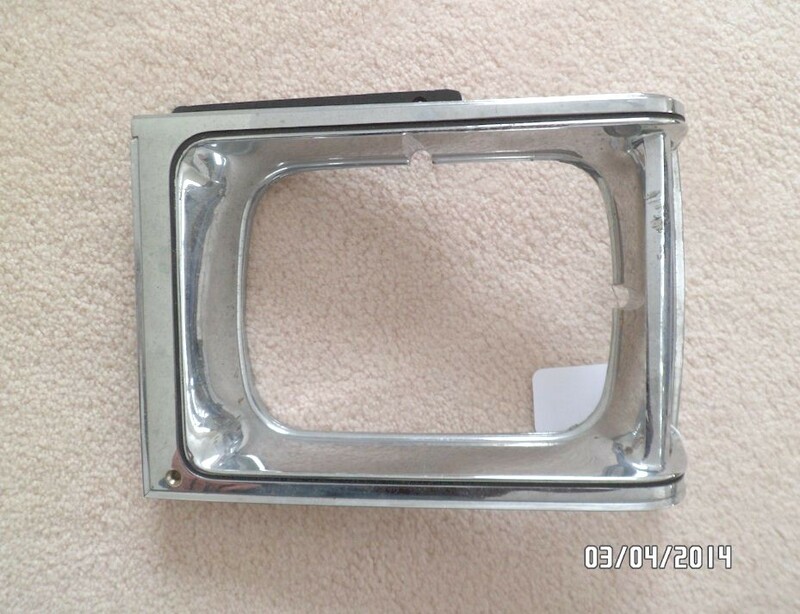 1966 Buick Electra and LeSabre Headlight Bezel LH - Part # 1374297. In good driver condition. Some minor pitting - $10. 1967 Buick Riviera Grille - Pt. # 1349467. In aged original condition with some minor cracks and pitting. Good enough for a driver - $40. 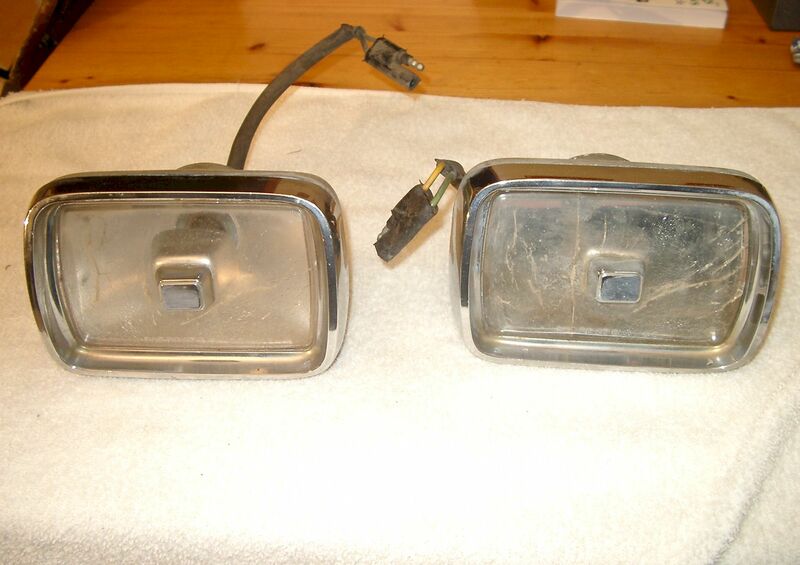 1967 Buick LeSabre Taillight Assemblies - Two left side units in aged original "driver" condition. Some accent paint is peeling. $20 each. 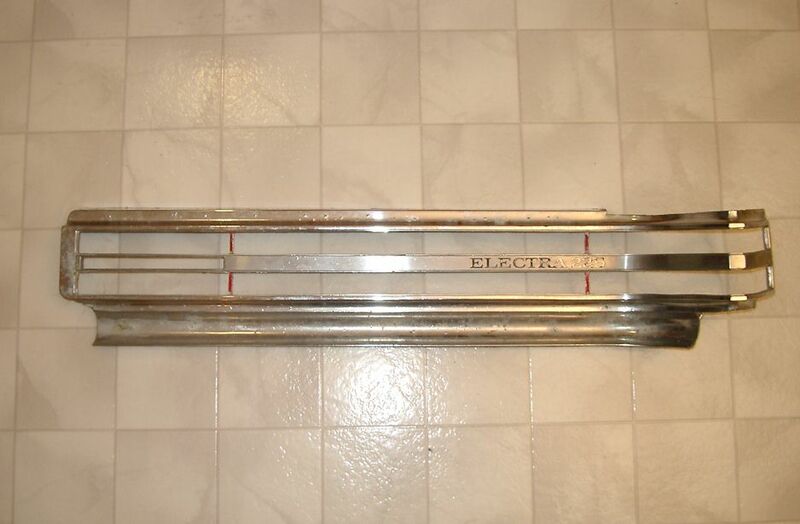 1967 Buick LeSabre Taillight Frames Only - Two right side units in aged original "driver" condition. $10 each. 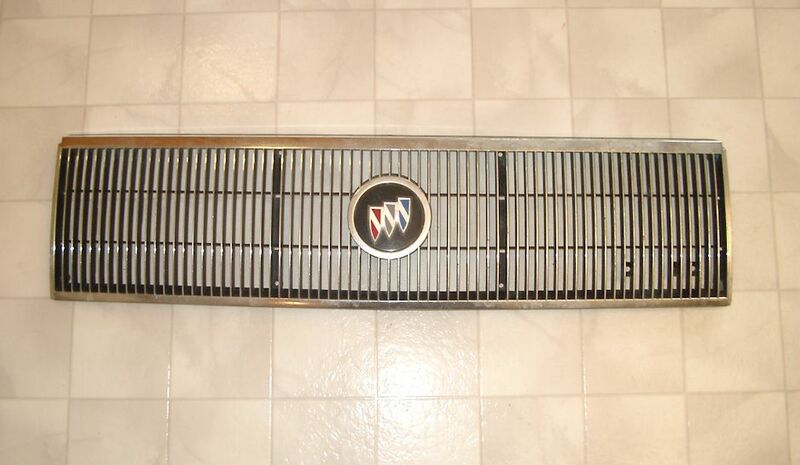 1967 Buick Wildcat Grille - Pt. # 9708831. In good original "driver" condition. One minor bend to a fin, some minor corrosion - $80. 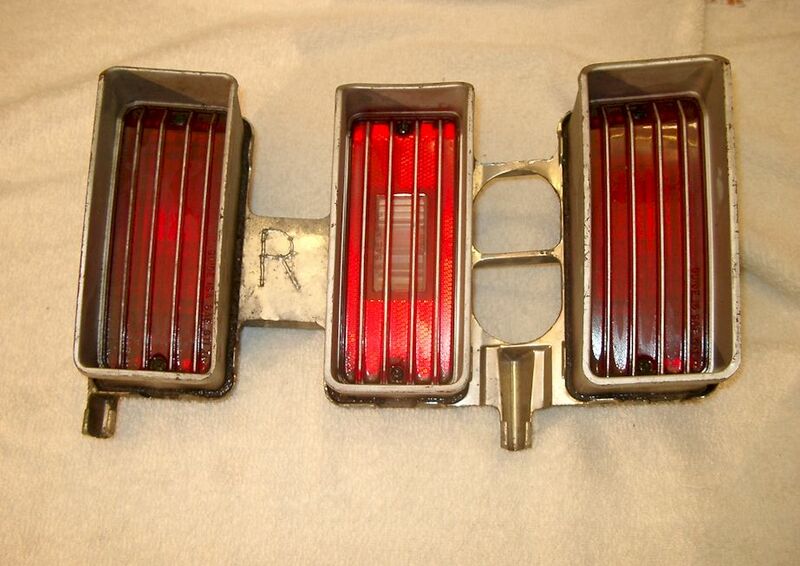 1967 Buick Wildcat Taillight Assemblies - Left and right in aged original "driver" condition. $20 each. 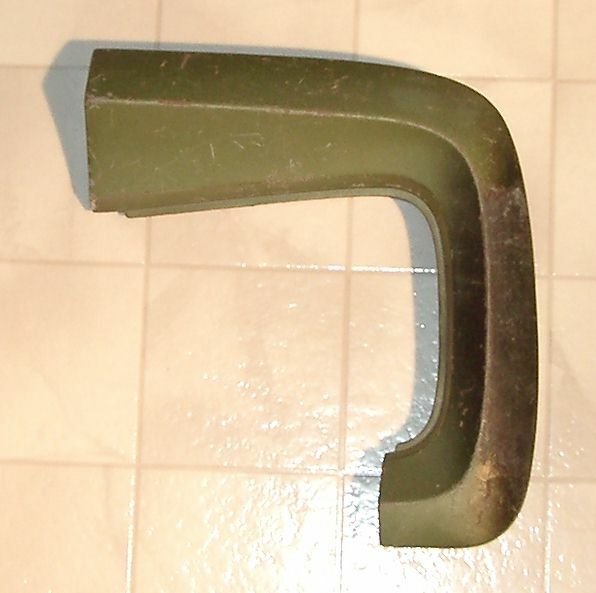 1967 Buick Wildcat Left Lower Fender Trim - pt. # 1379185. Will need accent paint reapplied. Some pits on bottom edge - $SOLD. 1967 Buick Wildcat Right Lower Fender Trim - pt. # 1379184. In good original condition. Some chips and scratches - $SOLD. 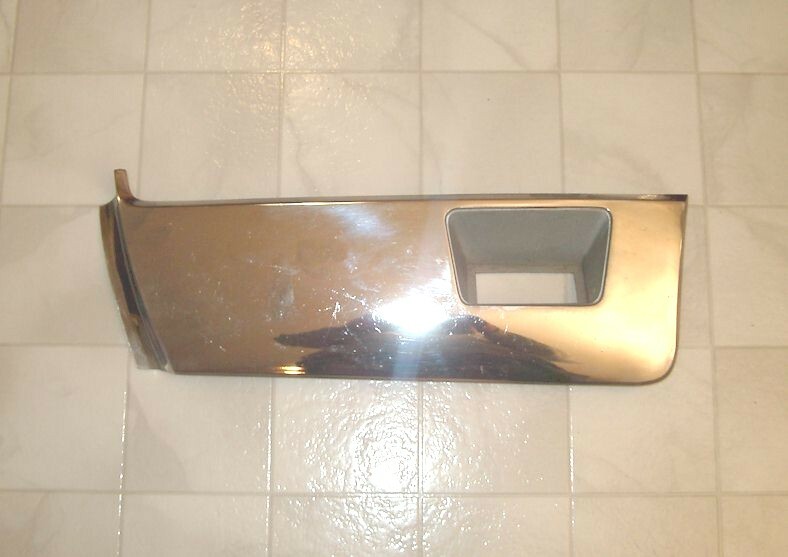 1968 Buick Electra/Wildcat/LeSabre Fender Trim - Pt. # 1382139 & 1382138. In good original condition with some wear - $SOLD. 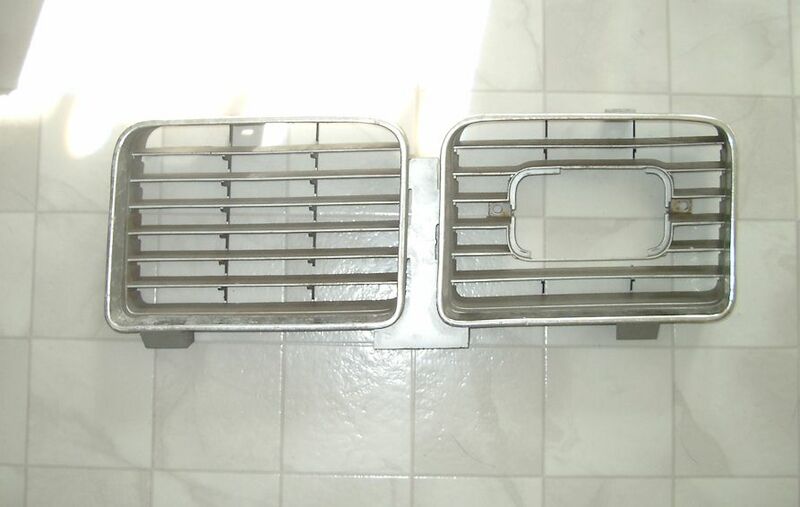 1968 Buick Electra Grille Right Hand - Right hand pt. # 1382038 in good original condition. 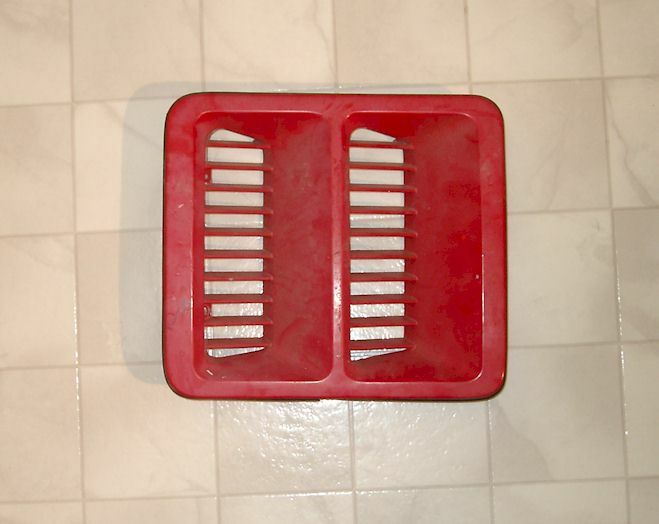 Bottom unit in picture - $30. 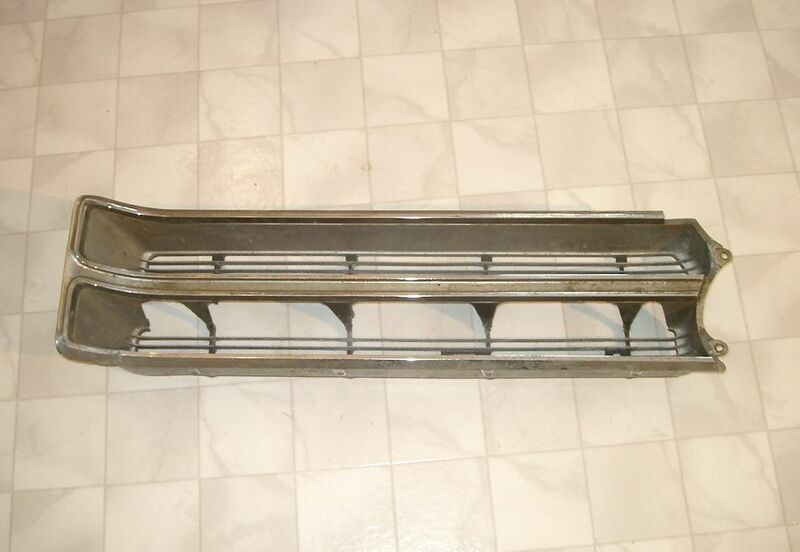 1968 Buick Electra Grille Left Hand - Pt. # 1382039. Has professionally repaired crack but not noticeable from front. Top unit in picture - $15. 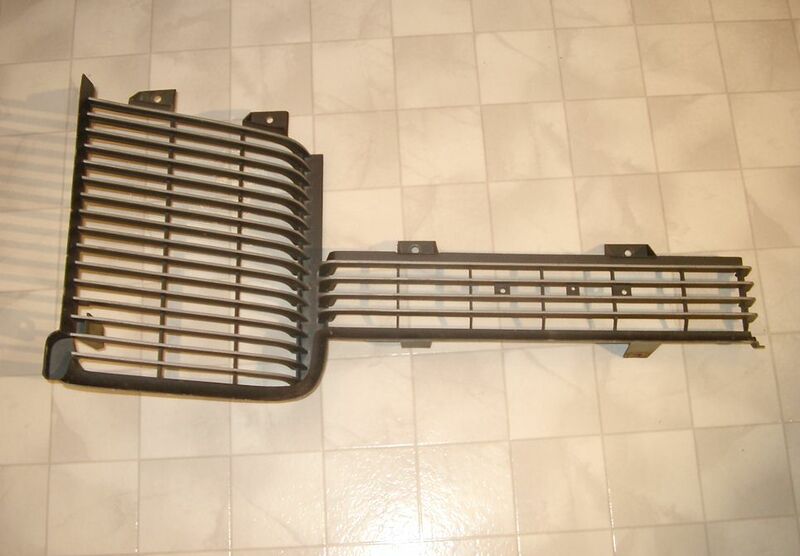 1968 Buick LeSabre Grille LH & RH - Pt. # 1382135 and 1382134. 3 LH, 1 RH. Some repaired cracks. Driver condition - $15 each. 1968 Buick Electra Left Hand Parking Light - Guide 46, part # 5959681. In good original condition with some light scratches - $5. 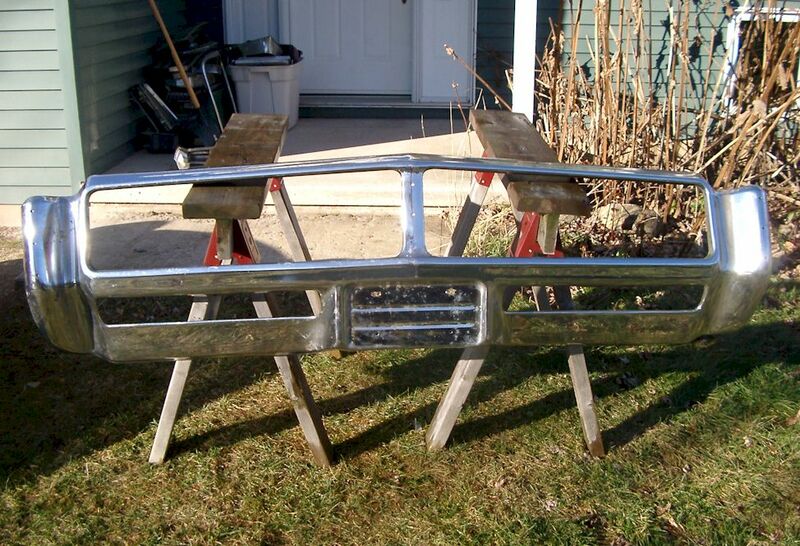 1968 Buick LeSabre Tail Light Frame - In good condition. Accent paint has been refinished. Part # 5960160 - $SOLD. 1968 Buick Wildcat Grille RH - Pt. # 9713458. In aged original condition. Plastic mesh broken. Slight bend to center bar - $SOLD. 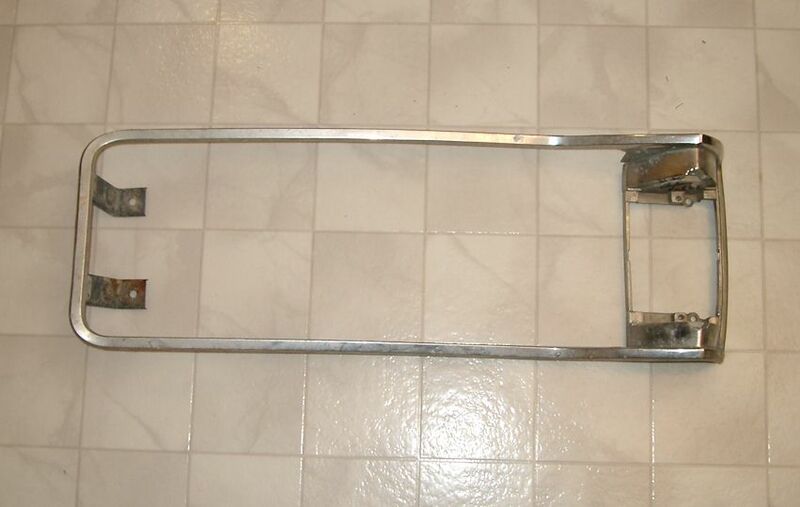 1969 Buick Wildcat Rear Fender Extension RH - Part #779977. In good restorable condition. One repaired stud. Includes trim - $SOLD. 1969 Buick LeSabre, Electra, Wildcat Front Bumper - Small dent & scrape on right side. Some pitting. Acceptable condition for a driver - $50. 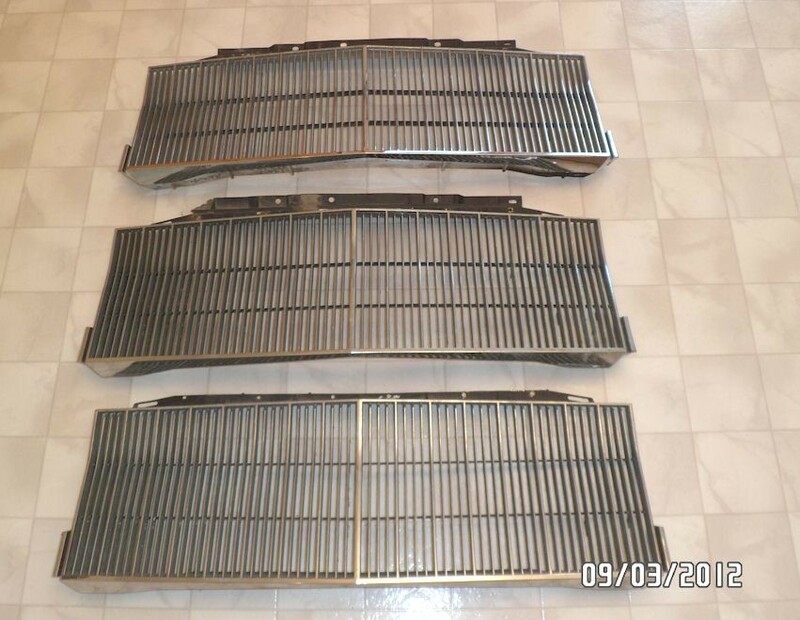 1969 Buick LeSabre Grilles - 3 left, 2 right part # 9716895 and 971 6894. In driver condition - $20 each. 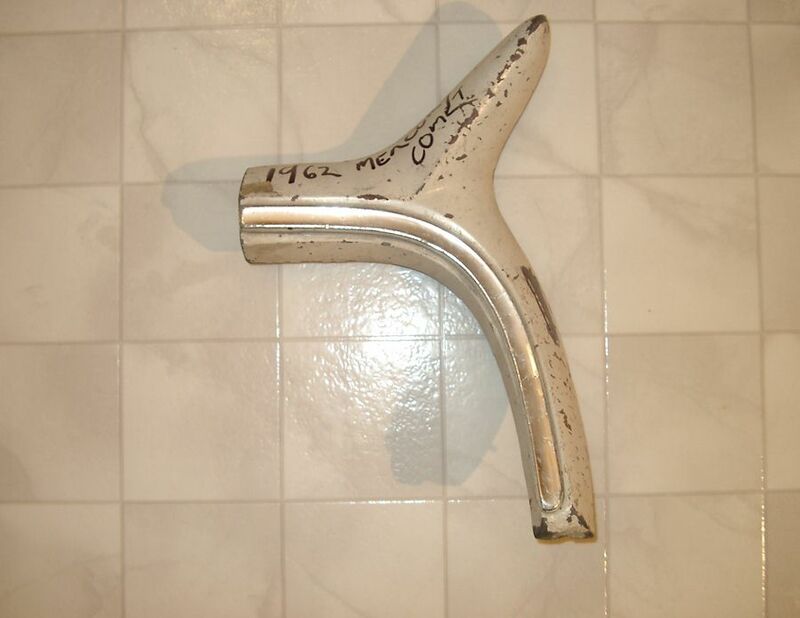 1969 Buick Electra Front Fender Extension RH - In good original condition. Part # 1385312 - $10. 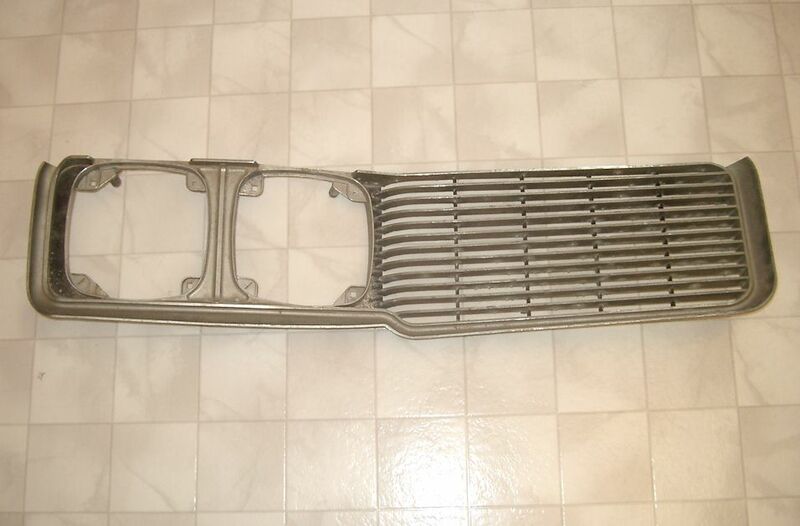 1969 Buick Electra Grille Right Hand - Part # 1385196. In good driver condition. Has a repaired crack - $20. 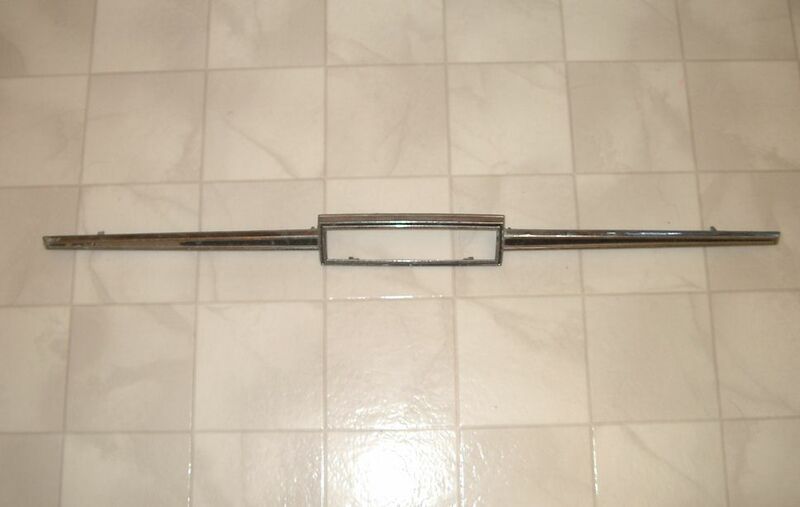 1969 Buick Wildcat Grille Left Hand - Part # 1385195. In good driver condition. - $20. 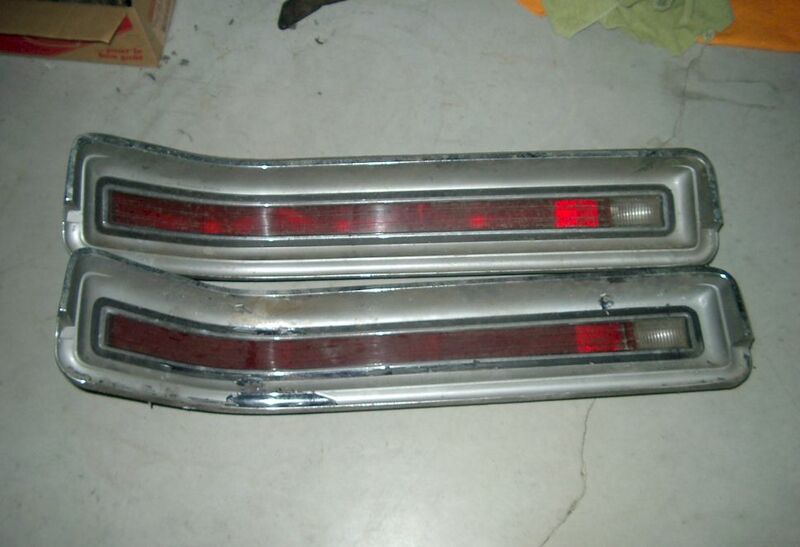 1969 Buick Full Size Taillight Bezels - LH Pt. # 5961461 in good original condition $20. RH Pt. # 5961966 missing one vertical bar - $10. These are different from each other so please check part numbers and photos to confirm application. 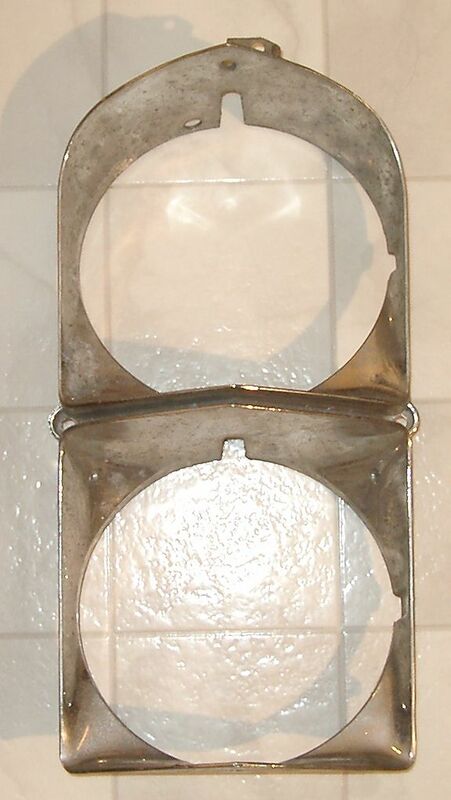 1970 and 1971 Buick Electra, Wildcat, LeSabre Headlight Bezel - Part # 1231710. In driver condition with some pits, a ding and a broken registration tab - $10. 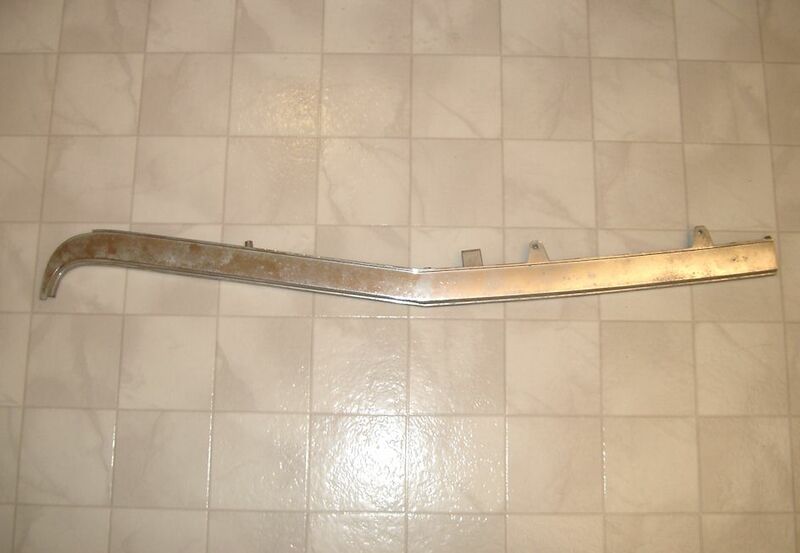 1970 to 1972 Buick Skylark Quarter Panel Extension LH - Part # 8782579. Needs finishing. Has a couple of repaired cracks - $10. 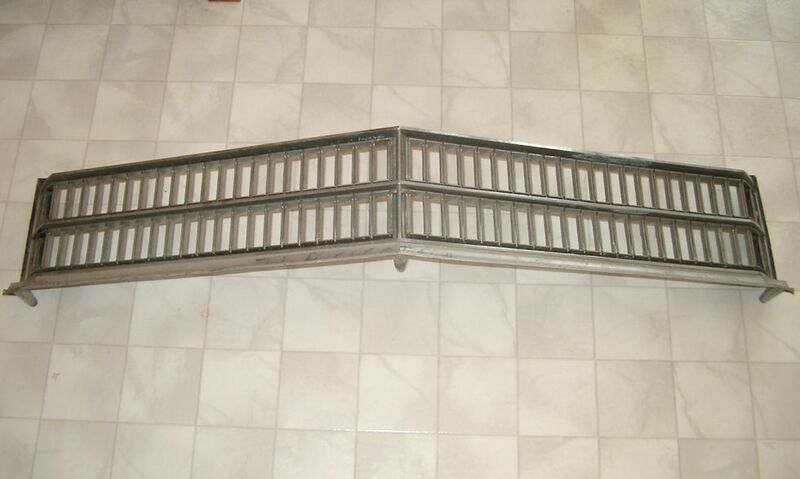 1970 Buick Wildcat RH Fender Louver Trim - In aged original condition. Paint has many chips. Chrome good with no pits. pt. # 1232782 - $10. 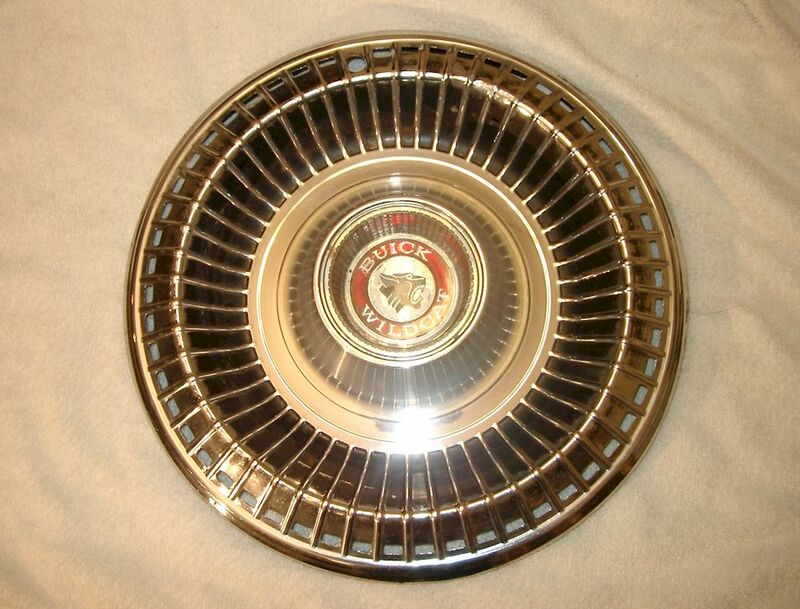 1970 Buick LeSabre Grille RH - Pt. # 1231796. In aged condition with a repaired crack. Twisted as well but should straighten - $5. 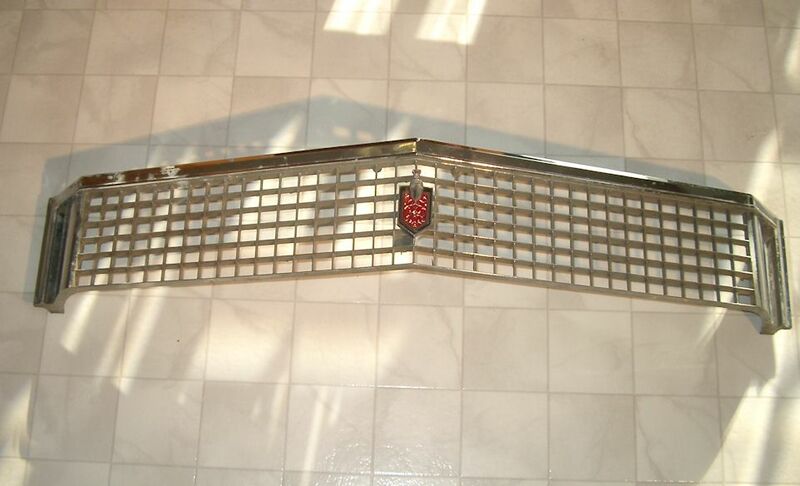 1970 Buick Wildcat Grille LH - Pt. # 1231799. In aged original condition with some pitting - $20. 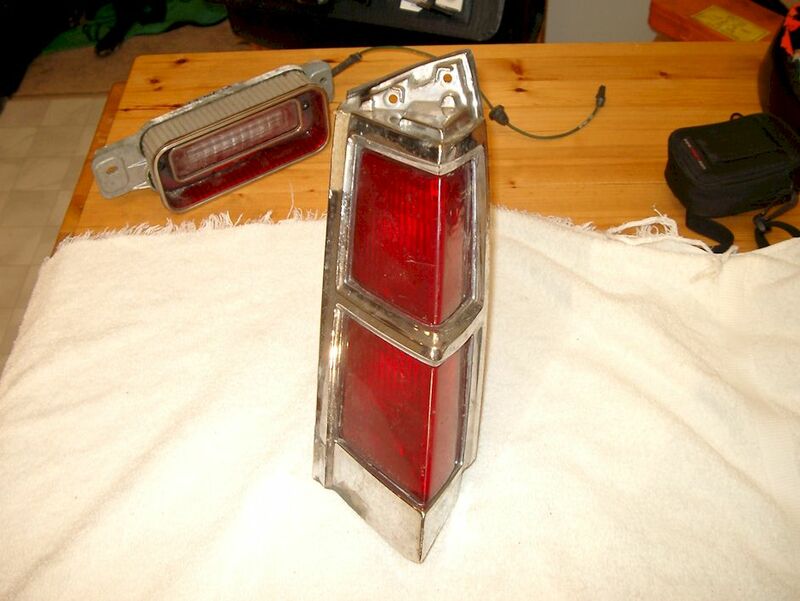 1971 Buick Centurion Tail Light Lens Left Hand Side - In good original condition with a few light scratches - $10. 1971 Buick Centurion Tail Light Assembly Right Hand Side - In good original condition with a few light scratches to painted frame - $SOLD. 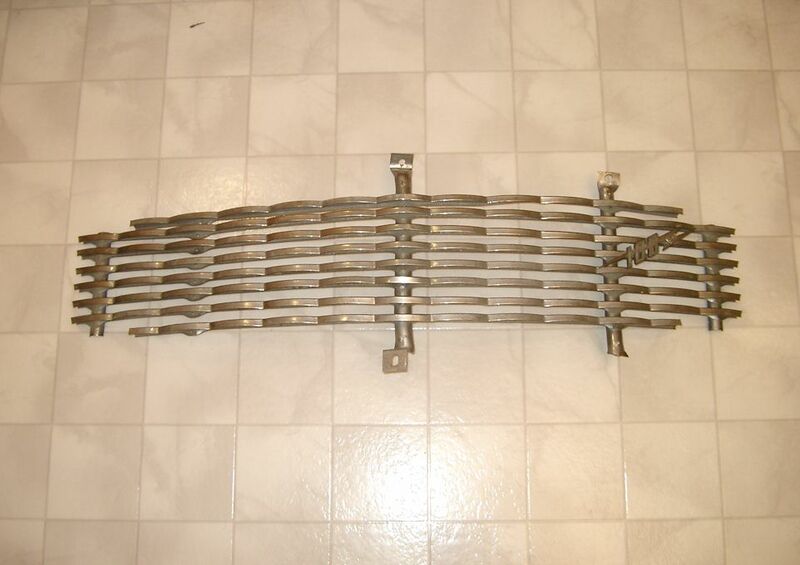 1971 Buick Electra Grille - Part # 1234347. In good driver condition. A couple of repaired cracks - $20. 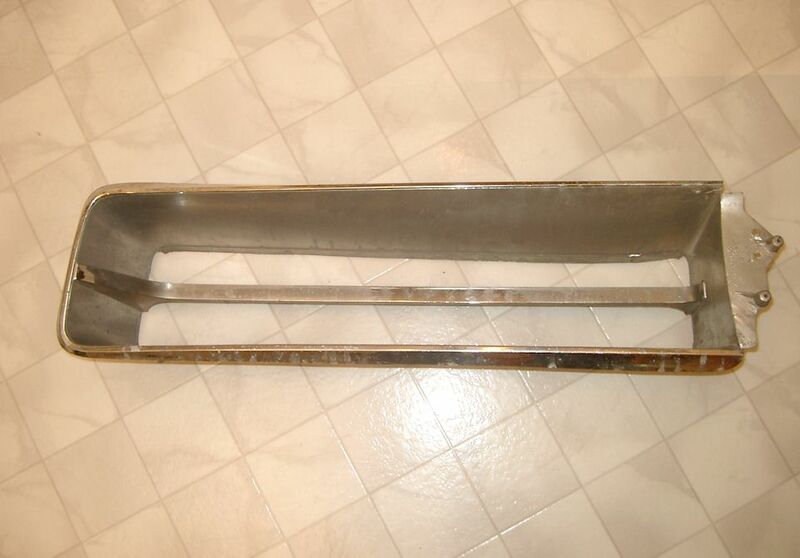 1971 Buick Electra Lower Grille Left Hand - Part # 1234361. In very good condition. No pits or oxidation - $20. 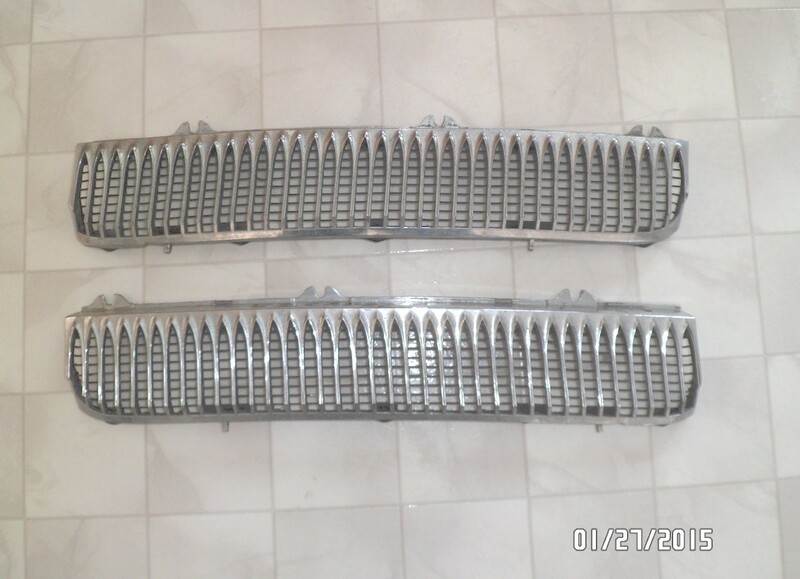 1972 Buick Electra Grille - In good overall condition - $20. 1972 Buick Electra 225 Taillight Trim RH - Part #5965212/5965046. In driver condition with some pitting and a minor crack - $10. 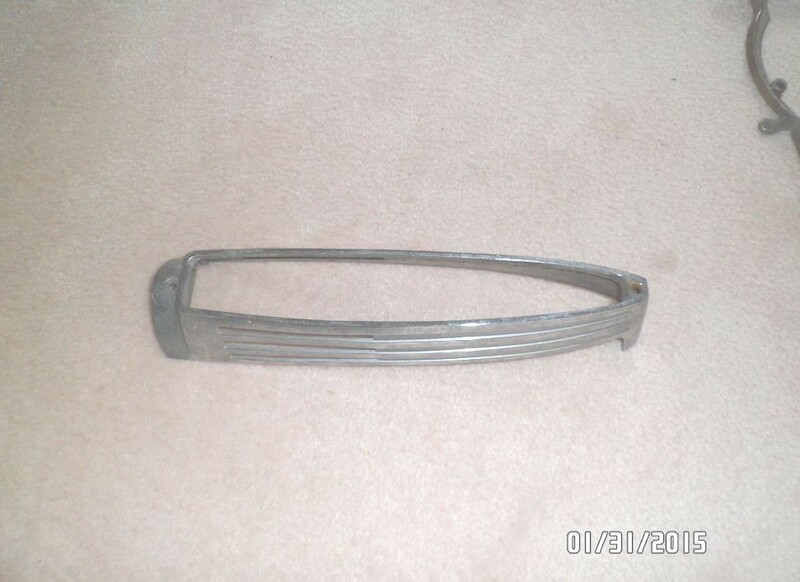 1972 Buick Skylark Hood Trim - Pt.# 1239087. Cracked and repaired but crack still visible in chrome area. Studs good. Good for a driver - $10. 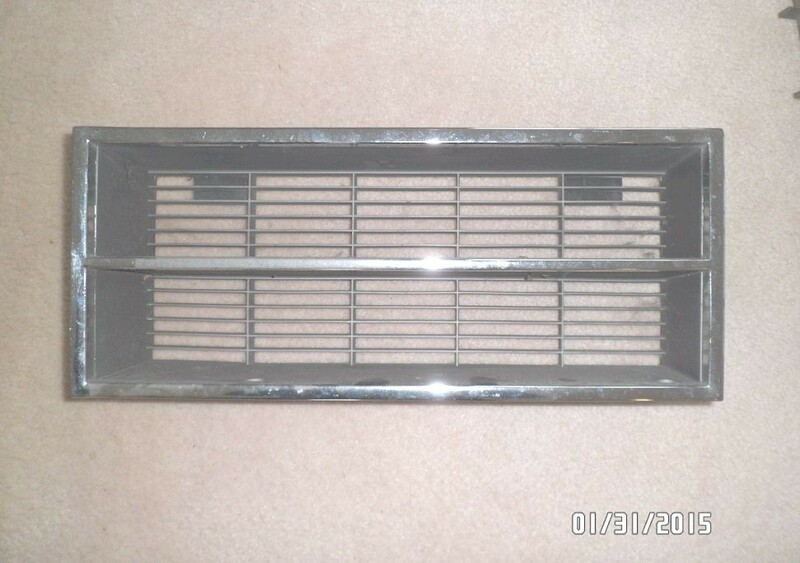 1974 Buick LeSabre Grille - Pt.# 9672480. In driver condition with a professionally repaired crack at its top centre - $20. 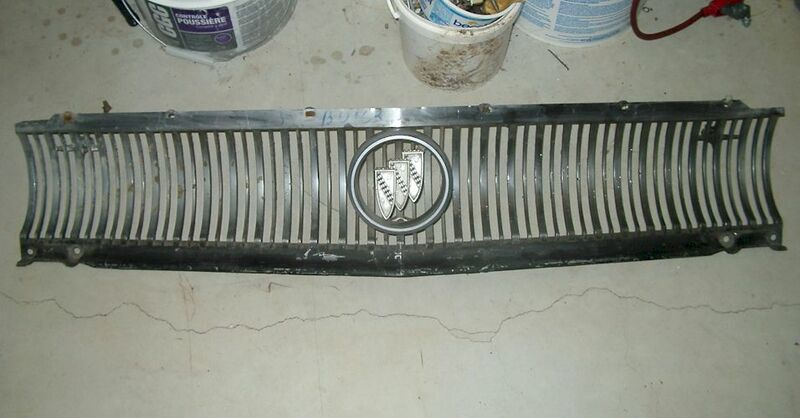 1975 Buick Riviera Grille - In good original condition - $50. 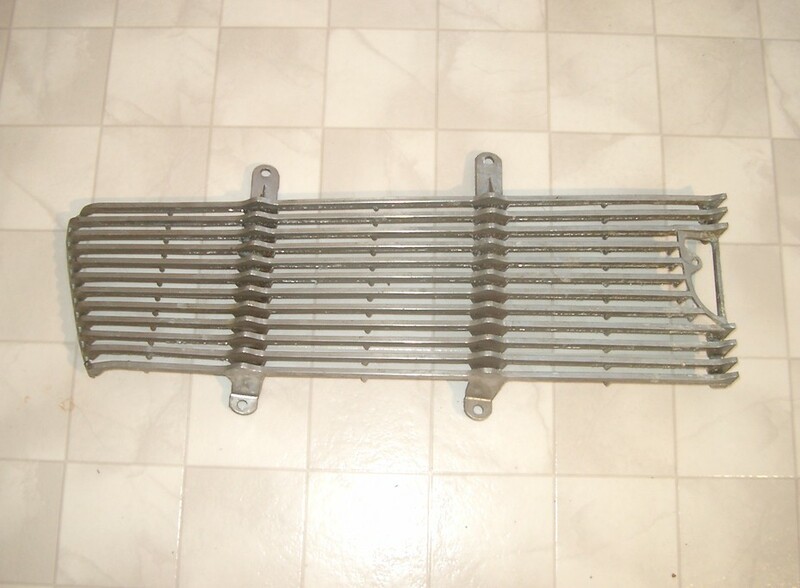 1976 Buick Century Grille - Part # 1250287. In driver condition with a couple of repaired cracks - $20. 1978 Buick Skylark Taillight Housing LH - part # 5969829. No cracks but some scratches in silver paint - $5. 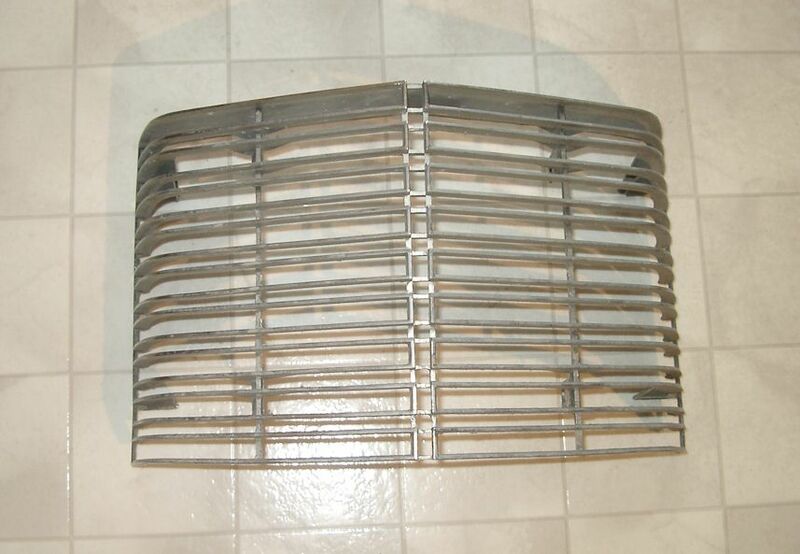 1978 Buick LeSabre Grille - Part # 1255750. In aged original condition but very presentable. Some chrome blistering in spots - $SOLD. 1979 Buick Park Avenue/Electra Headlight Bezel LH - Part # 1260271. One scratch in chrome and one broken registration tab - $10. 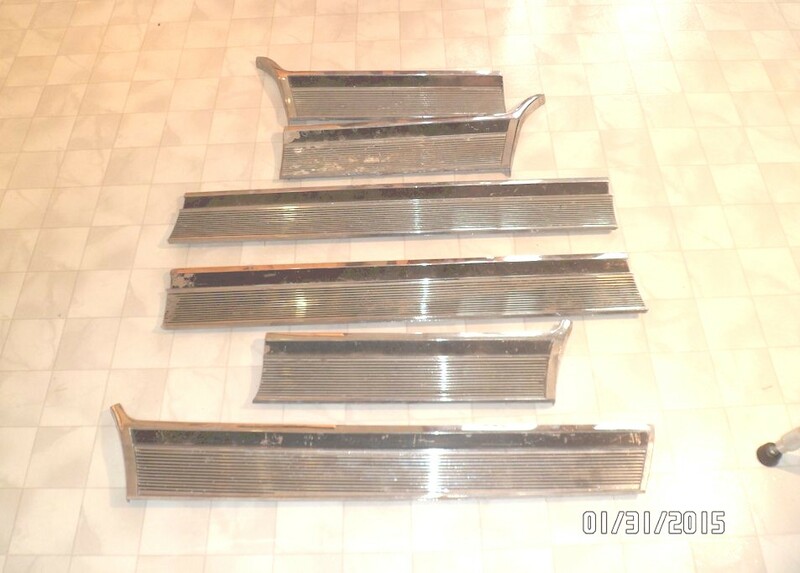 1980 Buick Regal Grille Trim - Part # 25502030. In driver condition with a few pits. Studs good. Needs polish - $10. 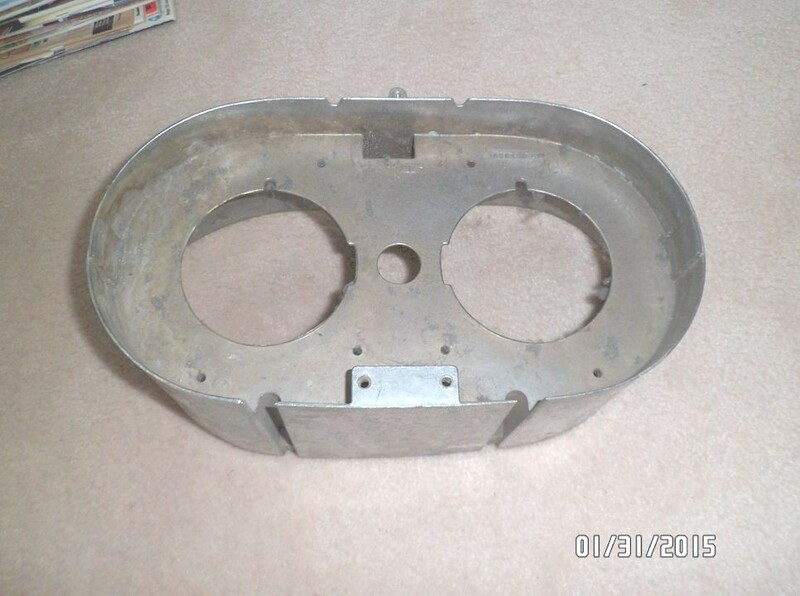 1980 and 1981 Buick Skylark Headlight Bezel RH - Part # 1258660. In good driver condition. Needs a polish - $SOLD. 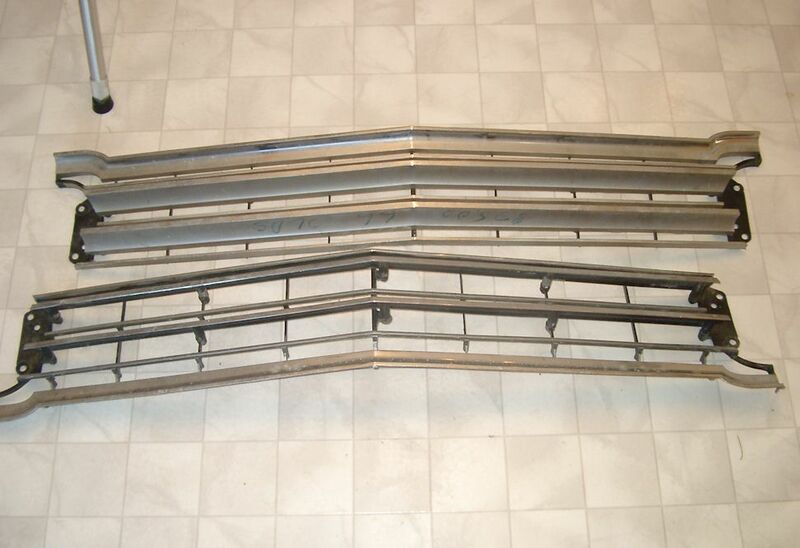 1981 to 1988 Buick Electra Grille - Part # 25505919. In aged condition with repaired crack. 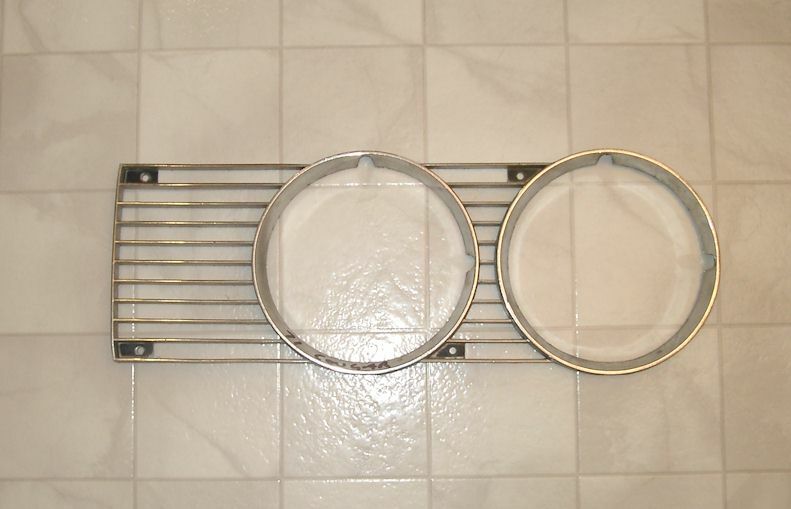 Includes upper and lower bracket and shroud - $20. 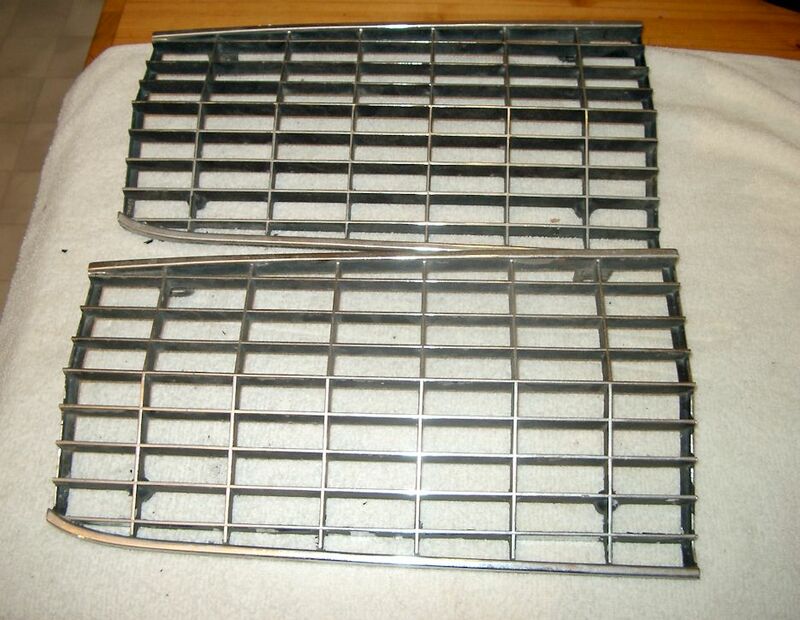 1981 Buick Regal Grille - Part # 22505321 & 25504768 on part. 3 available - One very good - $50. Two fair to good - $20. 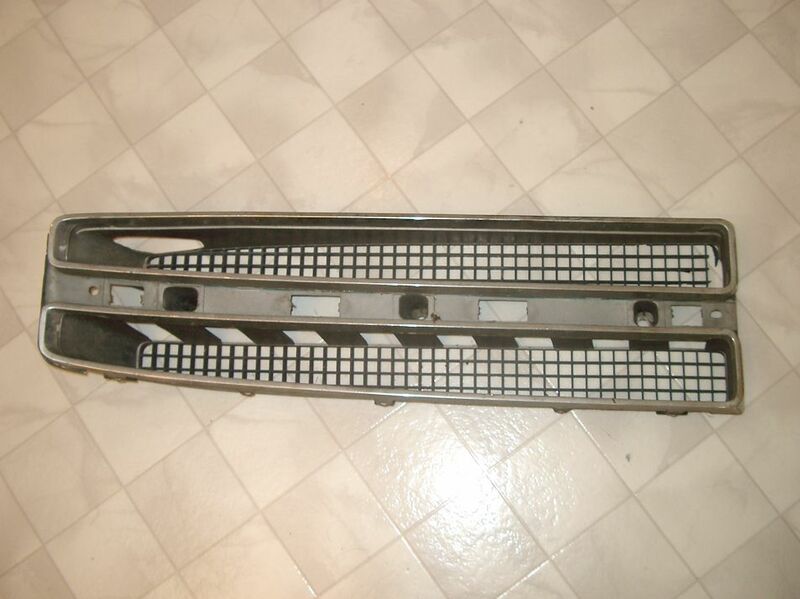 1982 Buick Regal Grille - Part # 25509401. 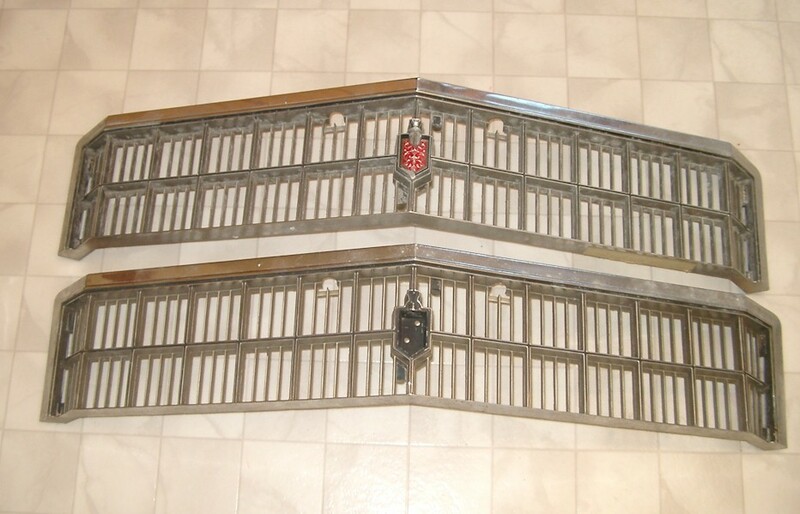 Two available - One very good but has cracked mounting tab - $40. One good no cracks - $40. 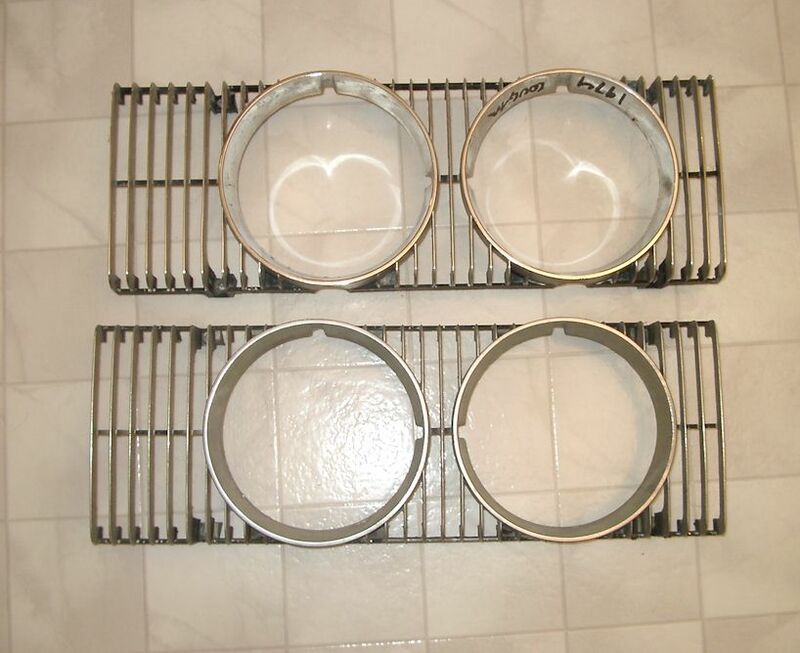 1982 Buick Skylark Headlight Bezels Left & Right Set - Part #'s 10003410 & 10003409. Appear to be NOS but showing some shelf wear - $20 each or $30 pair. 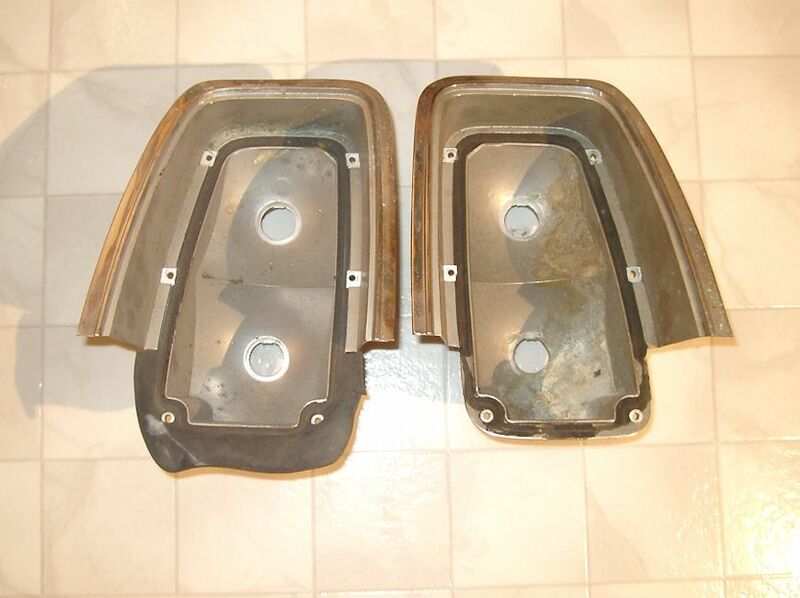 1958 Cadillac Cowl Vents - Part # 4238730 and 423873. In good driver condition with some minor pitting - $40 each. 1959 Cadillac Center Bumper - Some surface rust and pitting. One crack on bottom center. 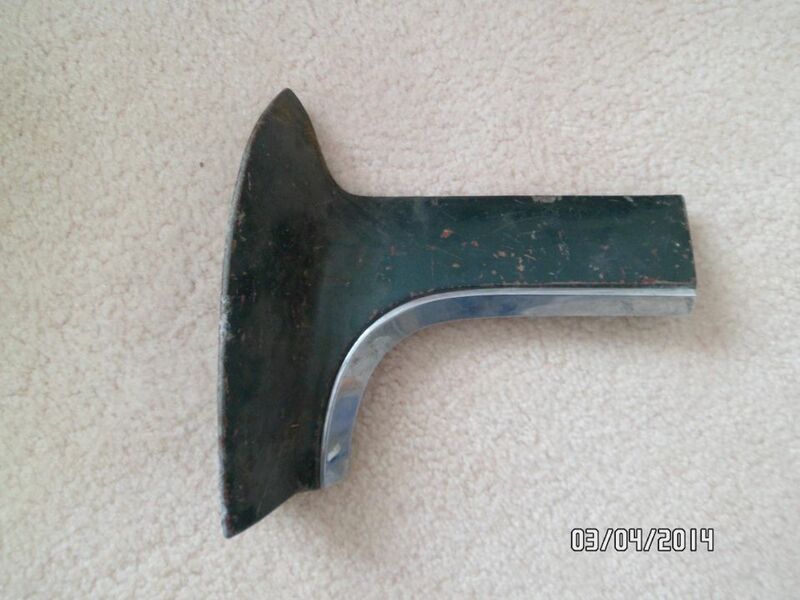 Good enough for a driver (unpolished in picture)- $50. 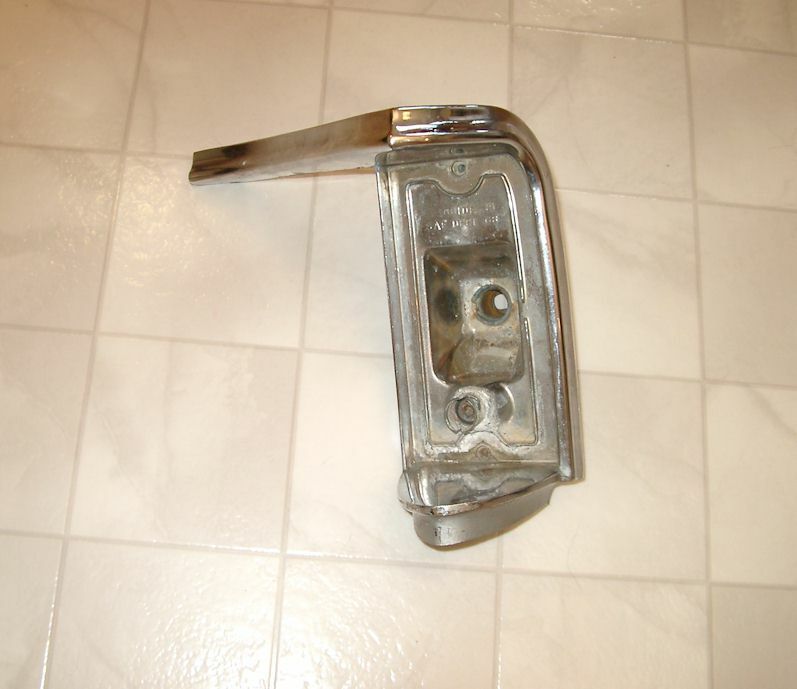 1964 Cadillac Right Front Turn Signal Assembly - Chrome is in generally good condition with no serious pits or oxidation - $10. 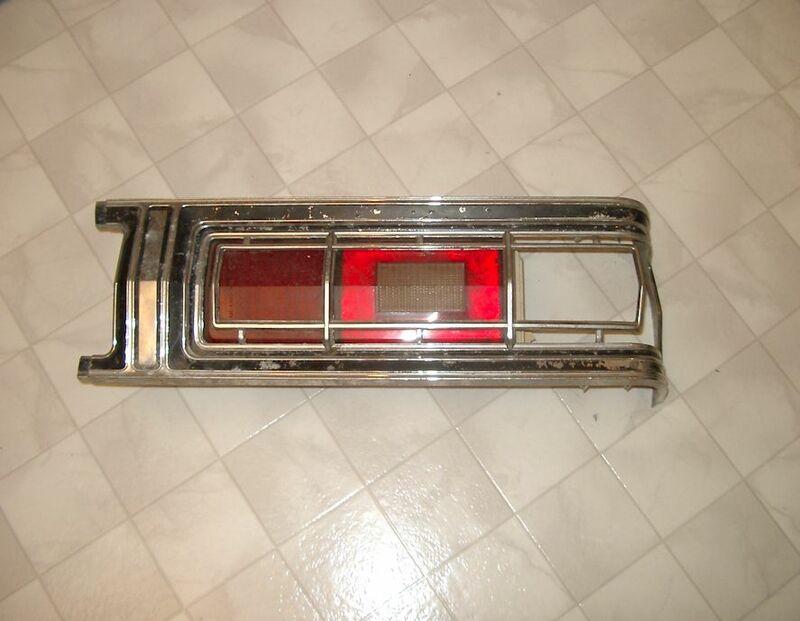 1964 Cadillac Right Front Side Marker Light - Lens is cracked. Chrome good. Missing one screw - $10. 1966 Cadillac Front Turn Signal Assembly LH - In aged original condition. Lens cracked, balance good - $SOLD. 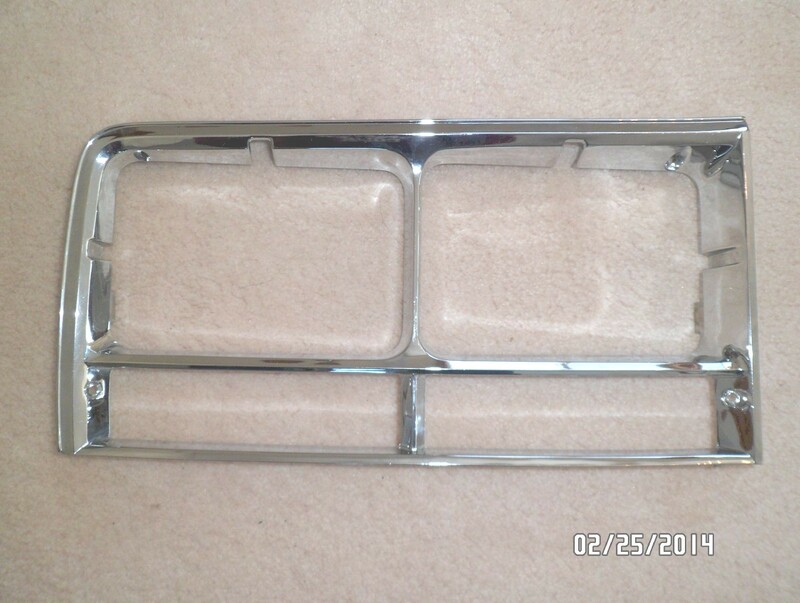 1966 Cadillac Lower Headlight Bezel - Part # 1485309. In good original condition - $20. 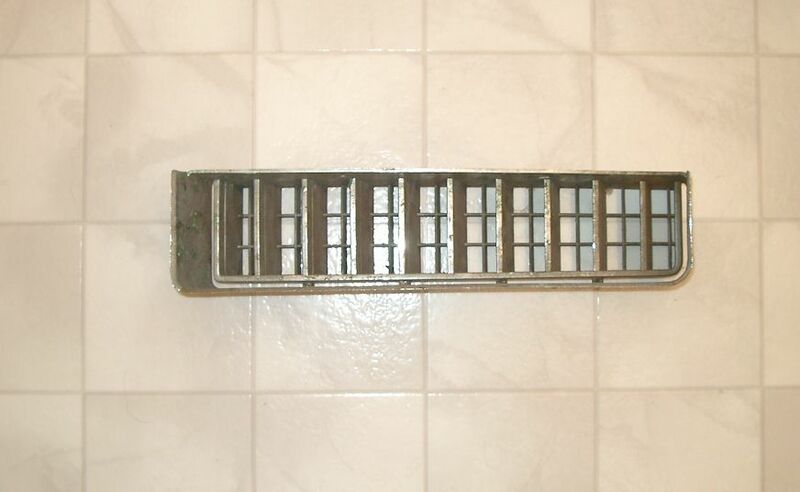 1966 Cadillac Upper Headlight Bezel - Part # 1485308. In aged original condition with some minor pits - $10. 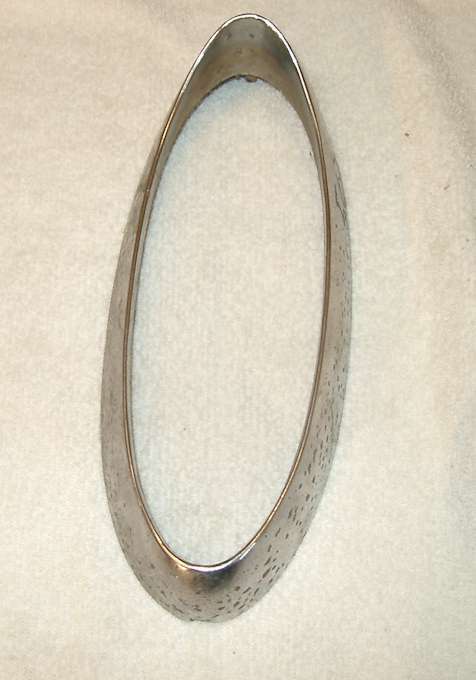 1968 Cadillac Deville Headlight Bezel - Part # 1490743. I believe his is LH side but please check photo. In aged but useable condition - $SOLD. 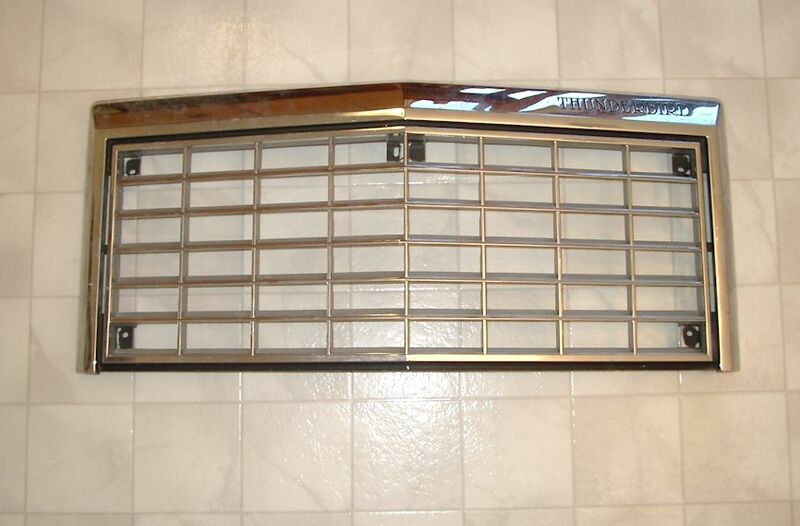 1969 Cadillac Eldorado Upper Center Grille - In good original condition. Some minor scrapes. No emblem - $50. 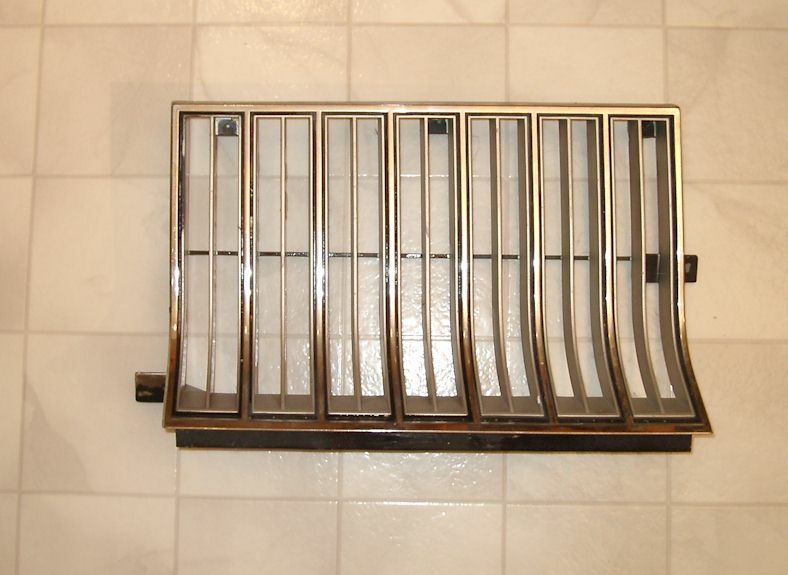 1970 Cadillac Grille Assembly - In good original condition - $50. 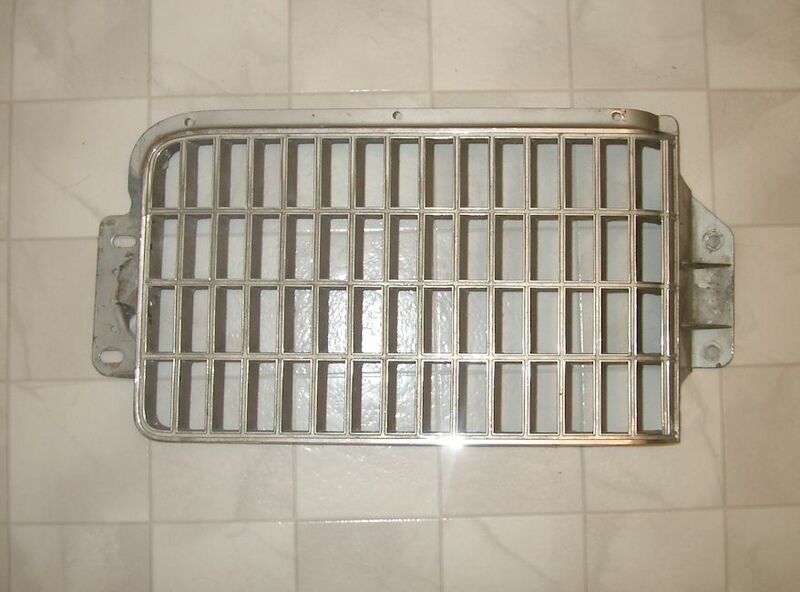 1971 Cadillac Grille Assembly - Plastic grate is in good condition. Metal surround is good except for two broken mounting tabs - $30. 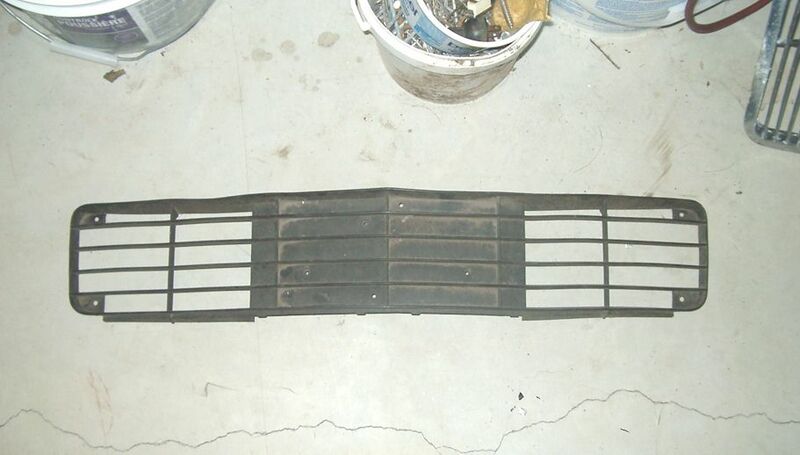 1979 Cadillac Eldorado Grille - Part # 1614444. In very good driver condition except for one vertical slat missing - $20. 1980 Cadillac Seville Grille - In poor condition but useable. Chrome peeling in spots and has a couple of repaired cracks - $5. 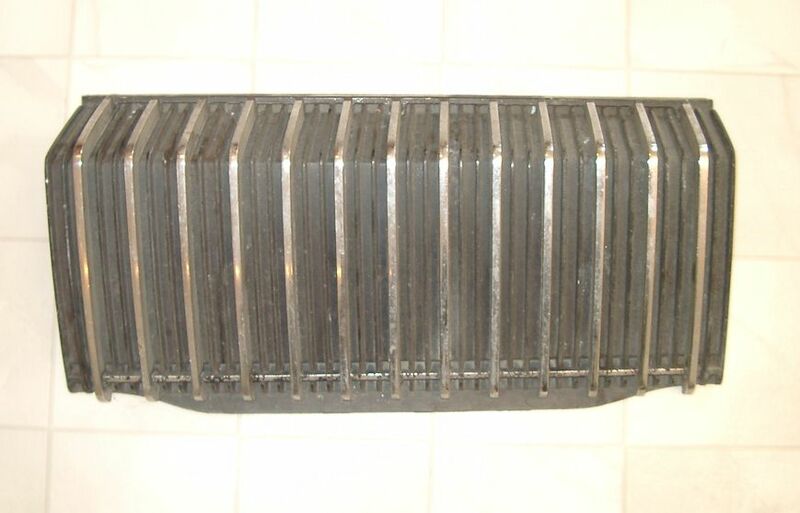 1981 Cadillac Eldorado Grille - Part number 1619200. In good condition outside of one broken mounting tab - $10. 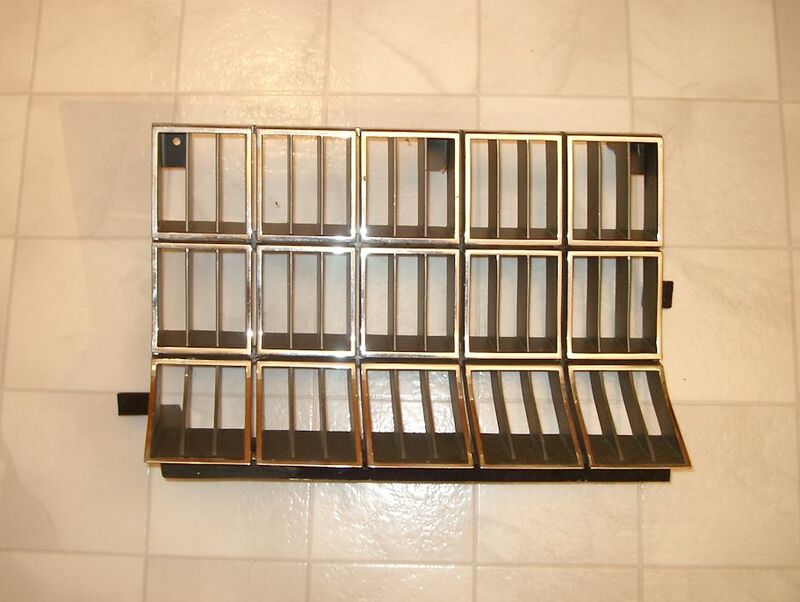 1983 to 1986 Cadillac Fleetwood Grille (RWD) - Part # 1627813. In good driver condition. 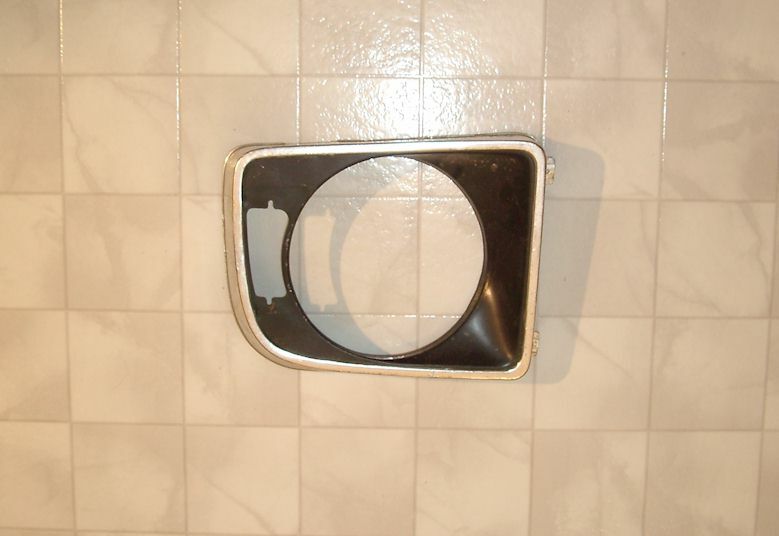 One repaired mounting tab - $20. 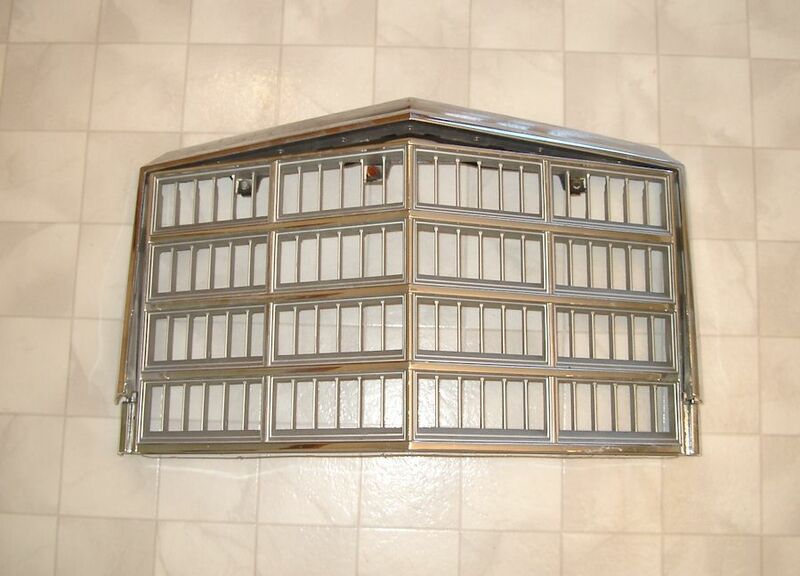 1987-88 Cadillac Fleetwood Brougham Grille - Part number 1619183. In good "driver" condition. Two repaired mounting tabs - $20. 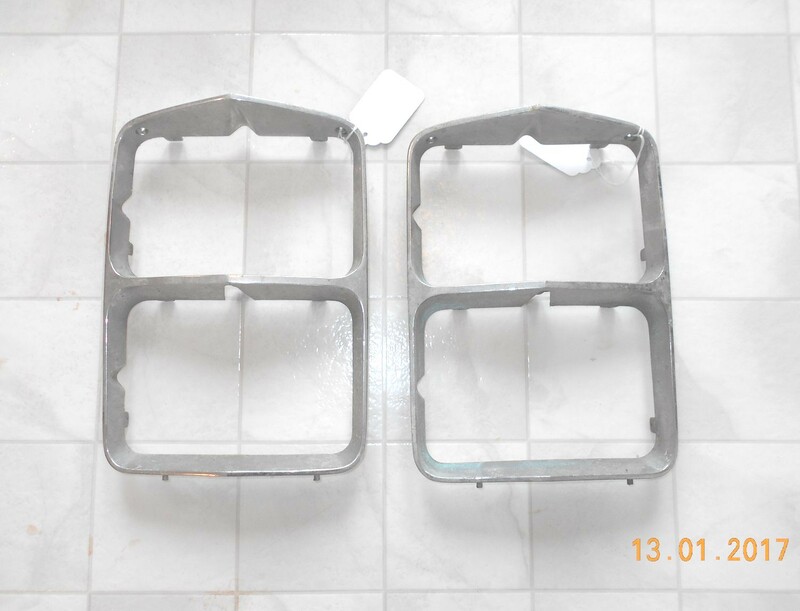 1955 Chevrolet Lower Grille Trim - Pt. # 3711158. Aged condition with a small crack and some corrosion damage. For repair or a driver - $10. 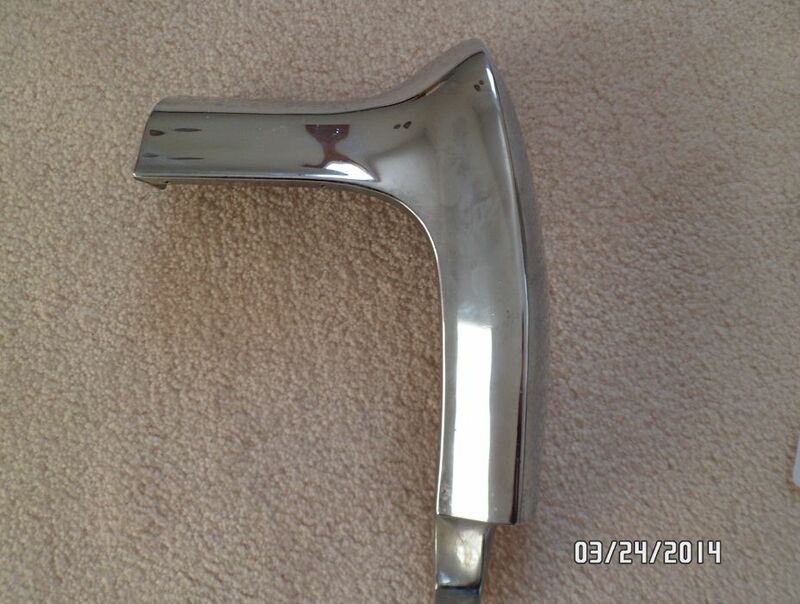 1955 Chevrolet Tail Light Trim - Needs chrome as it is currently down to the copper plating. For restoration - $5. 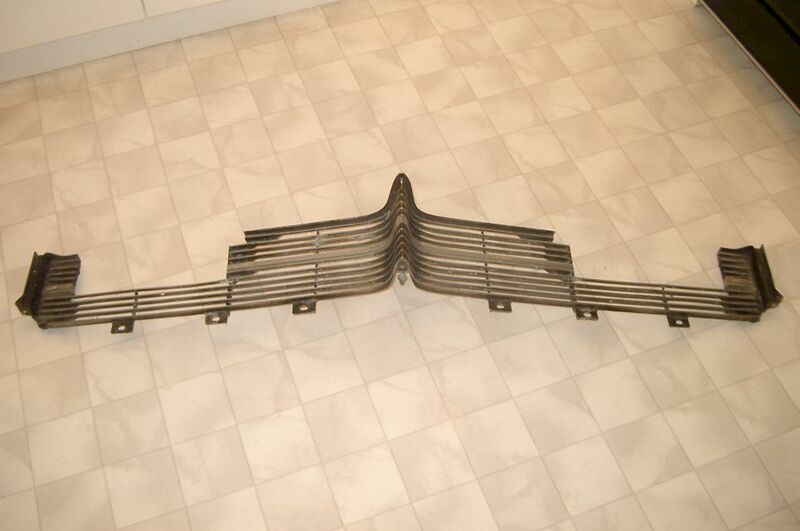 1966 / 1967 Chevrolet Corvette Front Grille - Original piece in driver condition. Pt. # 3875746. Upper mount broken - $SOLD. 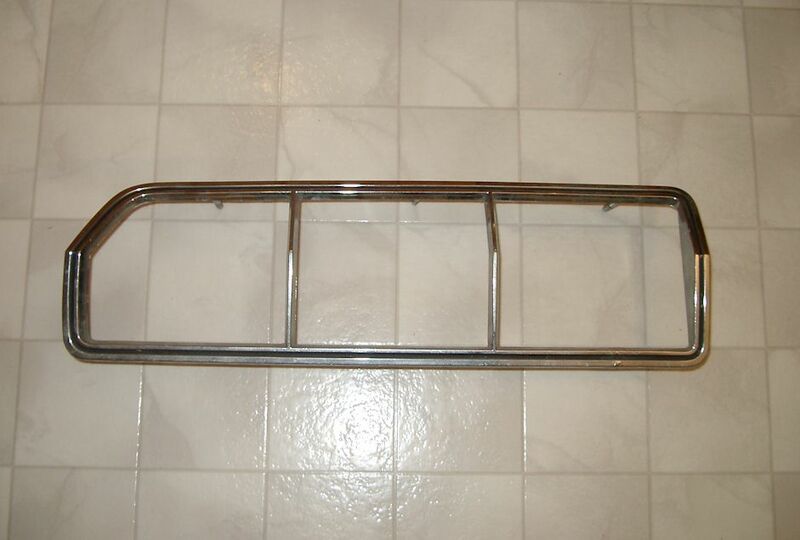 1968 Chevrolet Impala / Caprice Left Hand Rear Bumper - Very good condition. Pt. #3907667 - $SOLD. 1969 Chevrolet Biscayne Complete Rear Bumper - In good original condition. Small bend on upper lip of right side - $100. 1969 Chevrolet Impala Taillight / Reverse Light Assembly - Part # 5961662. In good driver condition. Right hand side. 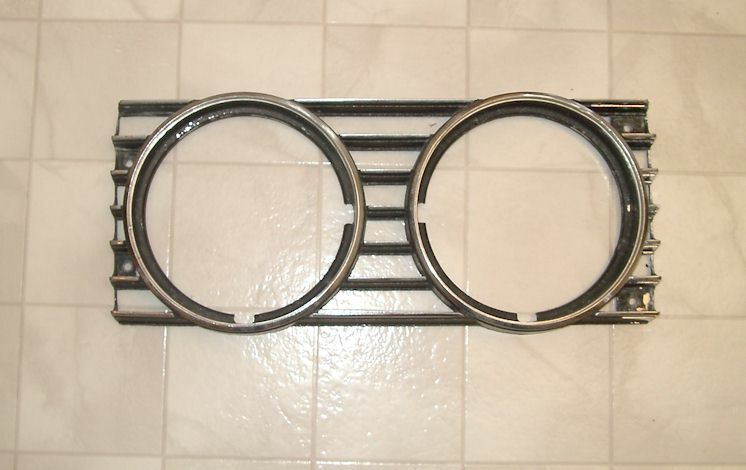 Missing outer trim ring - $10. 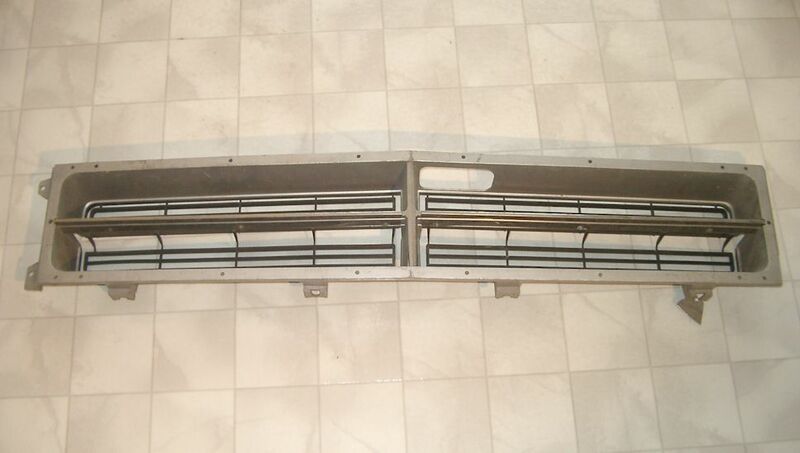 1969 Chevrolet Impala Coupe Vinyl Roof Trim RH - Part # 8727542. May be correct for 1970 also - $SOLD. 1970 Chevrolet Impala Right Taillight Assembly - Some scratching to accent paint on frames. Lenses good - $SOLD. 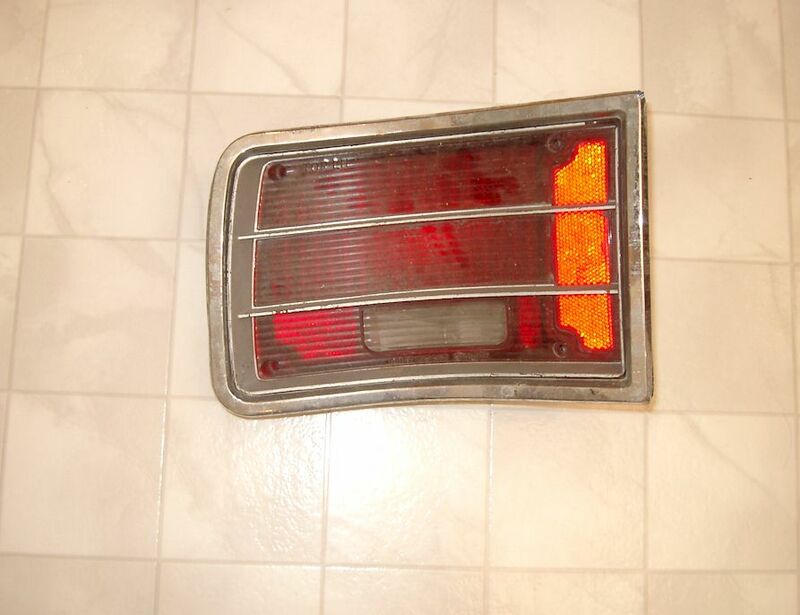 1971 - 1973 Chevrolet Impala Station Wagon Tail Light Assembly RH - In good driver condition. One crack on edge of lens - $10. 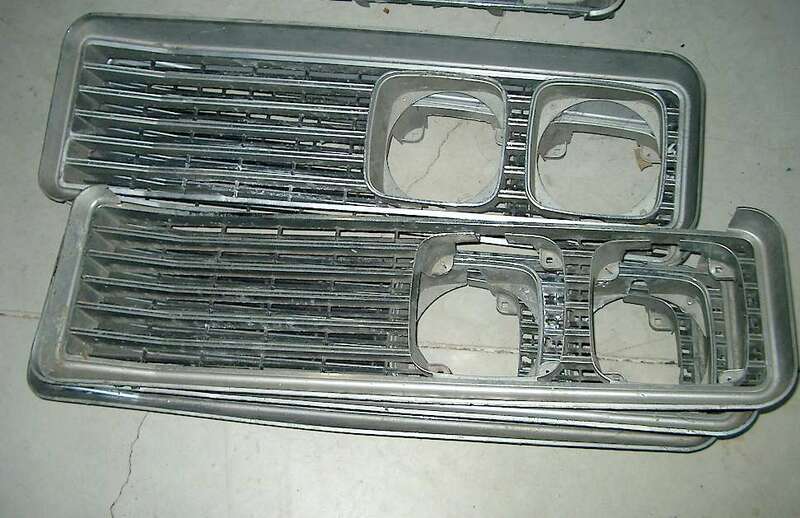 1973 Chevrolet Chevelle Malibu Grille - Part # 3992688. In good condition outside of one cracked fin at bottom edge - $20. 1973 Chevrolet Monte Carlo Grille - Pt. # 3987079. Some pitting and a couple of repaired cracks. Centre emblem sold - $20. 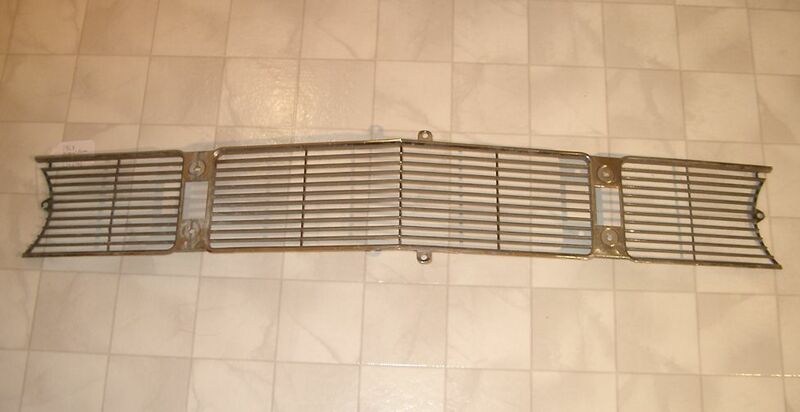 1974 Chevrolet Monte Carlo Grille - Pt # 338599. Some light pitting. In good condition otherwise - $30. 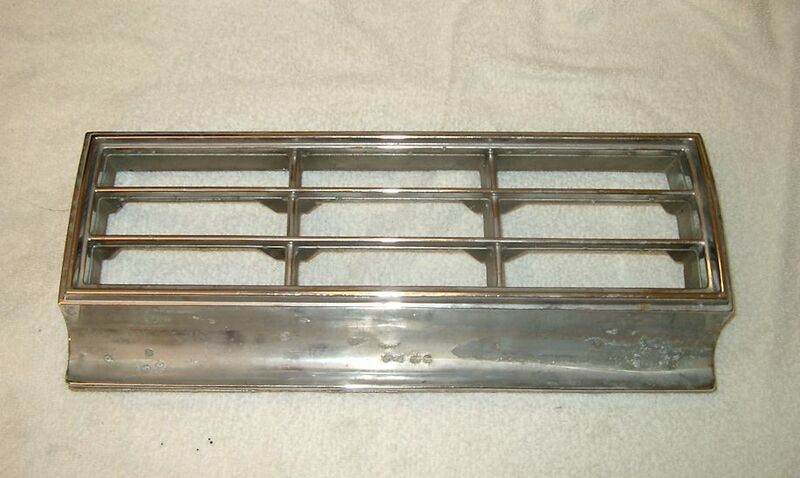 1974 Chevrolet Monte Carlo Lower Grille Right Hand - Part # 338578. In very good condition. May be NOS. No marks on studs - $20. 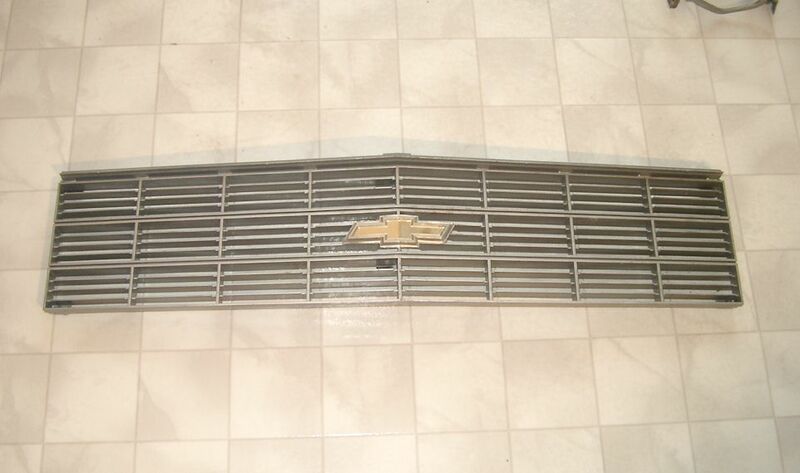 1975 Chevrolet Monte Carlo Grille - Pt # 345349. Some light pitting. Two available. No emblems - $20 each. 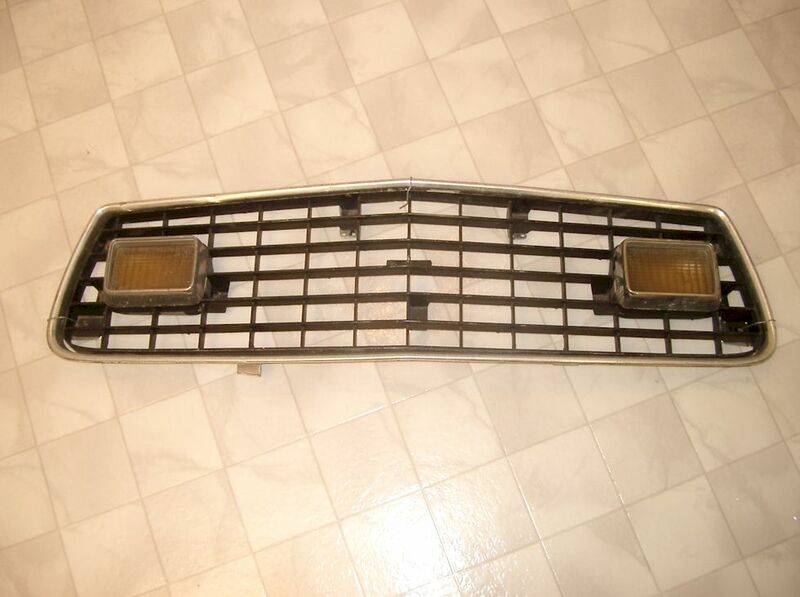 1975 Chevrolet Nova Grille - For base model and includes signal lights. One repaired fin. Some light scratches- $SOLD. 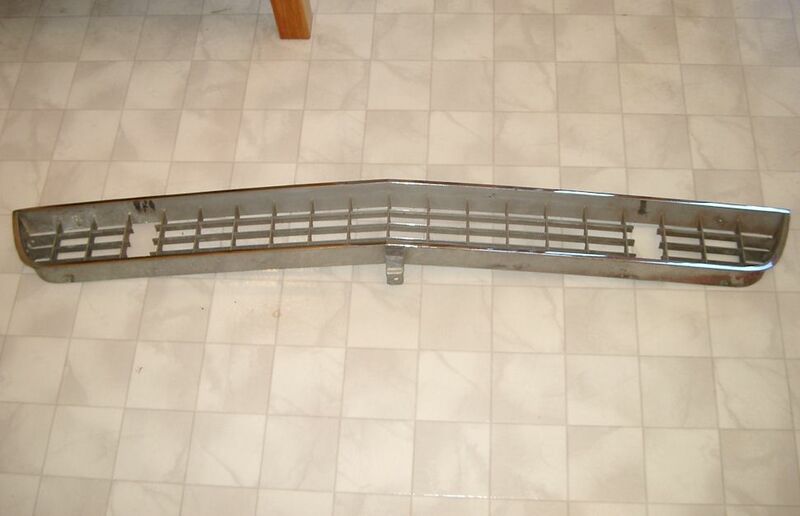 1977 Chevrolet Impala Grille - Part # 367438. In good original condition - $SOLD. 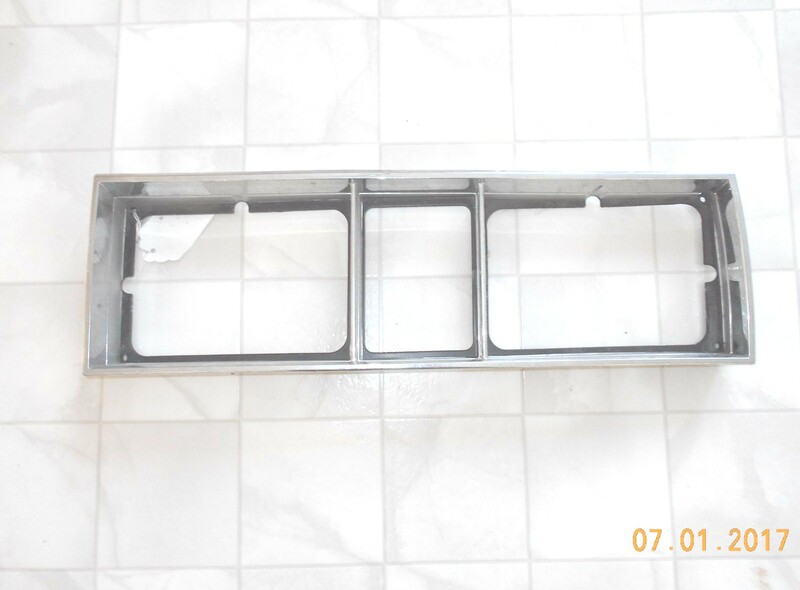 1978, 1979 Chevrolet Malibu, El Camino Headlight Bezel RH - Part # 463532. In Good original condition. No cracks - $20. 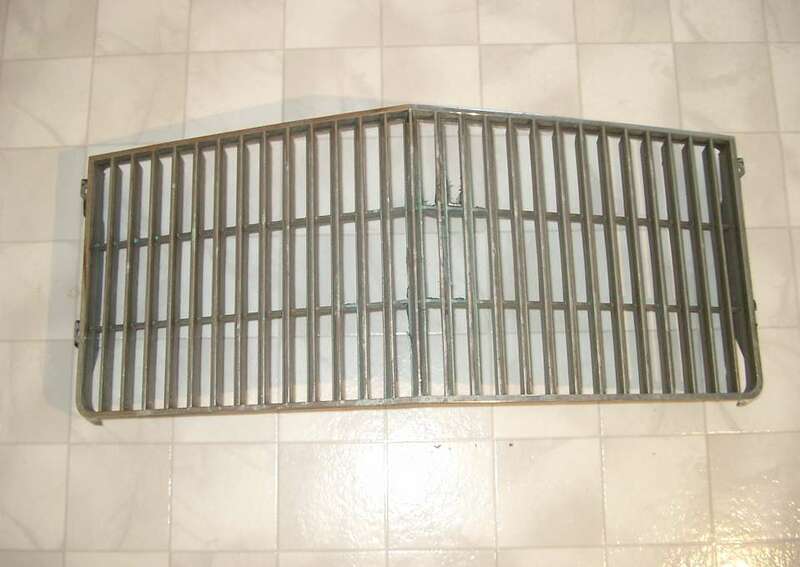 1979 Chevrolet Nova Grille - Part # 475715. A couple of repaired cracks and one slat broken below turn signal opening - $5. 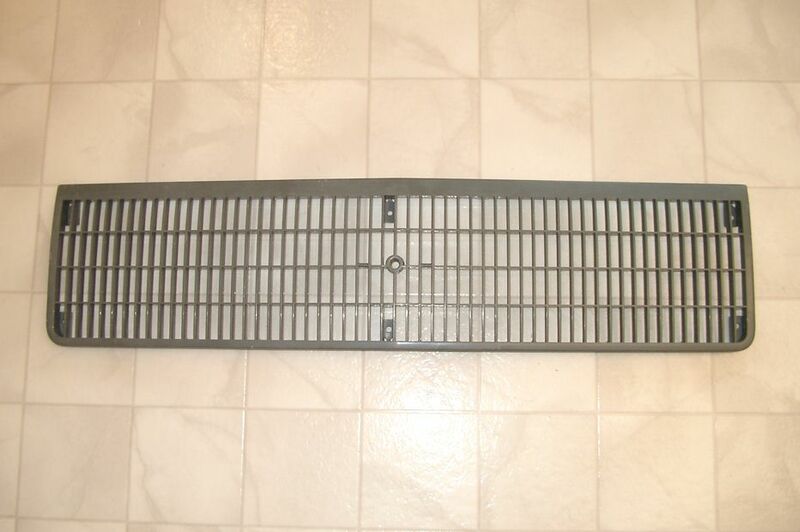 1979 to 1987 Chevrolet Chevette Grille - Part # 474757. In good condition. Not sure exact year of application so determine this yourself - $40. 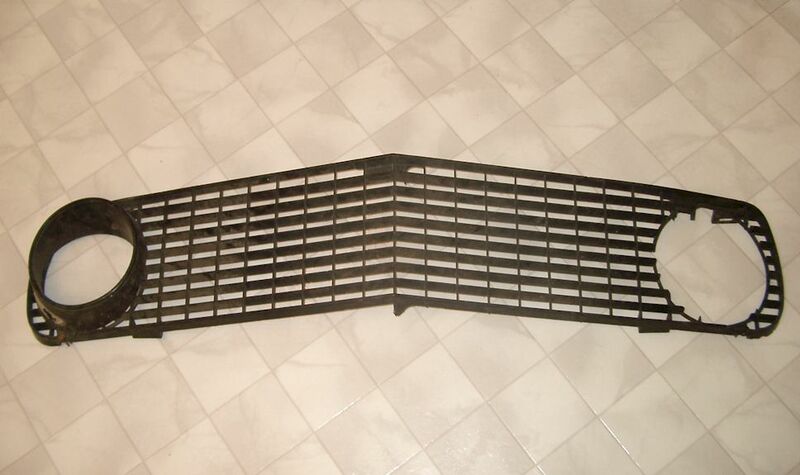 1980 Chevrolet Caprice Grille - Part #14005796. In driver condition. A couple of repaired cracks - $20. 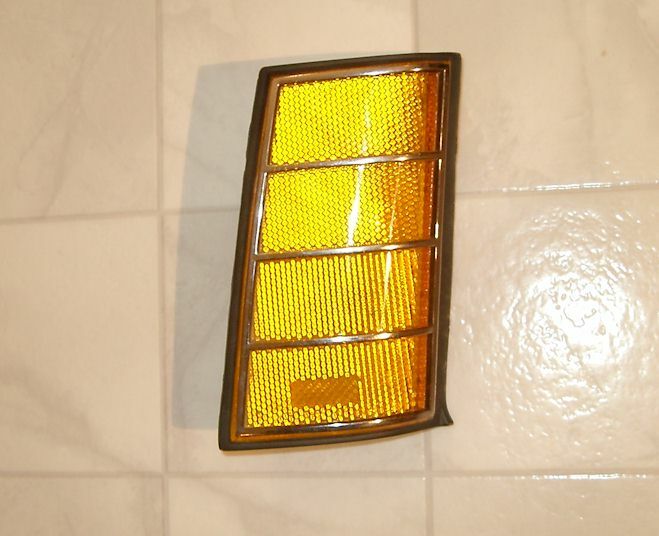 1980 Chevrolet Citation Side Marker Light RH - Part #5969838. In good original condition - $5. 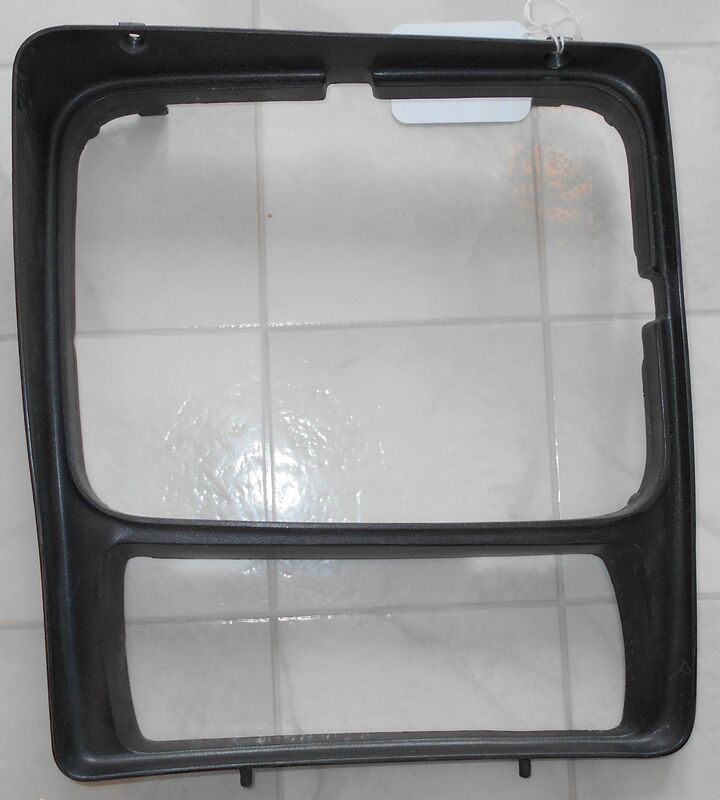 1982 to 1990 Chevrolet S10 Headlight Bezel LH - Part # 15591587. In driver condition with some minor damage to the chrome - $5. 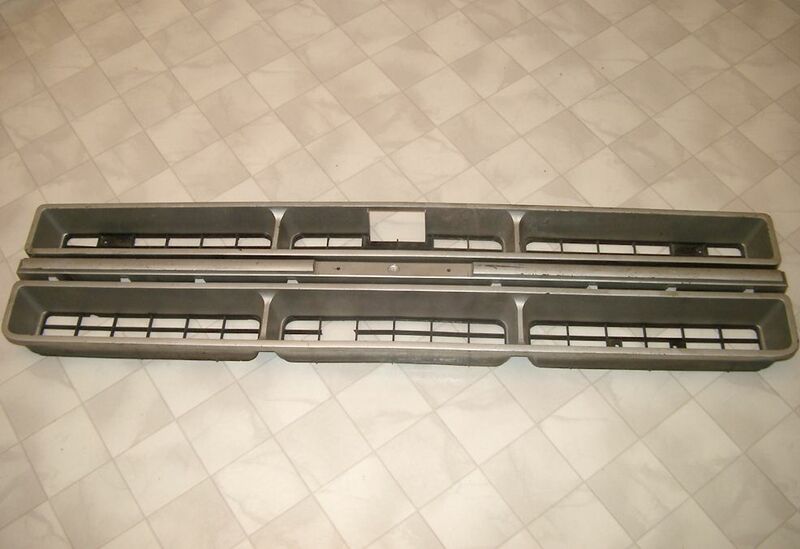 1983 to 1987 Chevrolet Malibu Grille - Part # 14034154. In good original condition. Emblem broken. One small chrome blister - $30. 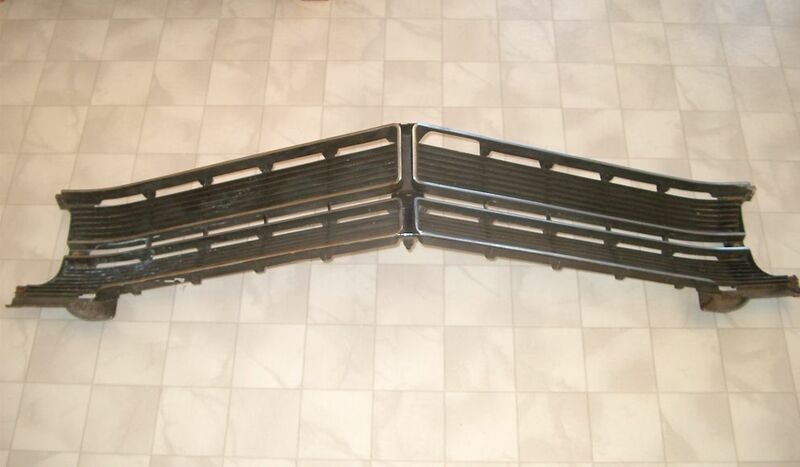 1985 Chevrolet Camaro Grille Insert - Also correct for 1986 and 1987 base and Berlinetta. Pt. #14076051. Minor damage at top mounts - $SOLD. 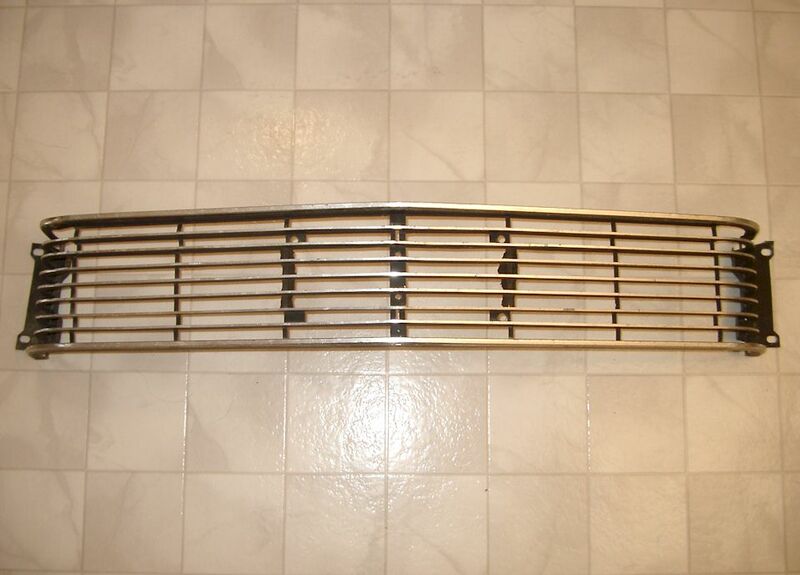 1986 to 1989 Chevrolet Celebrity Grille - Part #14090856. In very good condition. Grey finish - $10. 1956 Chrysler New Yorker Grille RH - Pt. # 1624106. In good original condition outside of one small repairable crack on outside edge - $20. 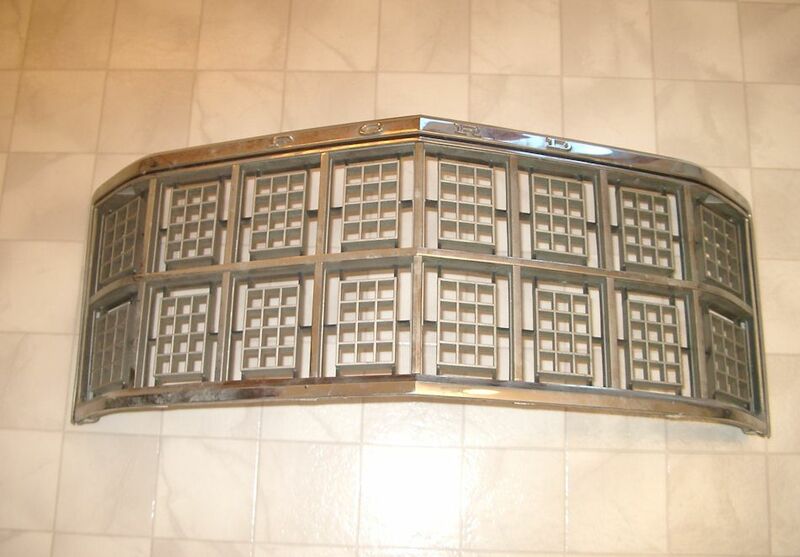 1965 Chrysler 300 Headlight Bucket/Grille Surround - In very good original condition. Right hand side. Part # 2524084 - $40. 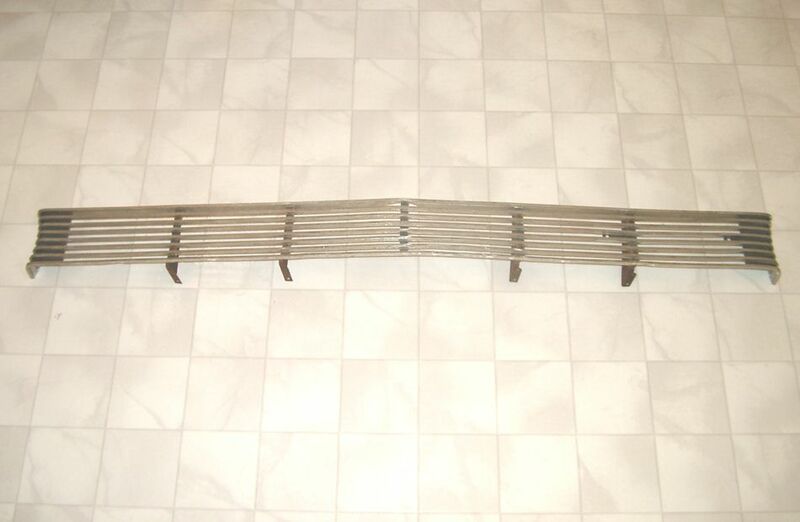 1966 Chrysler Newport Grille Trim Passenger Side - Part #2578376. In good original condition. Some minor pits - $10. 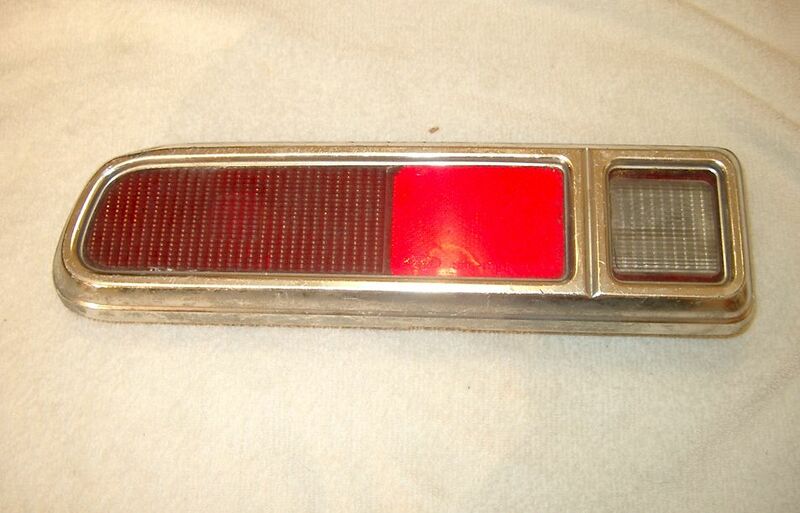 1968 Chrysler New Yorker Taillight Bezel LH - Part # 2853507. In good original condition - $20. 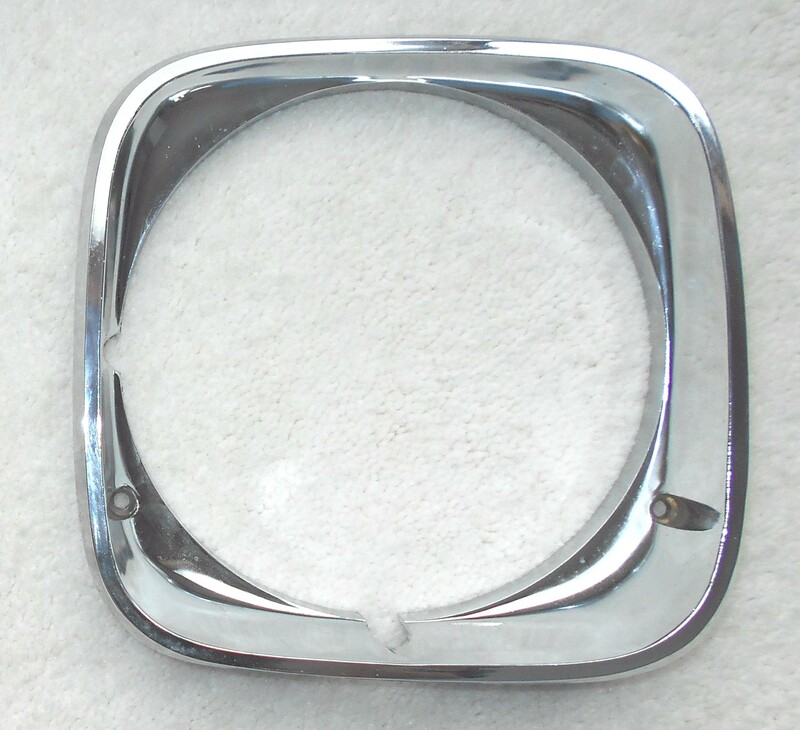 1971 Chrysler Newport Headlight Bezel RH - Part # 3443717. In driver condition with some minor pitting - $10. 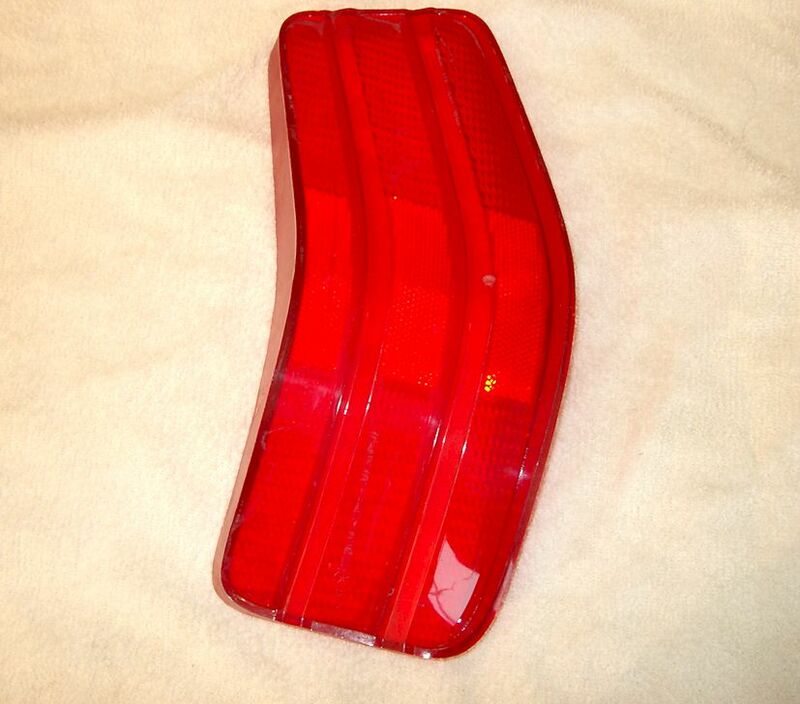 1972 Chrysler Newport Right Taillight - In good condition outside of one scratch on left most lens - $5. 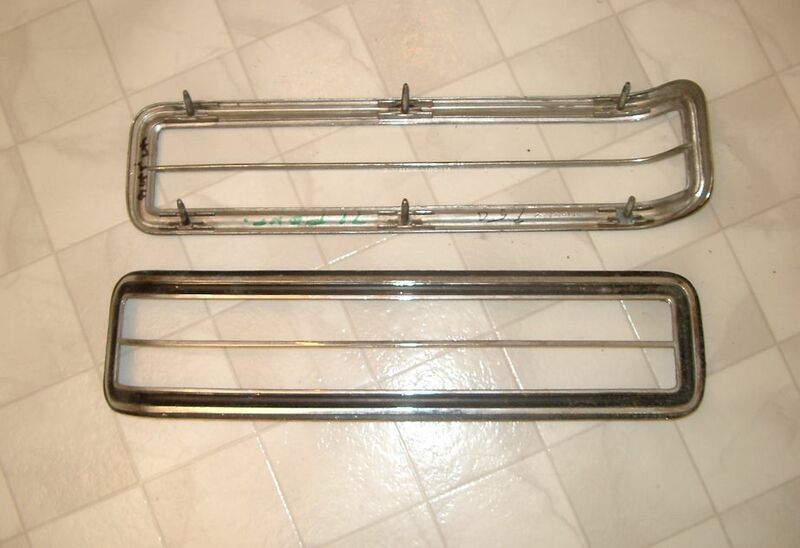 1974 Chrysler Newport Taillight Frames - LH (3728039) & RH (3728038). In aged original condition $10 each or $15 for pair. 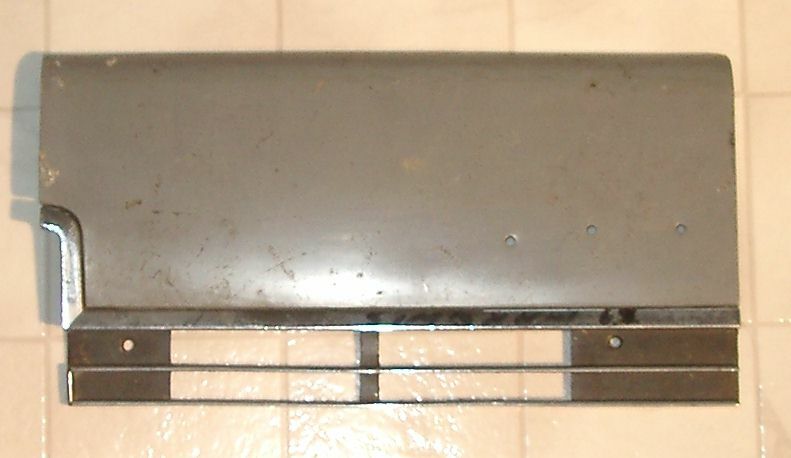 1965 Dodge Monaco Trunk Trim Panel - In aged original condition with some pitting. Part # 2526056. Good for a driver - $10. 1968 Dodge Coronet Quarter Panel Extension RH - Part # 2842724. One professionally repaired crack. In good condition - $20. 1968 Dodge Monaco & Monaco 500 Grille - Pt. # 2786440. In good condition. A pair of professionally repaired cracks and some pitting - $50. 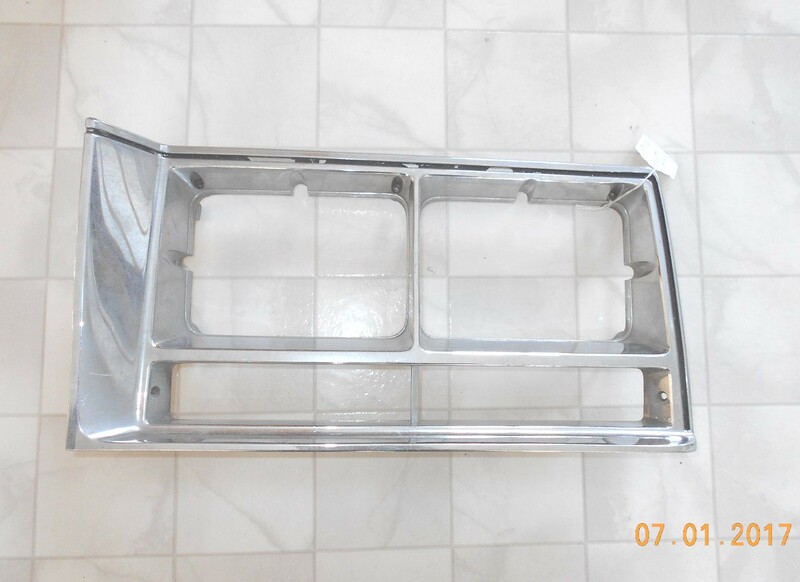 1968 Dodge Polara Grille - Part # 2786448. In good original condition. Professionally repaired crack at one set of mounting holes - $50. 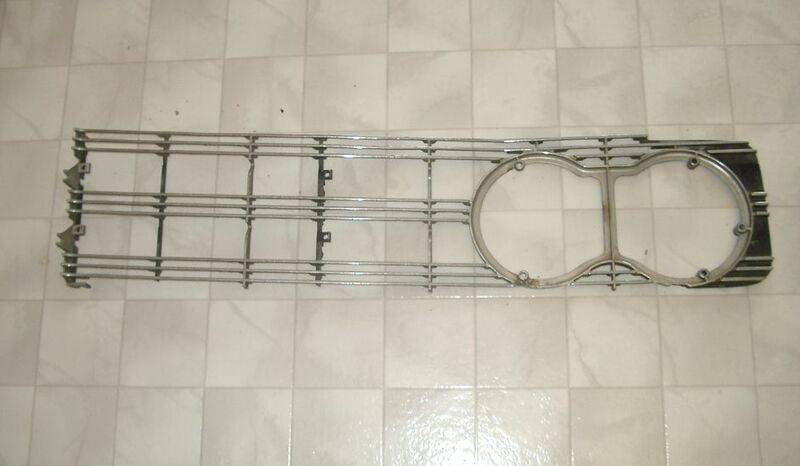 1969 Dodge Coronet Station Wagon Taillight Frame RH NOS - Part # 2930482. 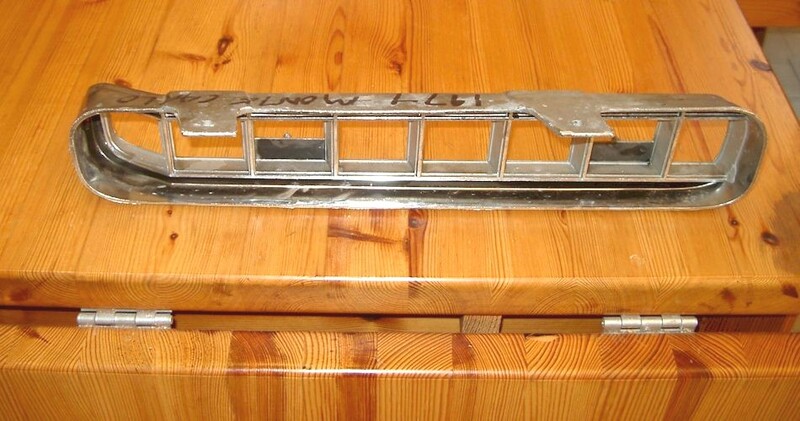 Some shelf wear - Minor scratches in the chrome & accent paint - $30. 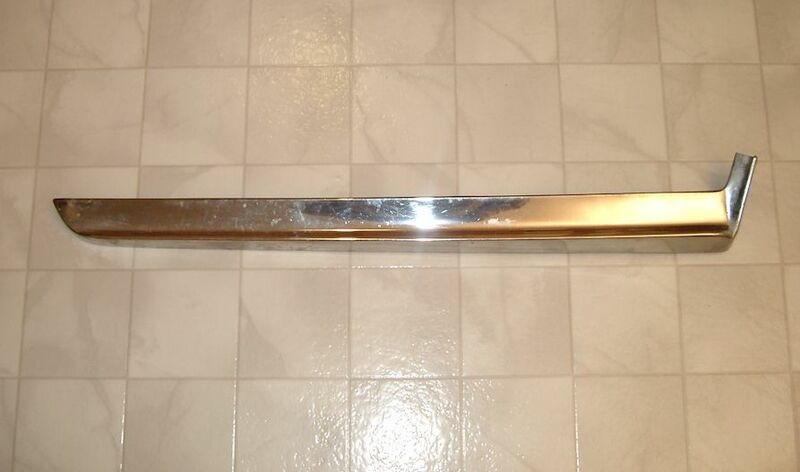 1969 Dodge Monaco or Polara Chrome Fender Extension LH - Part # 2898395. In good original condition - $30. 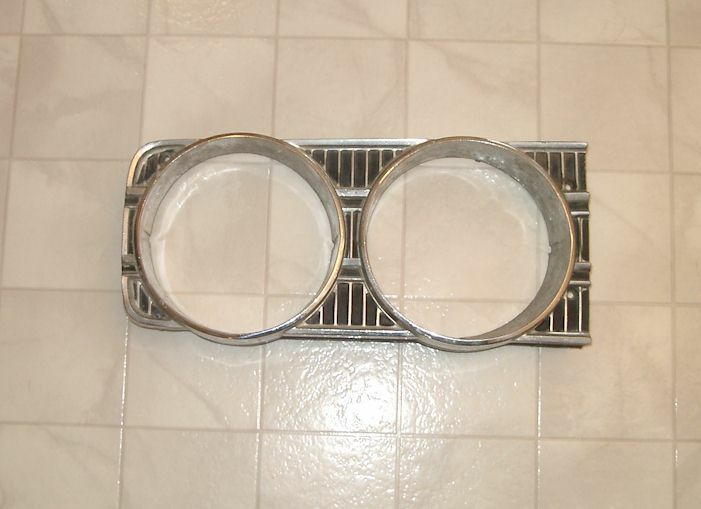 1970 Dodge Monaco Headlight Bezels - Left and right. Part # 2949770 and 2949771. RH good - $25. LH repaired crack - $10 or $30 pair. 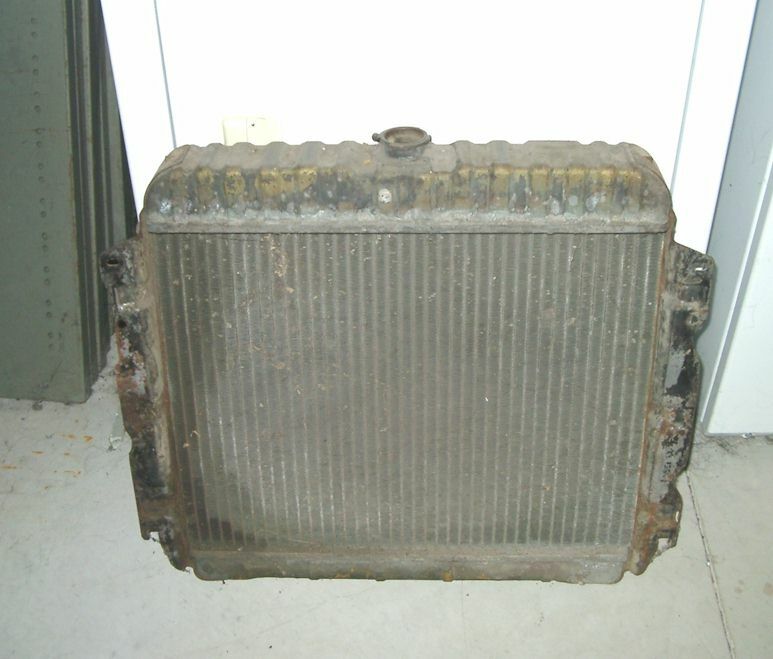 1971 Dodge Charger 500 Big Block 22" Radiator - Part # 3443961. 1971 B & E Body big block auto cars w/o air conditioning - $SOLD. 1980 Dodge Aspen Headlight Bezel LH - Part # 4074431. In driver condition. Some deep scratches on top edge and left corner - $10. 1984 to 1989 Dodge Diplomat Headlight Bezel - Part # 4074626. In good driver condition. One broken tab. Needs a polish - $10. 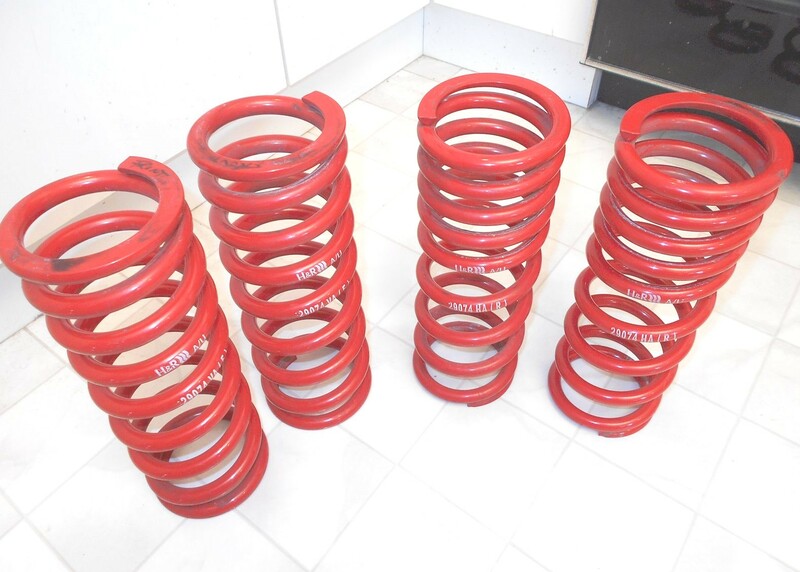 2007 to 2012 Ferrari 599 GTB H&R Lowering Spring Set - Part # 29074. Used but in very good condition - $600. 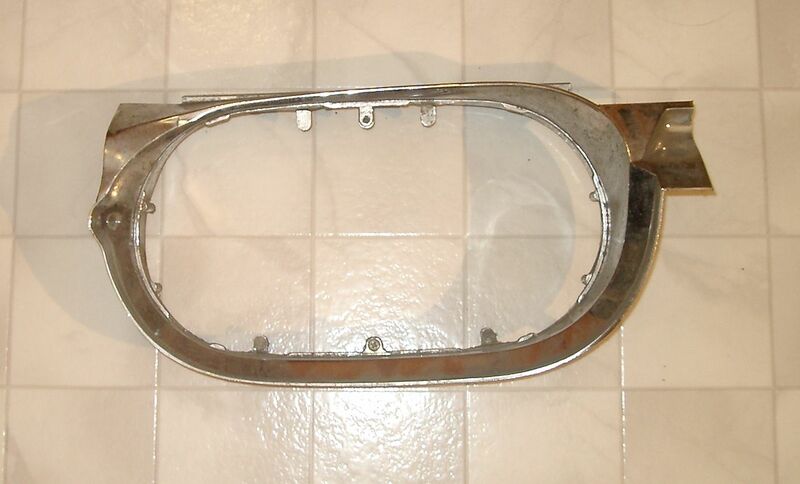 Fiat 124 Sedan Headlight Bezel - Cromodora pt.# 4247246. In aged condition with professionally repaired crack. For a driver or restoration - $5. 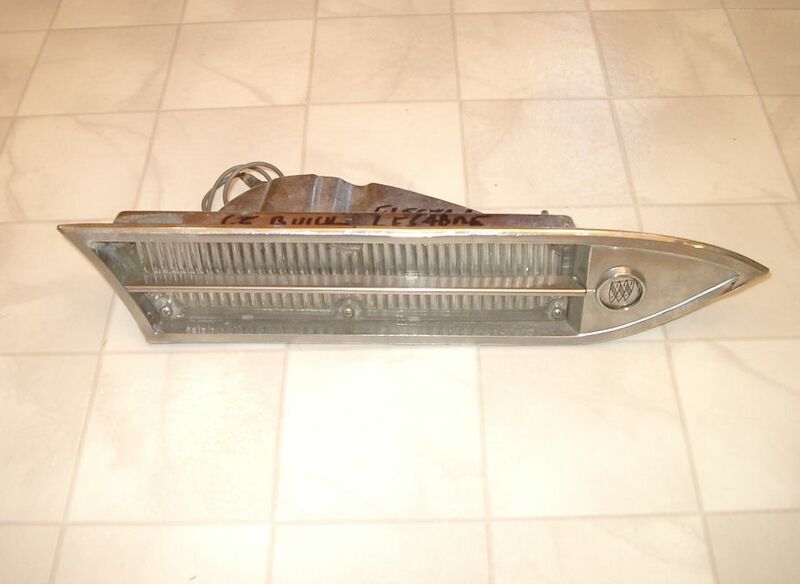 1960 Ford F150 Headlight Bezel RH - In good original condition - $20. 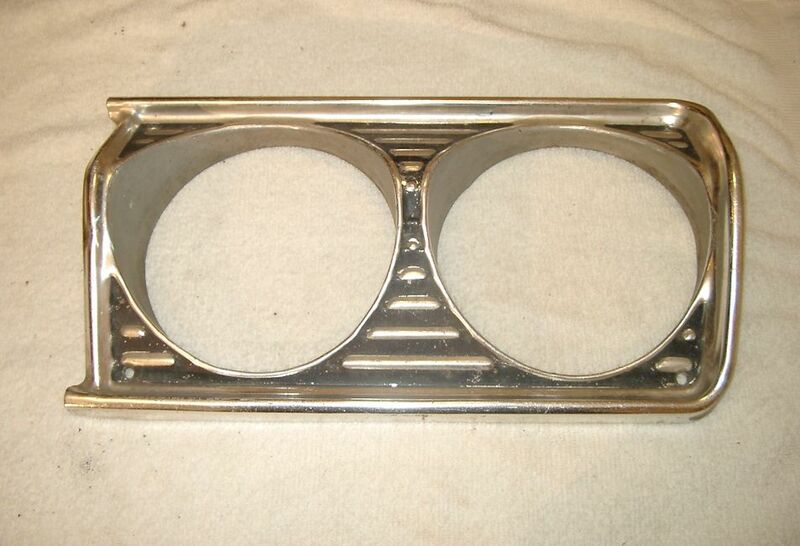 1961 Ford Thunderbird Headlight Surround RH - Part # C1SB-13A043-B. In aged condition with a couple of cracks. For restoration - $5. 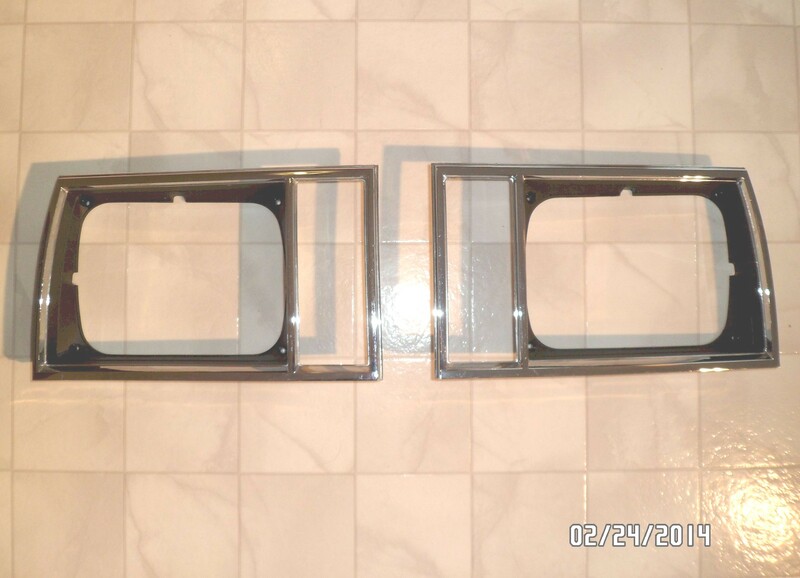 1963 Ford Fairlane Headlight Doors LH - Aged original condition. Lots of road abrasion. 2 available. Some corrosion on one edge - $SOLD. 1967 Ford Galaxie 500XL Trunk Trim - Part # C7AB-6342508A. No emblem. In good original condition. Some minor pits - $SOLD. 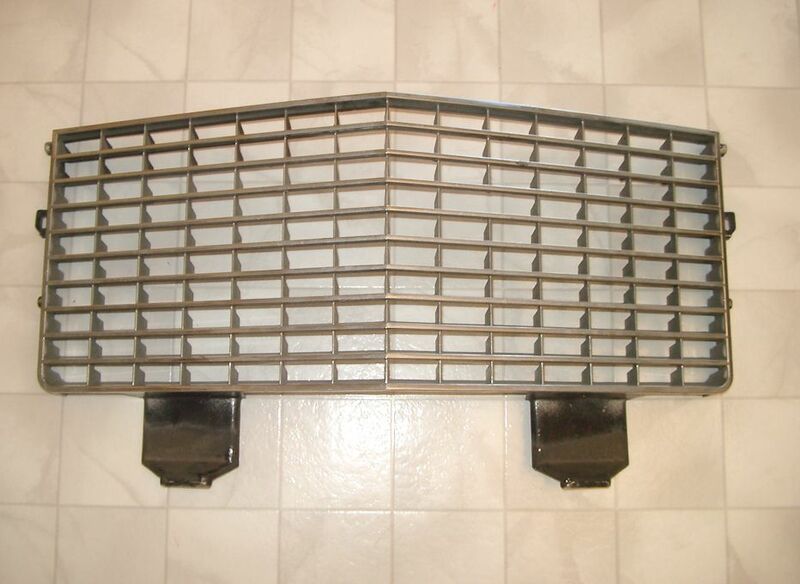 1967 Ford LTD Grille Center - Part # C7AB-8A133-A. In aged condition with a couple of repaired cracks and pitting. Good for a driver - $40. 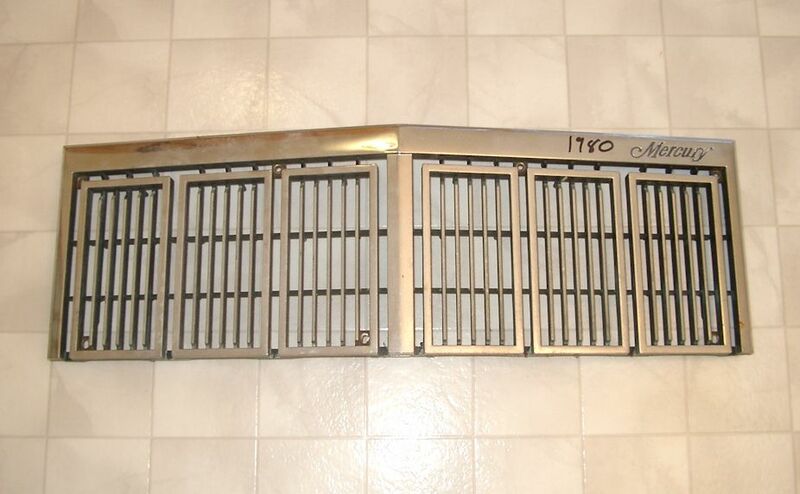 1967 Ford Thunderbird Headlight Door Grille - Pt # C7SB-13A138-A. Driver condition. Two available but both for same side - $10 each. 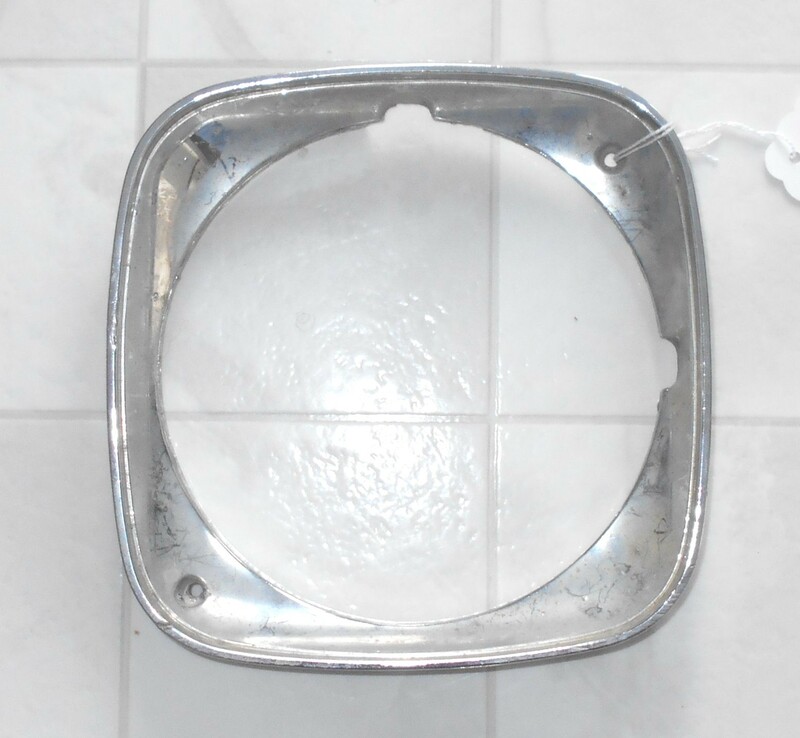 1967 Ford Thunderbird Headlight Bezel - In driver condition with road abrasion. Mounting holes slightly enlarged - $5. 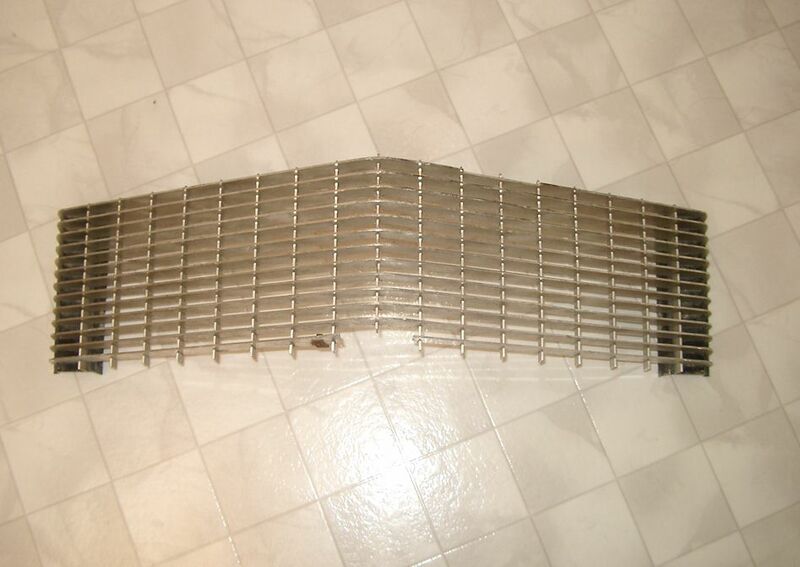 1968 Ford Thunderbird Center Grille - In aged original condition. Top mounting tabs broken but still there for repair - $20. 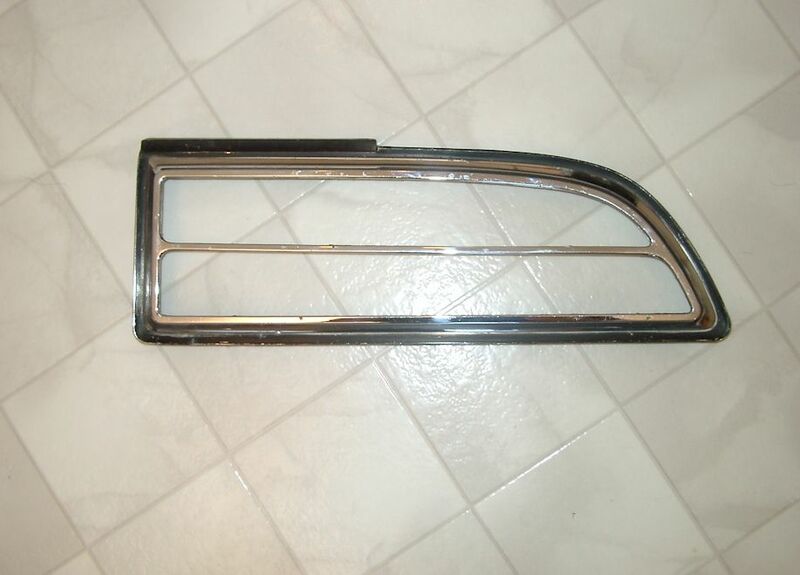 1968 Ford Thunderbird Rear Trim Piece RH - Part # C8SB-13616-B. In good original condition - $20. 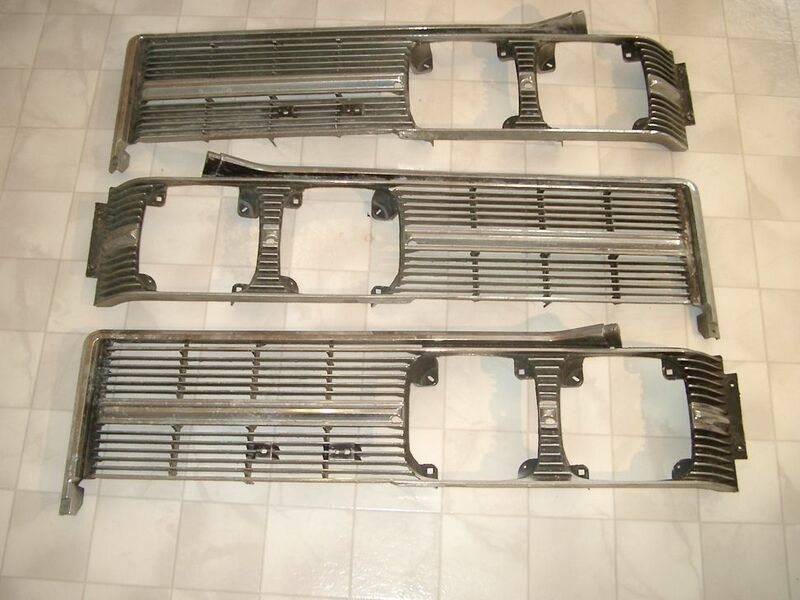 1968 Ford XL Grilles - Pt # C8AB-8150 & 8151. Both were cracked and now professionally repaired. Good for driver. $20 each or $30 pair. 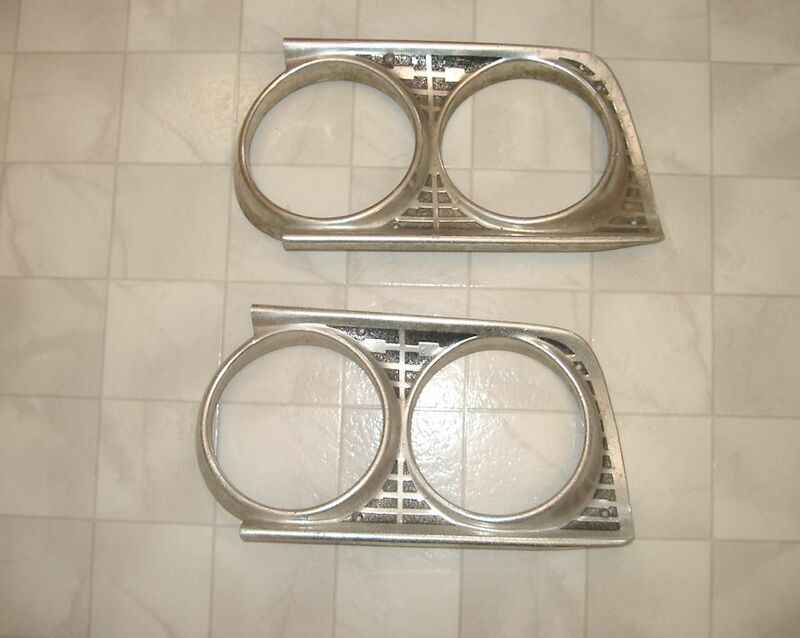 1969 Ford Galaxie Headlight Bezels - Part #'s C9AB13052 and C9AB13064A. In driver condition. $20 each or $30 pair. 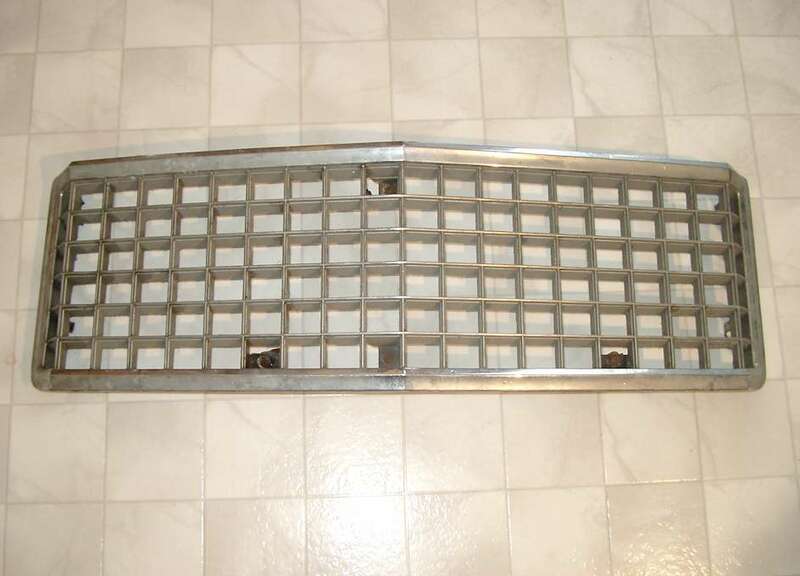 1969 Ford LTD Grille Assembly - Complete grille assembly minus centre trim. Includes 2nd centre section. In driver condition. Complete - $80. 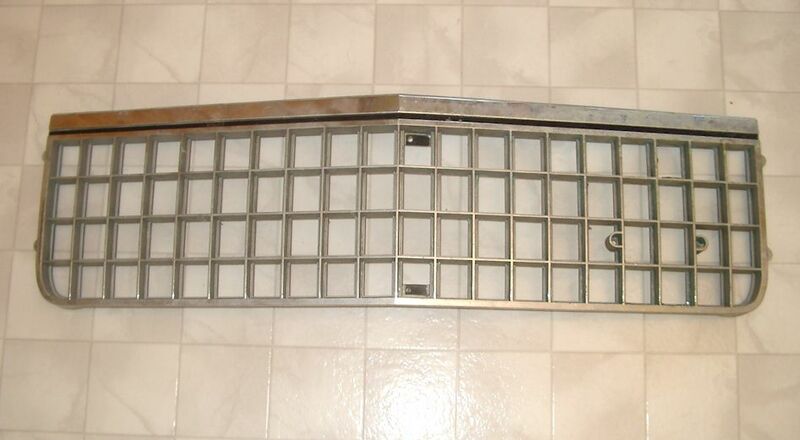 1969 Ford Mustang Grille - Includes one headlight bezel. Some minor cracks and old overspray. Part # C9ZB-8150-B - $SOLD. 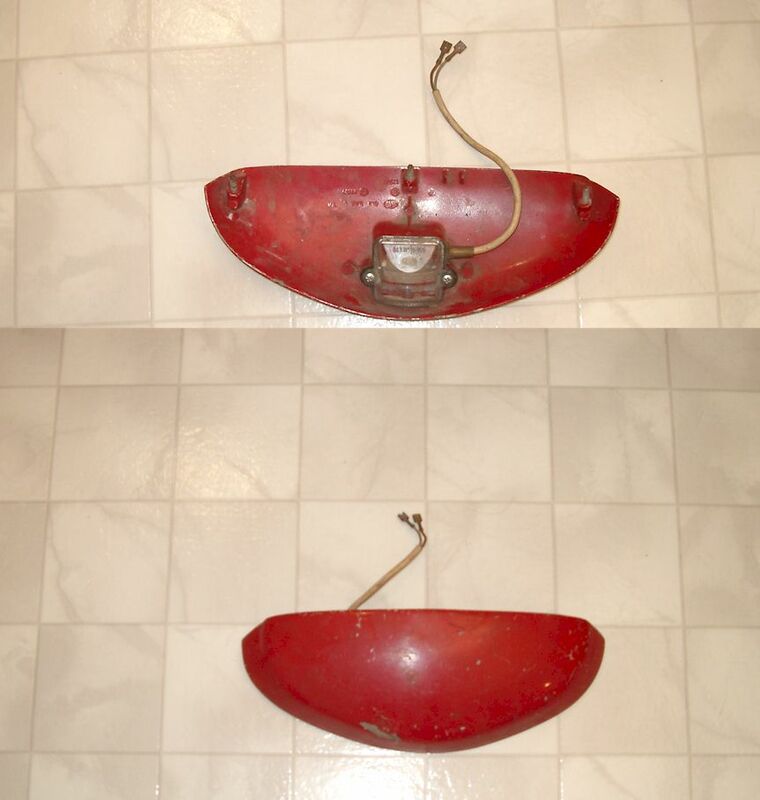 1969 Ford Thunderbird Headlight Bezel - In driver condition with road abrasion - $5. 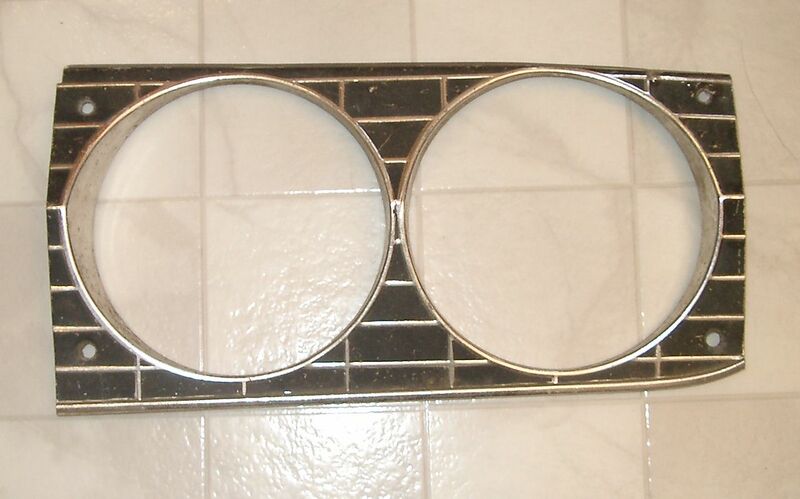 1969 Ford Torino Headlight Bezel RH - Part number C9OB-13052-C. In aged original condition. Repaired crack in steel. Crack in plastic - $10. 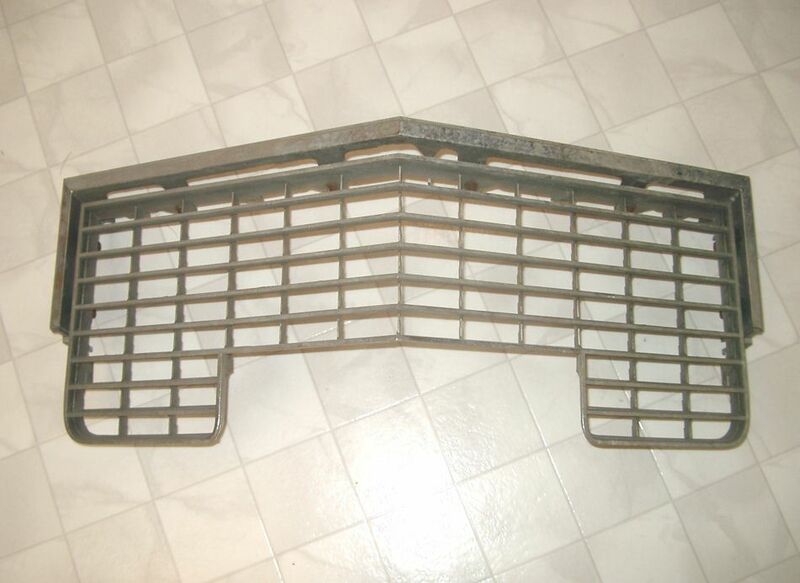 1970 Ford LTD Grille Centre - Part # D0AB-8A133-A. In good condition. Couple of professionally repaired cracks to mounting tabs - $30. 1970 Ford Pinto LH Tail Light Assembly - Lens good, housing has some surface rust, brightwork poor with a ding. Fits Maverick also - $10. 1970 Ford Torino Tail Light Panel Trim - In good driver condition. One minor repaired crack on bottom edge barely noticeable - $20. 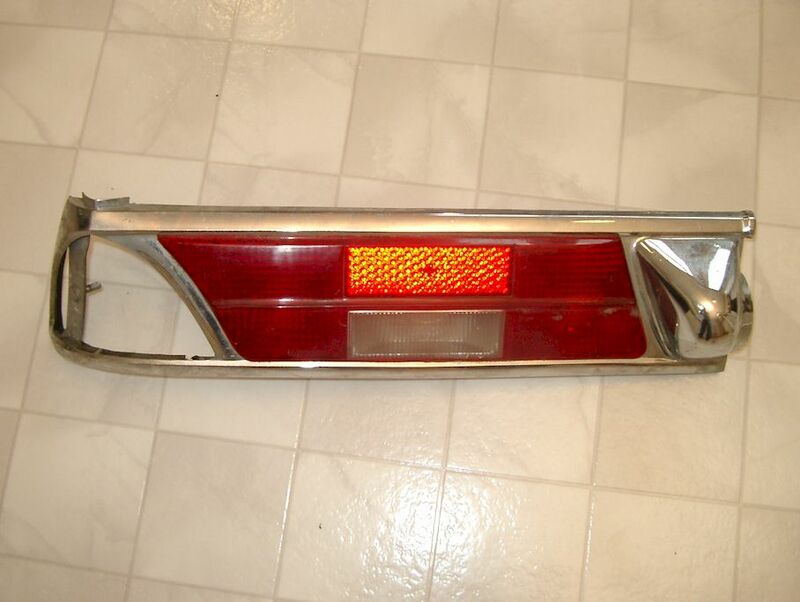 1971 Ford Galaxie and LTD Taillight Assembly - In good original condition - $10. 1971 Ford Station Wagon Taillight Lens and Frame - Part # D1AB-13449-BB RH side. In good condition - $10. 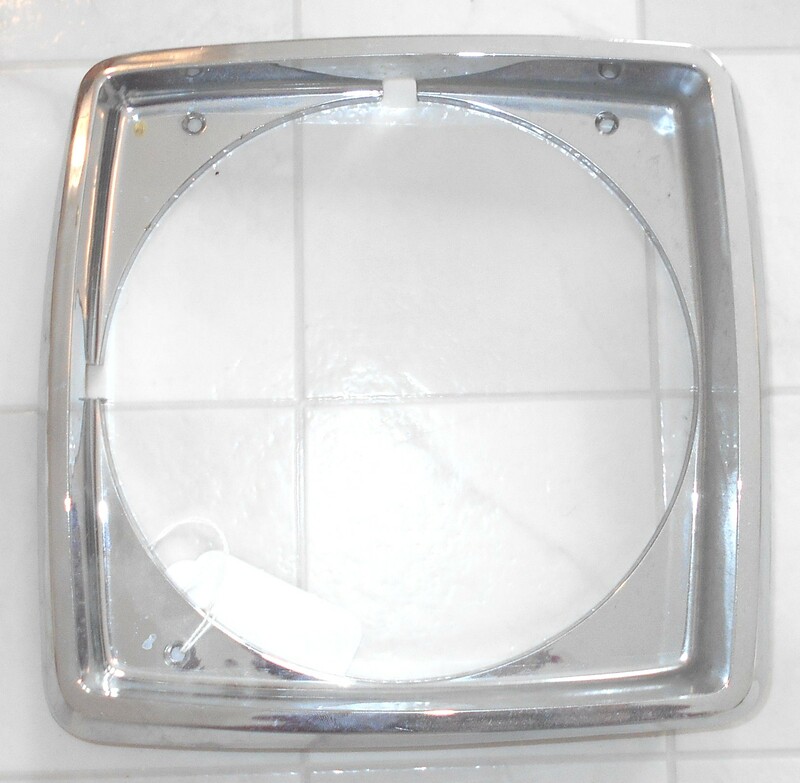 1972 Ford Thunderbird Headlight Bezel LH - Part # D2SB-13064. In good driver condition. Some paint loss - $10. 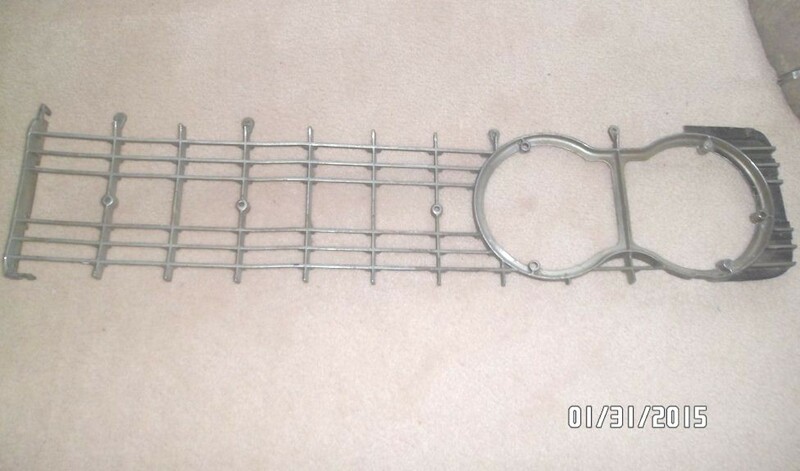 1974 Ford Mustang Grille - Includes 1 turn signal. Some minor cracks & chips. Dings in surround. Part # D4ZB-8150-AA - $SOLD. 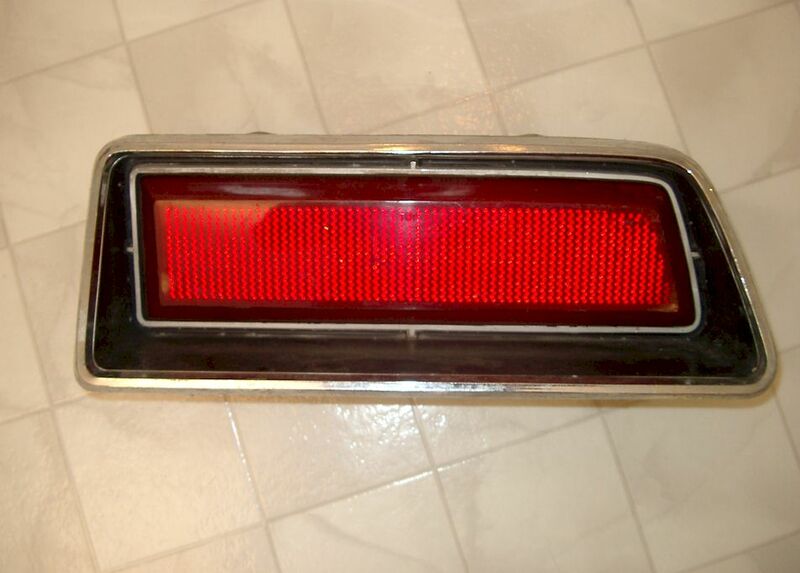 1974 to 1978 Ford Mustang Taillight Bezel LH - Part # D4ZB-13504. In good driver condition. One blister in chrome - $10. 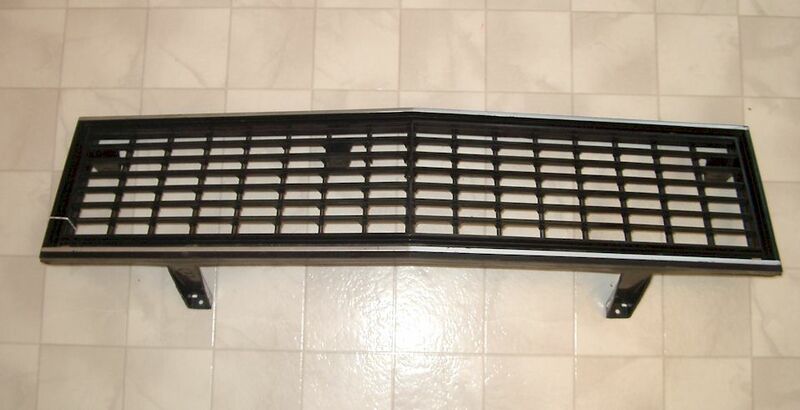 1974 Ford Elite Grille - Part # D4EB-8150-BA. Surround and letters good. Crack in grille center but not that noticeable from front - $10. 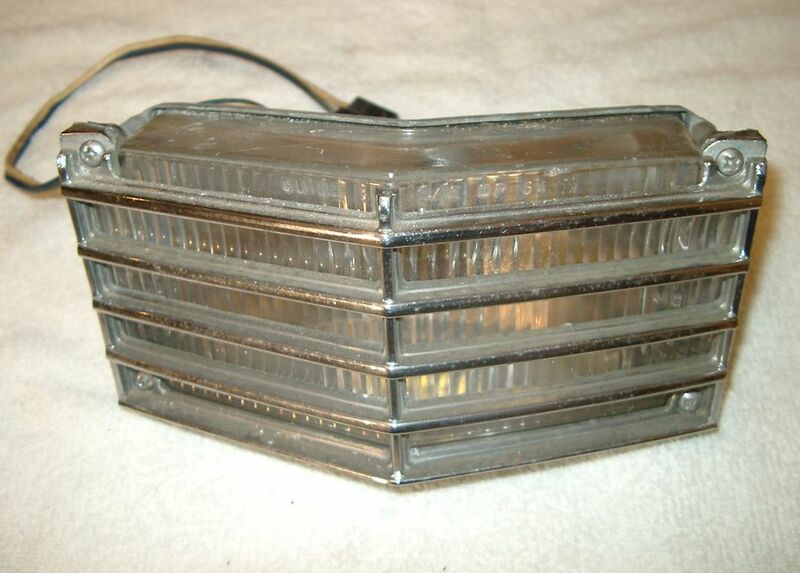 1974-76 Ford Elite Taillight Assembly RH - Frame and centre lens good. Outside lens missing, rear bulb holder broken - $10. 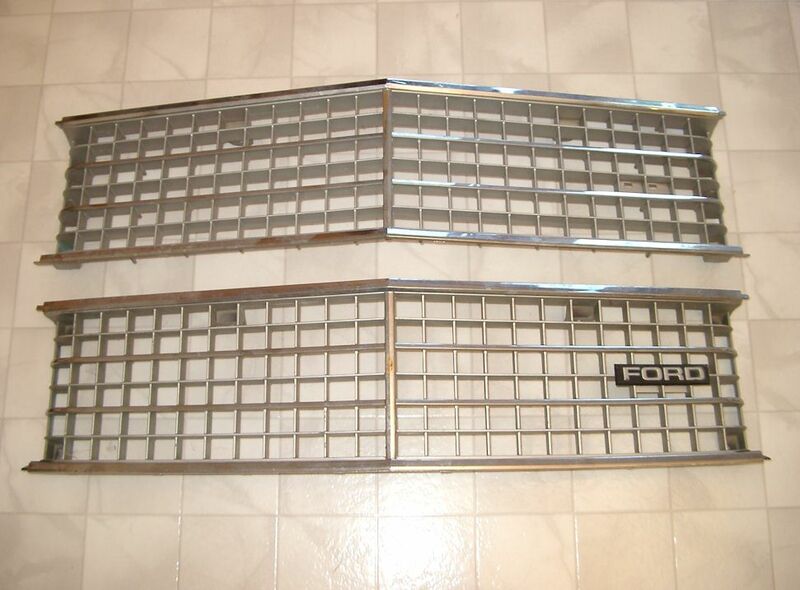 1975 Ford Mustang Grille - Includes separate surround & turn signals. Painted black. Good for a driver. 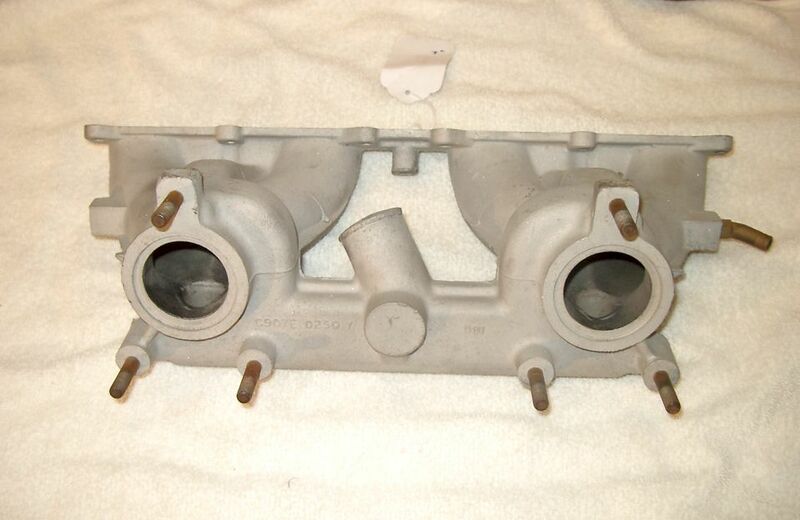 Part number D5ZB-8150 - $SOLD. 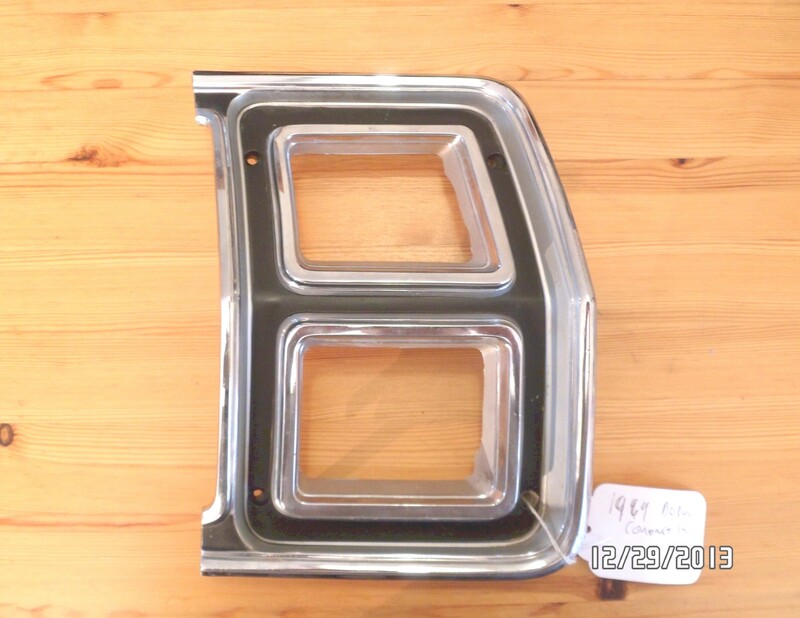 1977 Ford LTD II Headlight Bezel RH - Part # D70B - 13052-AA. In good driver condition. Requires a polish. Two available - $10 each. 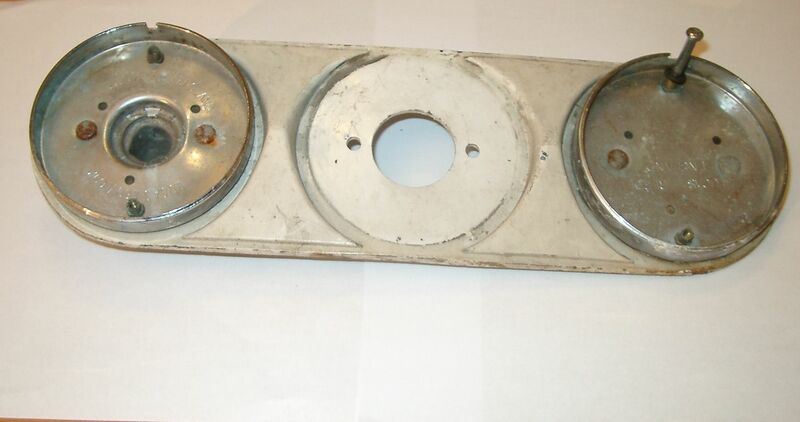 1978 Ford Granada Headlight Bezel LH - Part # D8DB-13064-AWB. In good original condition - $10. 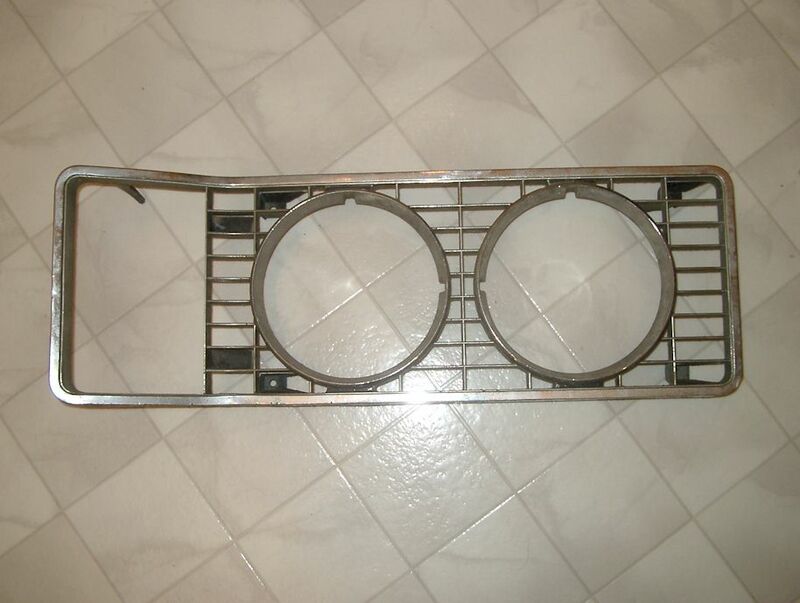 1979 Ford Econoline Headlight Bezel LH - Part # D9UB-13064-B. Black finish. In good condition - $10. 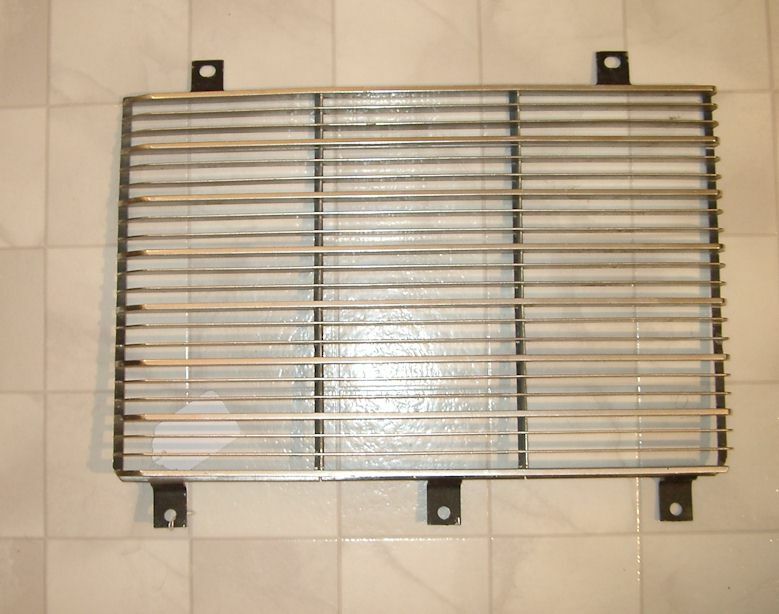 1979 Ford Thunderbird Grille and Surround - Grille part # D9SB-8150-AW1. Includes surround and hinge. In good condition - $40. 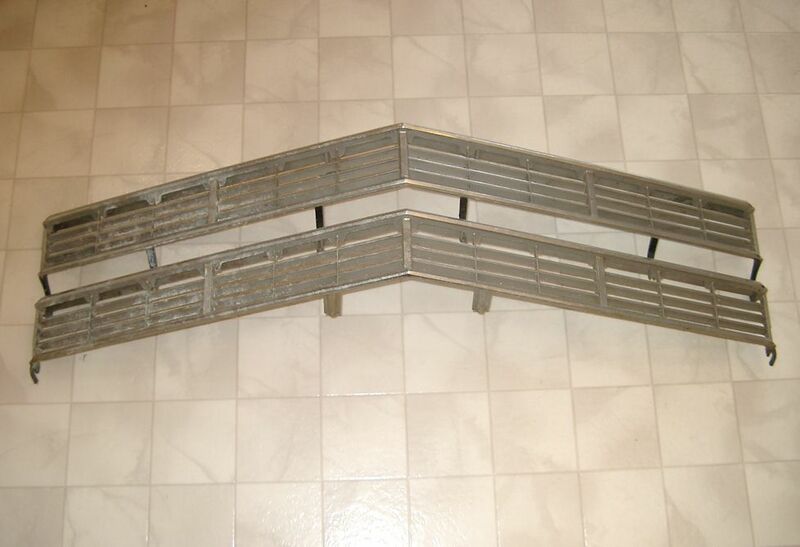 1980 Ford Pick-up Grille - Has repairable crack on one side. Good for a driver - $10. 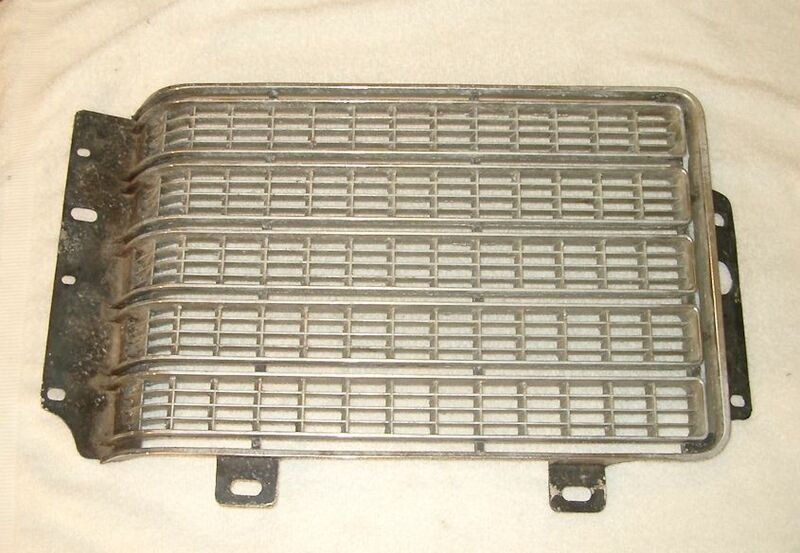 1981 Ford Thunderbird Grille - Part # E1SB-8150-AWA. In very good condition - $40. 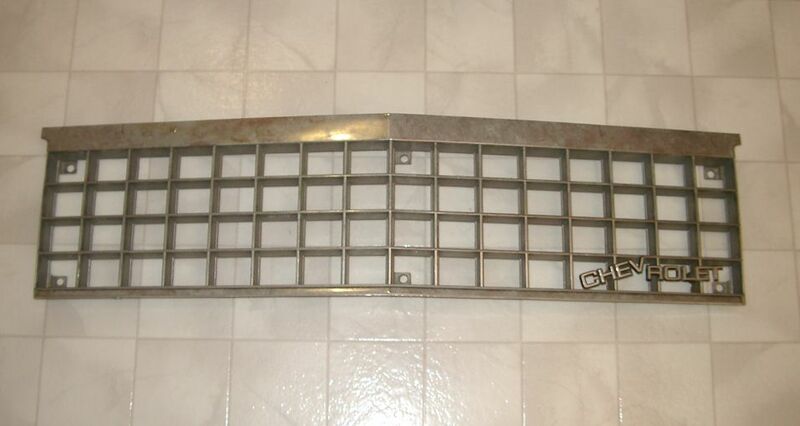 1975 - 1976 GMC Grille - In useable but aged condition with a few cracks and one repaired spot. No crack at hood latch opening - $20. 1958 Imperial Headlight Bezel Base LH - Part # 1686491. In good original condition - $20. 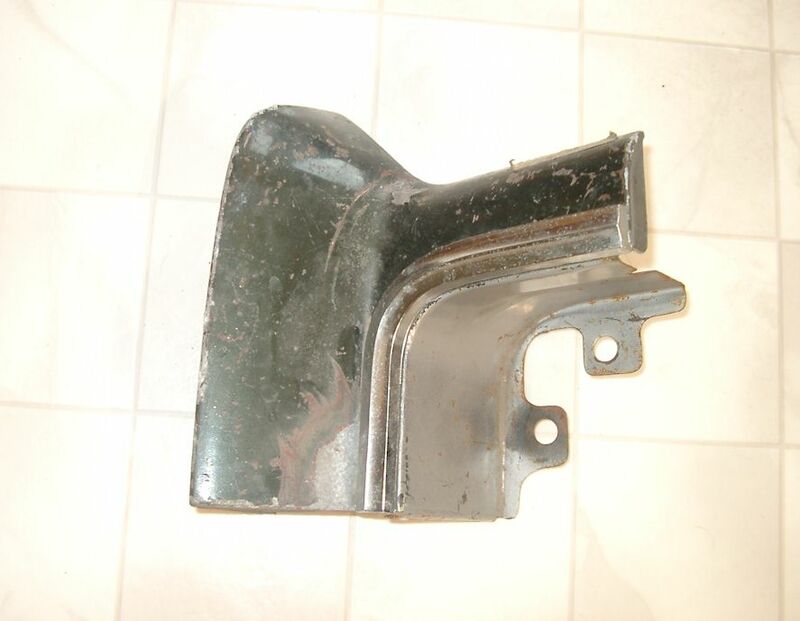 1967 Imperial Tail Light Frame LH - Part # 2575285. Chrome in good condition. One fin has slight bend. Reflector lens cracked - $SOLD. 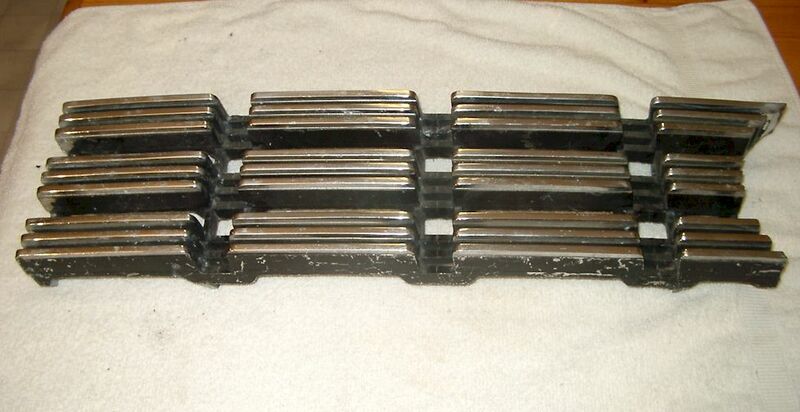 1970 Imperial Grille - Part # 2949734. In good original condition. 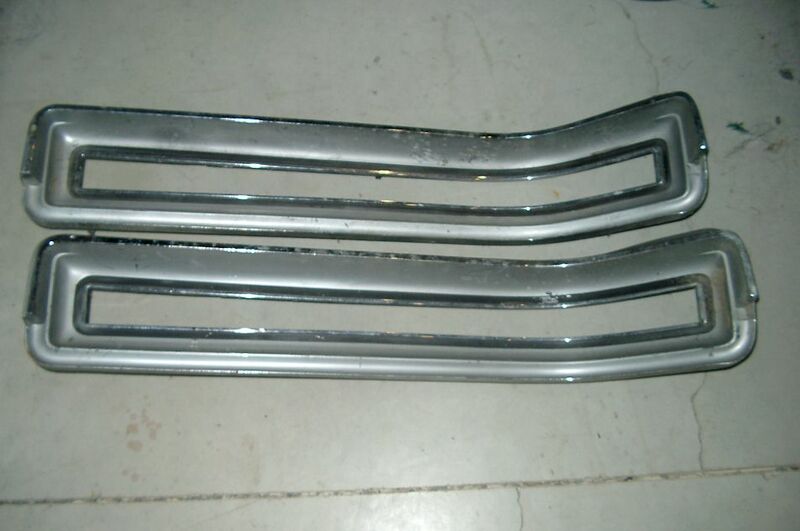 One slight bend to top grille bar - $50. 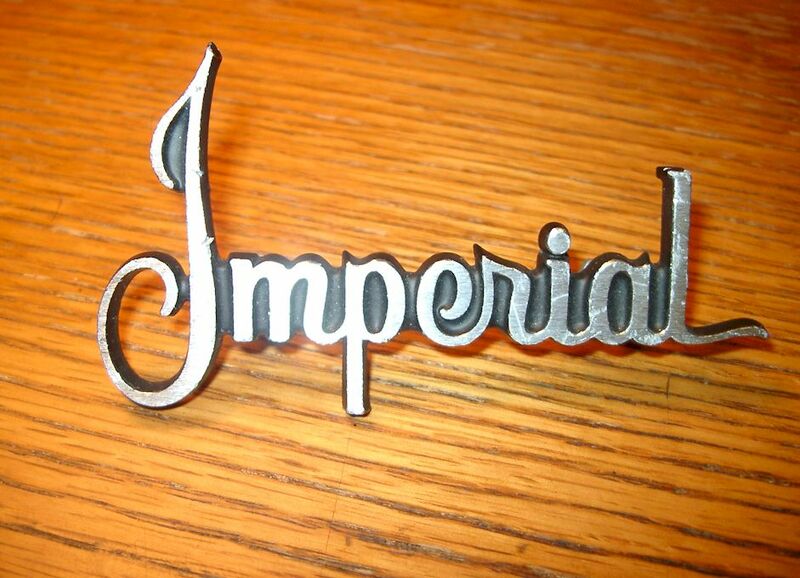 1970 Imperial Script Emblem Headlight Door - Part #2949735. Good studs. Couple of nicks & some light scratches. Includes speed nuts - $10. 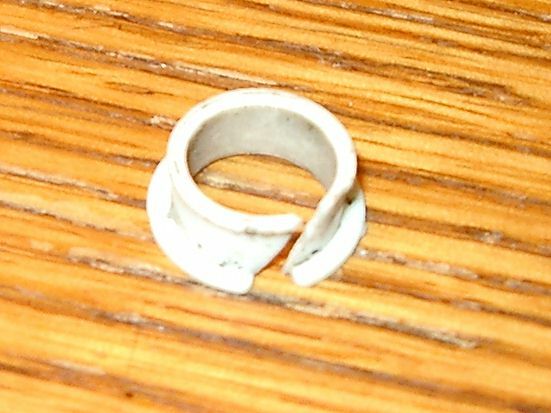 1970 Imperial Headlight Door Bushing - In good condition - $5. Jaguar XK150 Trunk Spear - Restored and rechromed. In very good condition - $SOLD. 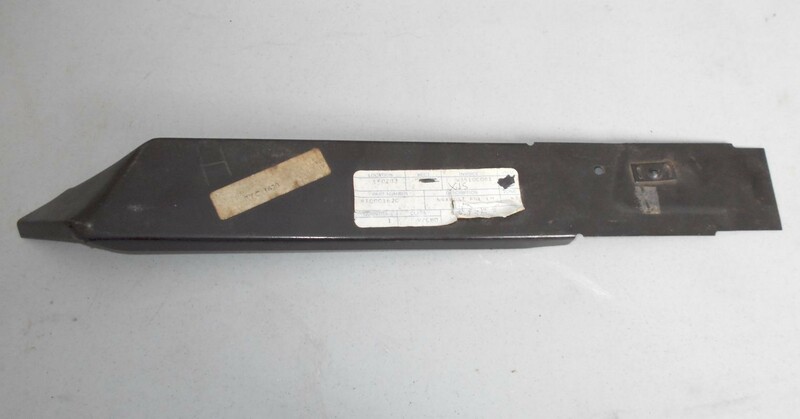 Jaguar XJS A Post Closing Panel LH - New Old Stock Jaguar part # RTC1620 - $5. 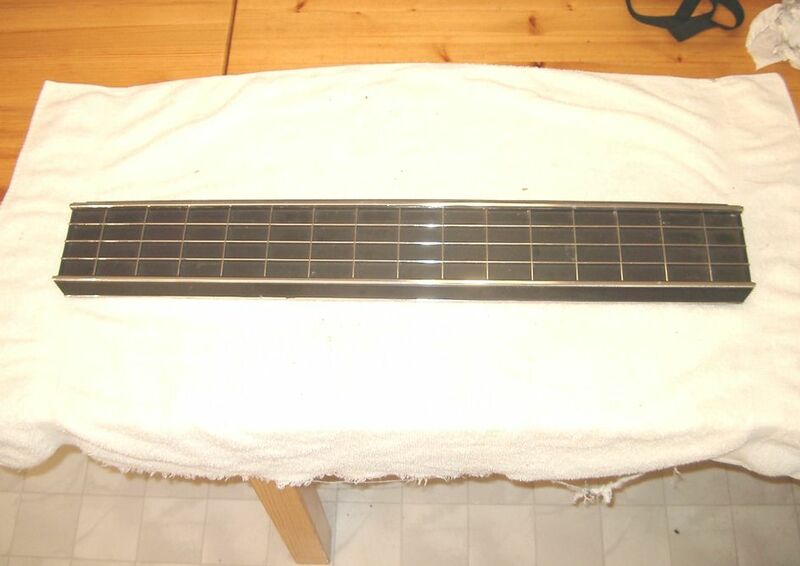 Jaguar XJS Tail Light Reinforcement Panel RH - New Old Stock Jaguar part # RTC1653 - $5. 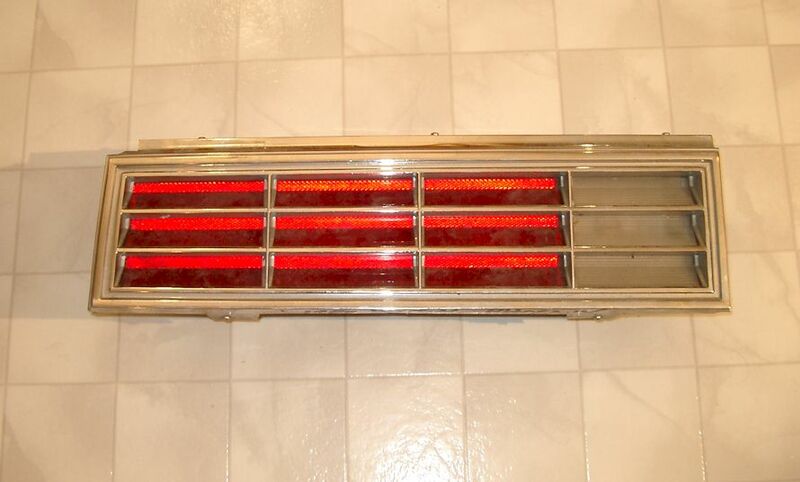 1970 Lincoln Continental Taillight Bezel - Part # D0VB-13449-B. In good original condition with a few pits. Good for a driver - $15. 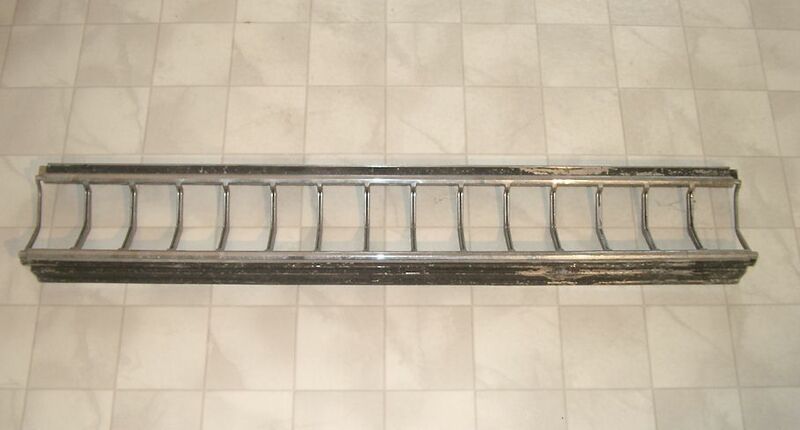 1970 Lincoln Continental Upper Grille Molding - D0VB-8418-A. 4 available In in fair "driver" condition with some pitting- $5 each or $10 for all. 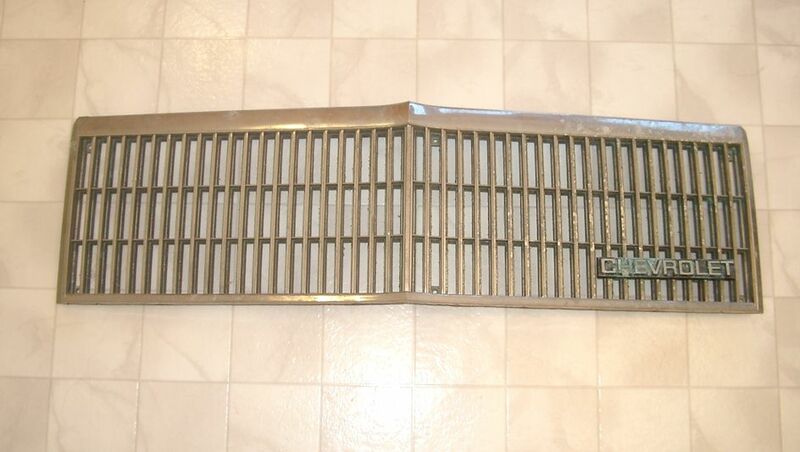 1971 Lincoln Continental Center Grille Assembly - D1VB-3418-AA. Aged condition. Some bends and cracks to top & bottom bars - $10. 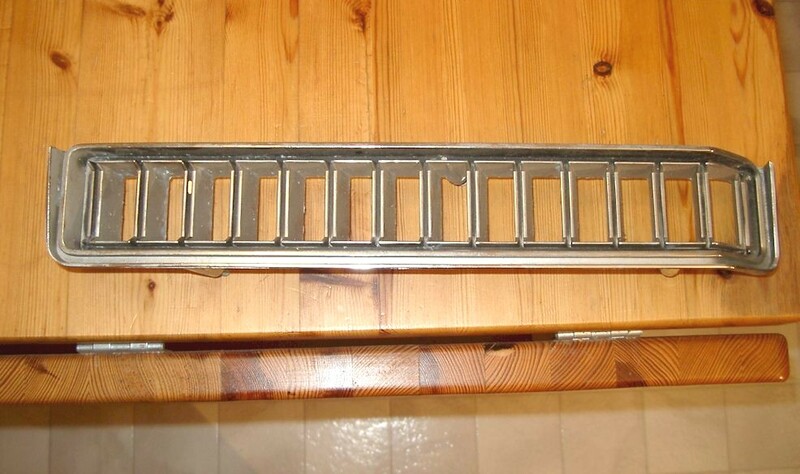 1971 Lincoln Continental Upper Grille Molding - D1VB-8418-AA. In in fair "driver" condition - $10. 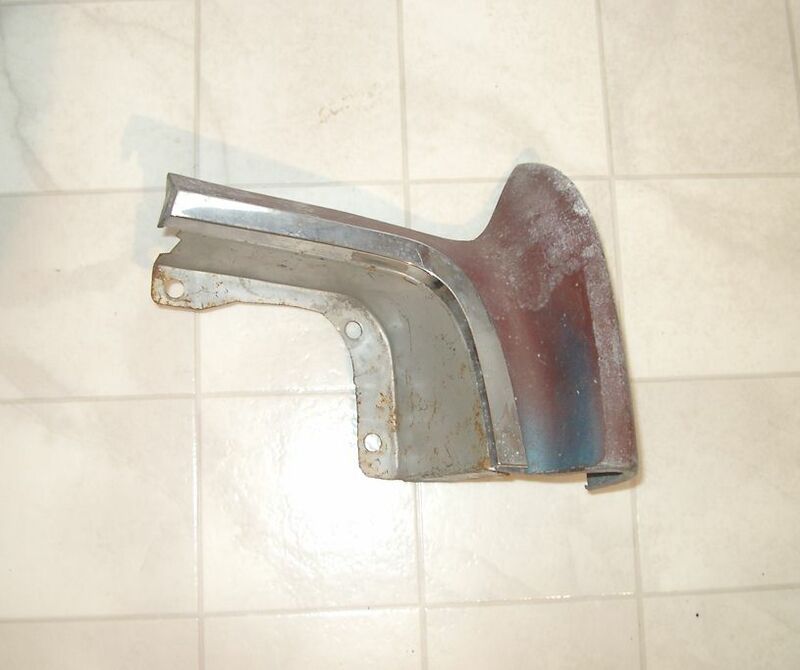 1973 Lincoln MkIV Lower Right Front Fender Trim - In driver condition with some pits and a damaged stud. 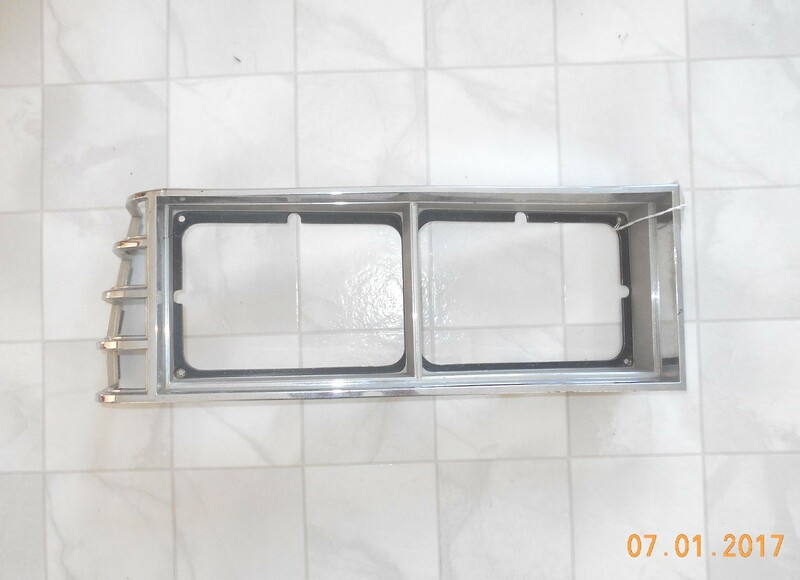 Part # D3LB-15A224-AB - $5. 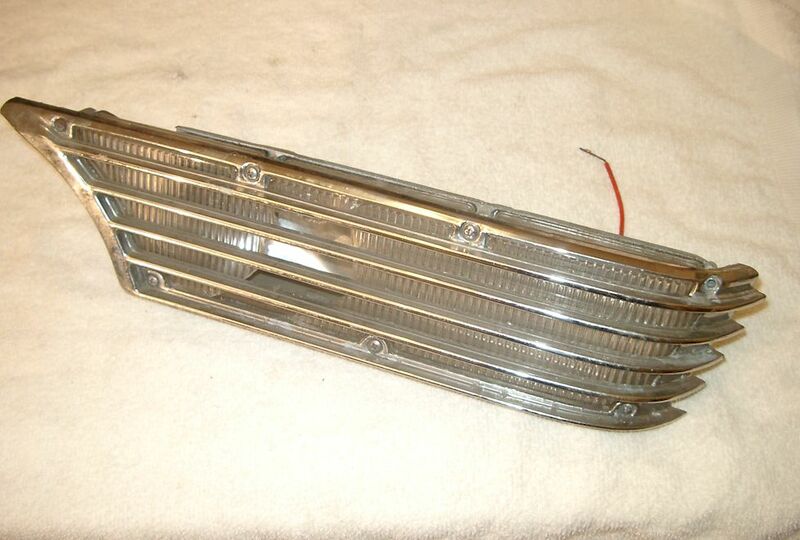 1959 to 1967 Mercedes Benz W111 Sedan Taillight LH - Missing outer lens. Small crack on centre lens at edge (hidden behind frame) - $20. 1968 Mercedes Benz 280 SE Bumper Right Hand Front - In good original "driver" condition. A couple of minor dings and one scrape - $50. 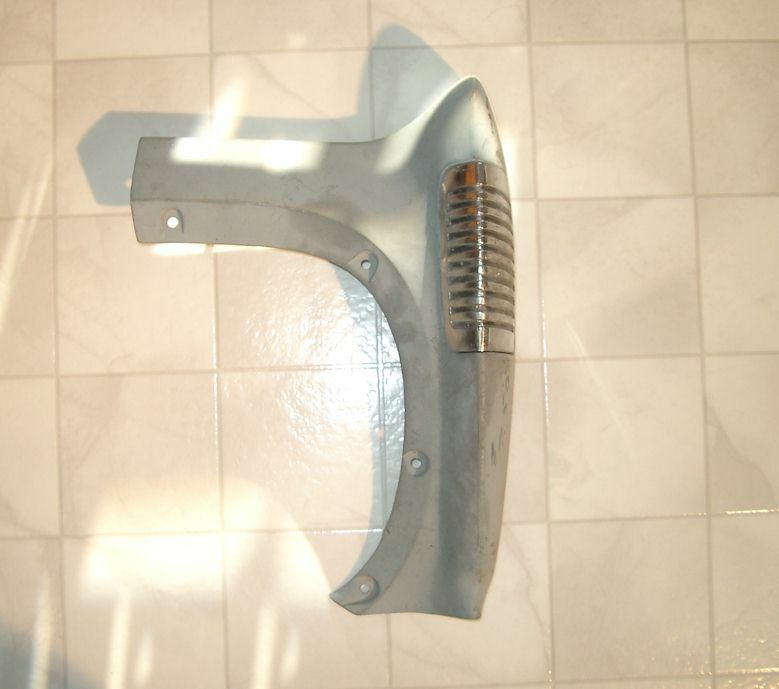 1964 Mercury Comet Front Fender Extension LH - In good condition. Includes outer trim piece. Part # C4GB-16C205-B - $SOLD. 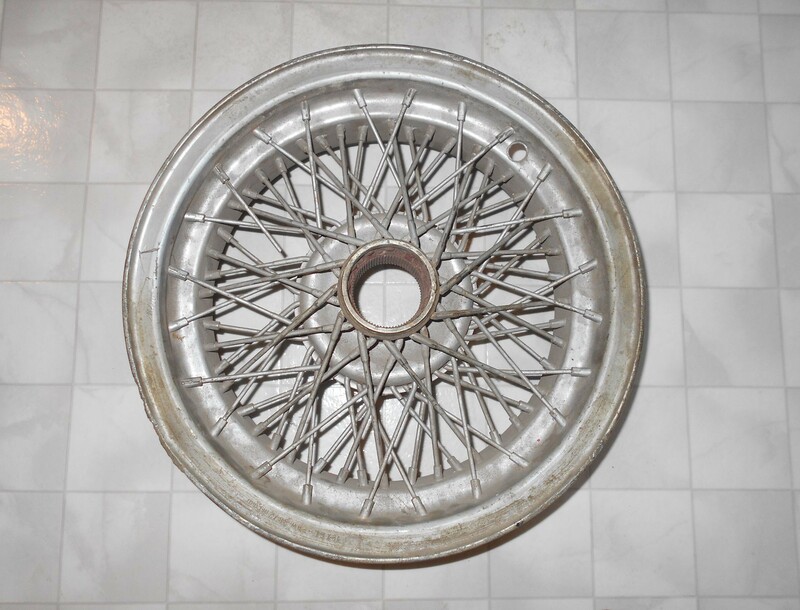 1965 Mercury Comet Hub Cap - Full wheel cover in driver condition with many small paint scratches - $10. 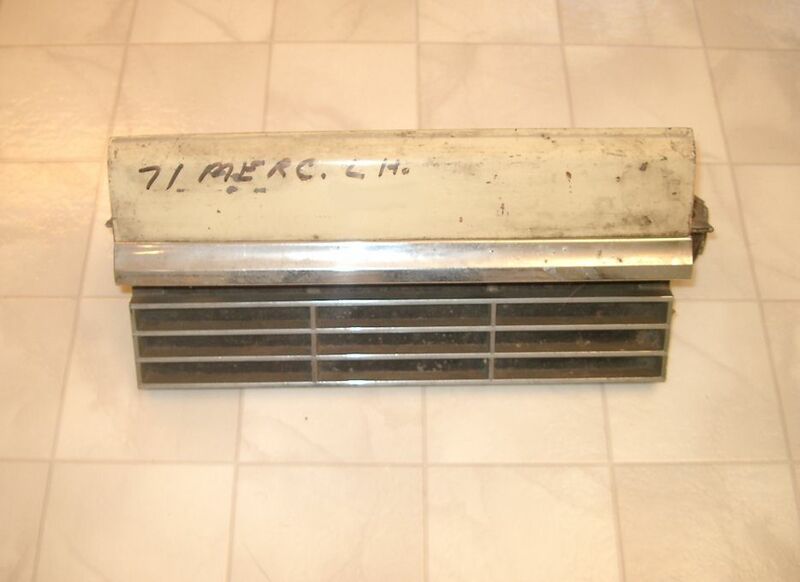 1967 Mercury Comet Grille LH - In good original condition. Some minor nicks and a slight bend in its centre - $20. 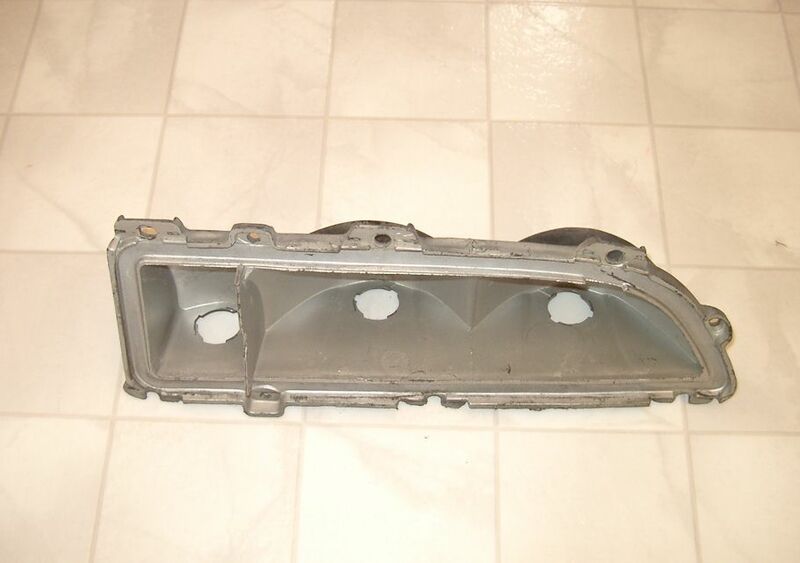 1967 Mercury Cougar Headlight Door LH - Part # C7WB-13A139. In good original condition - $20. 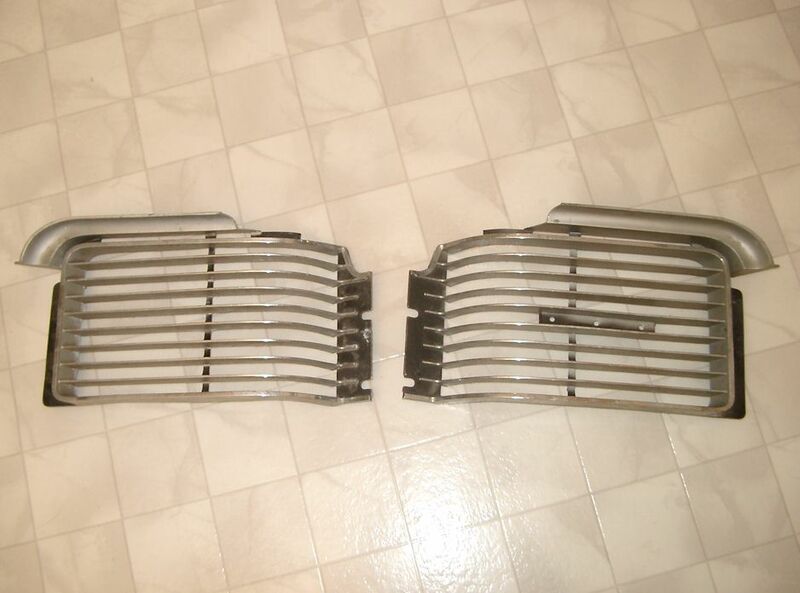 1968 Mercury Comet Grille - One complete as pictured - $80. One centre section and side section - $20. 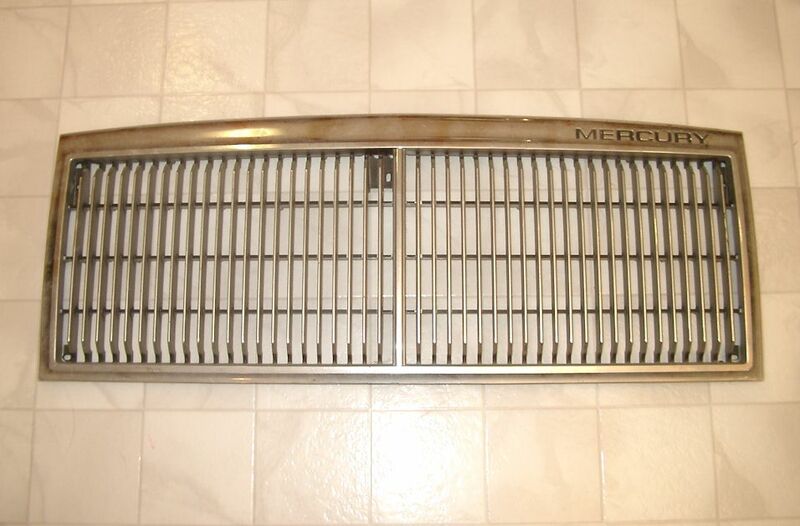 1968 Mercury Cougar Grille LH - Part # C8WB-9151. In good original condition. Good for a driver -$20. 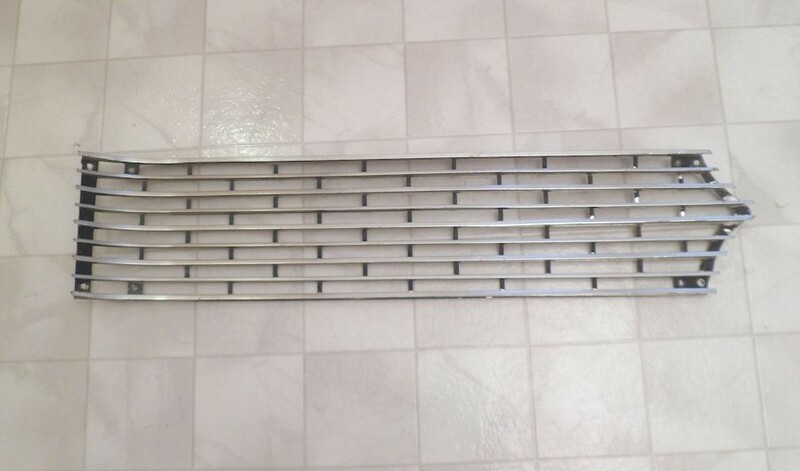 1968 Mercury Montclair / Park Lane Grille Assembly - Part # C8MB-8150-A. In good original condition - $SOLD. 1969 Mercury Marquis Center Bezel Rear Panel - Pt.# C9MB-13449-B. In aged original condition. No cracks - $15. 1969 Mercury Marquis Front Fender Lower Trim & Side Marker Light LH - FoMoCo Pt. # C9MB-15A441-A. Minor crack & pits - $10. 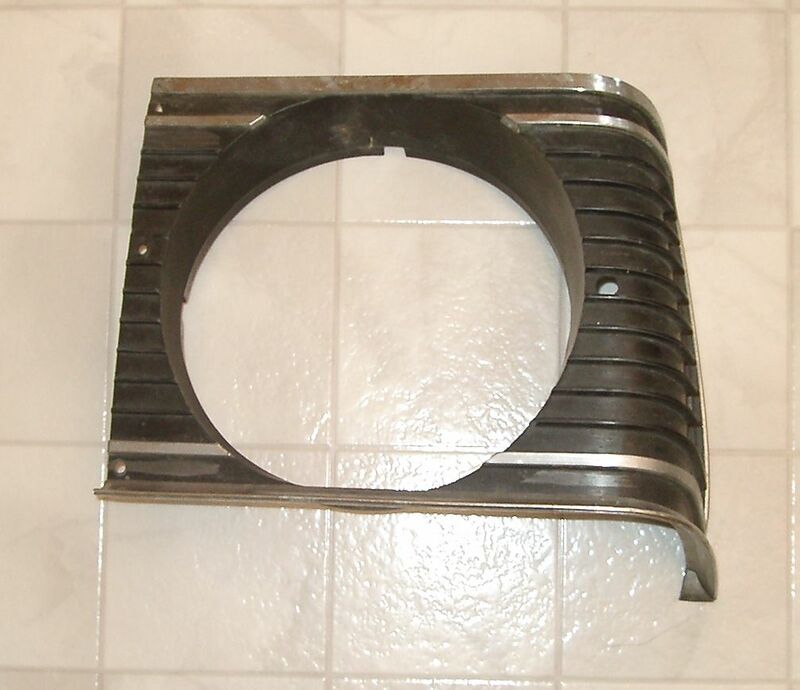 1969/1970 Mercury Marquis Headlight Door and Trim - Part #'s C0MB-13A139-A and D0MB-13B030-A. In good condition - $20. 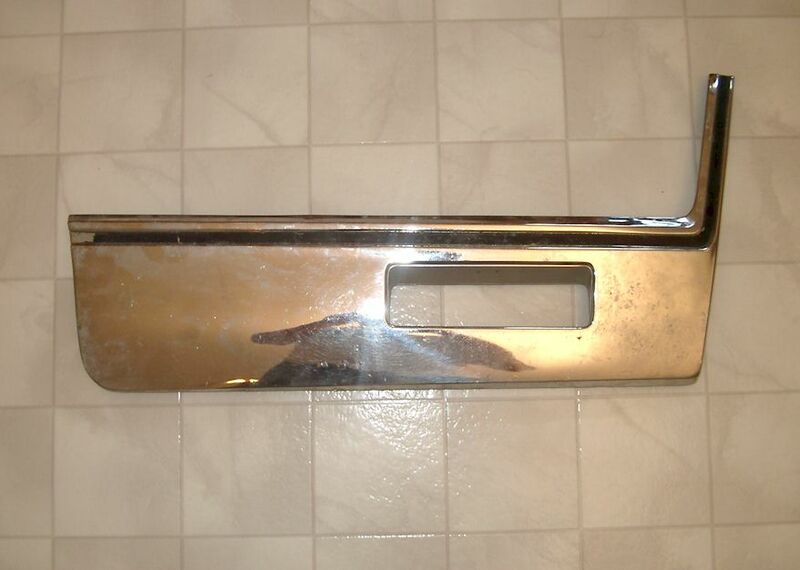 1969 Mercury Marquis Taillight Bezel Left - Pt.# C9MB-13504-A. In good original condition. No cracks. Two available - $20. 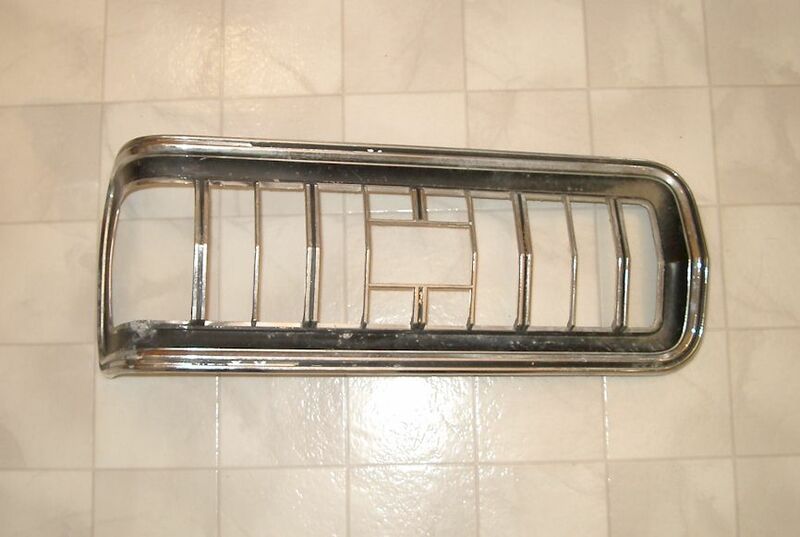 1969 Mercury Monterey Grille - Part # C9MY-8200-A. In good driver condition. A few minor dings. Same as Meteor - $20. 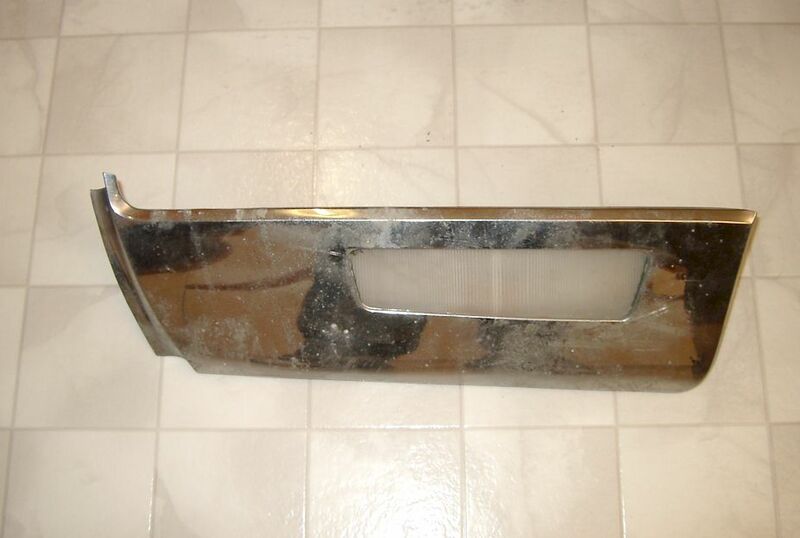 1970 Mercury Cougar LH Quarter Panel Extension - Good condition. One minor repair. Includes trim & light. Pt.# D0WB-6528519-A - $20. 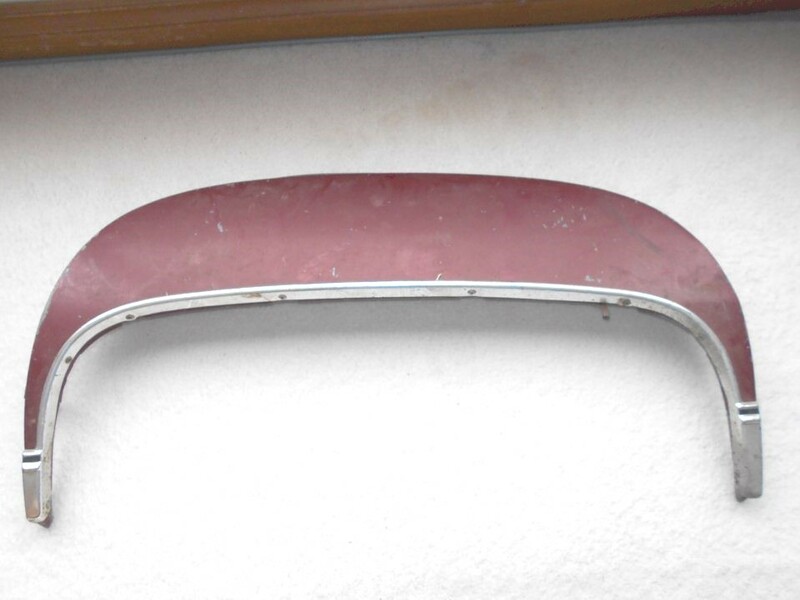 1970 Mercury Marquis Front Fender Lower Trim LH - FoMoCo Pt. # D0MB-15A441-A. In very good condition. May be NOS - $20. 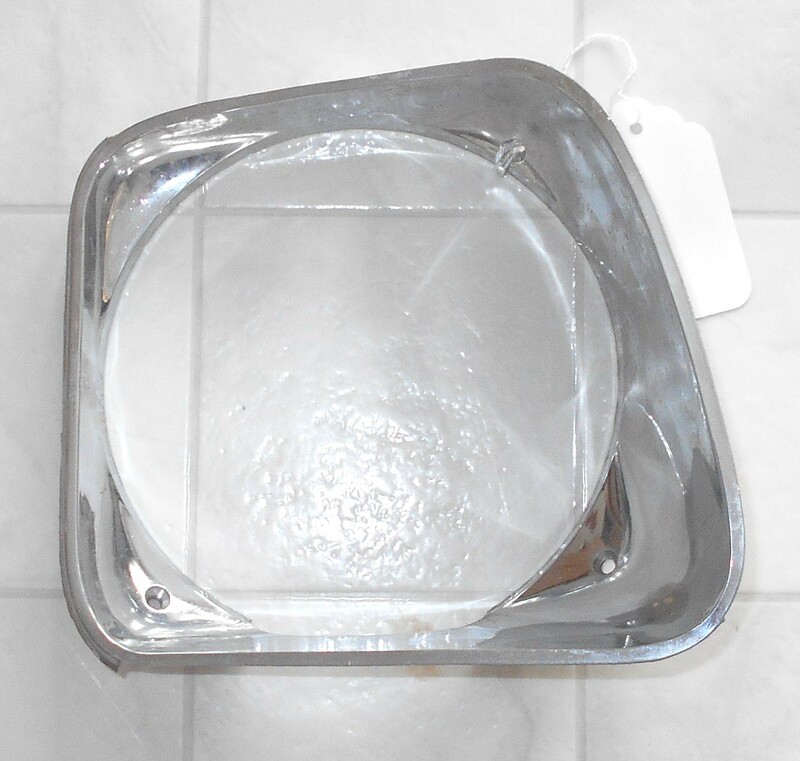 1971 Mercury Cougar Headlight Bezel - Part # D1WB-13064. In good driver condition - $10. 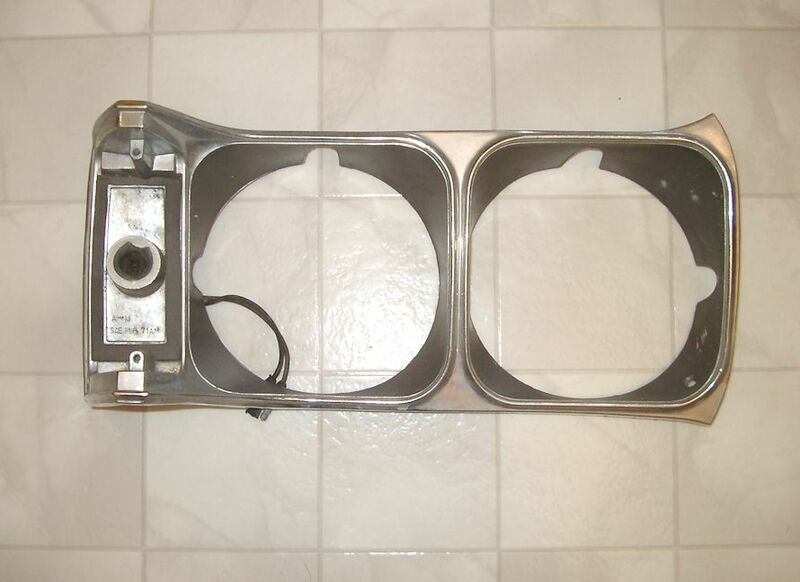 1971 Mercury Marquis Headlight Door LH - Part # D1MB-13A138-AB. In good original condition. Includes trim - $20. 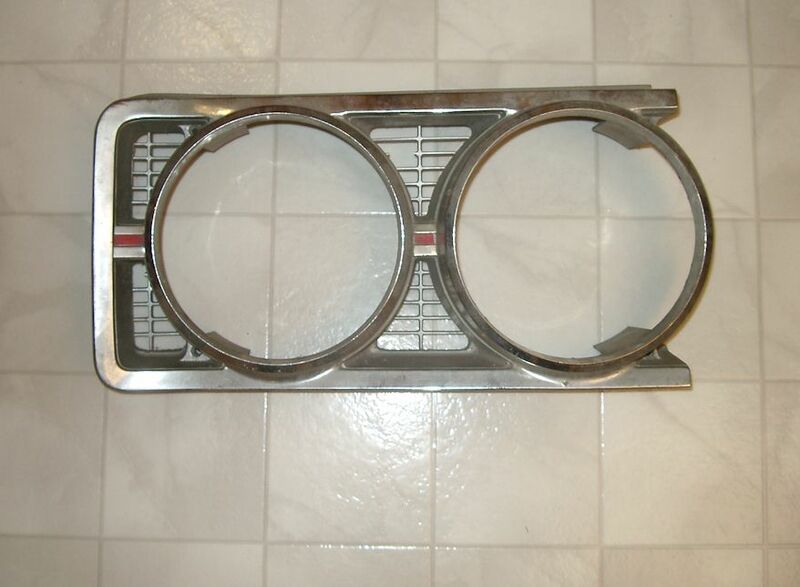 1973 Mercury Montego Headlight Bezel RH - D3GB-13052-AA. In good original condition. Two minor repaired cracks at long mounts - $20. 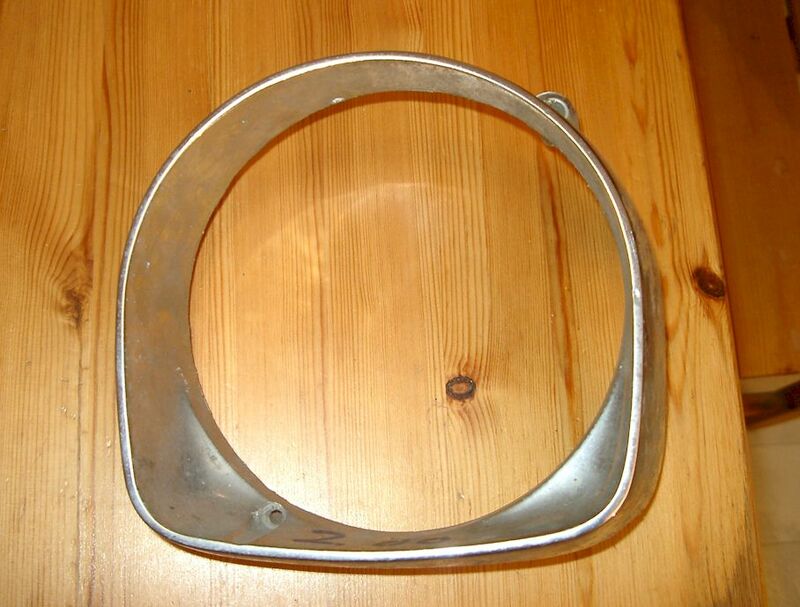 1974 Mercury Cougar Headlight Bezel - Part # D4WB-13064-AA. Two available. In good driver condition. Some pitting - $20 each. 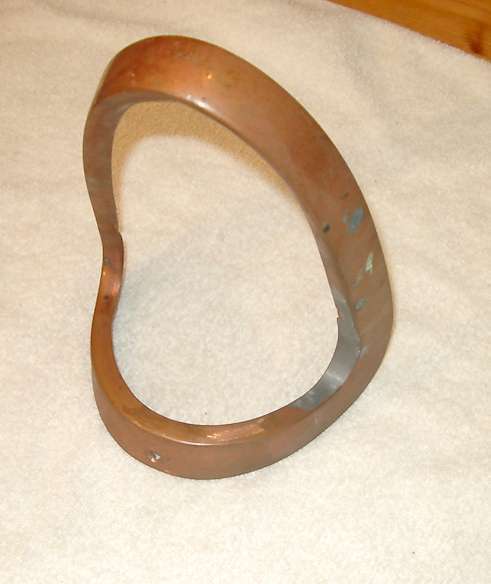 1974 Mercury Cougar Headlight Bezel Trim - Part # D4WB-13B190-AA - In good original condition - $10. 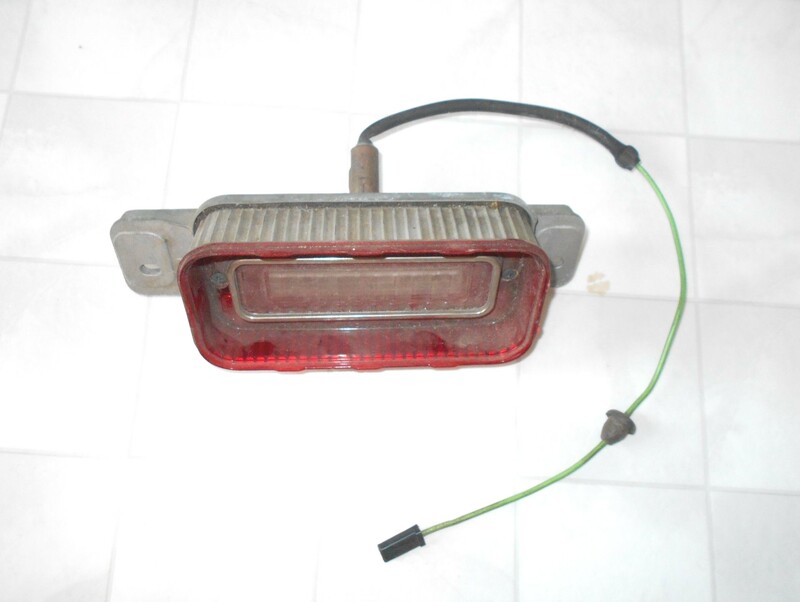 1974 Mercury Cougar Taillight Bezel LH - Part # D4WB-13504-AB - In driver condition with some corrosion and pitting - $10. 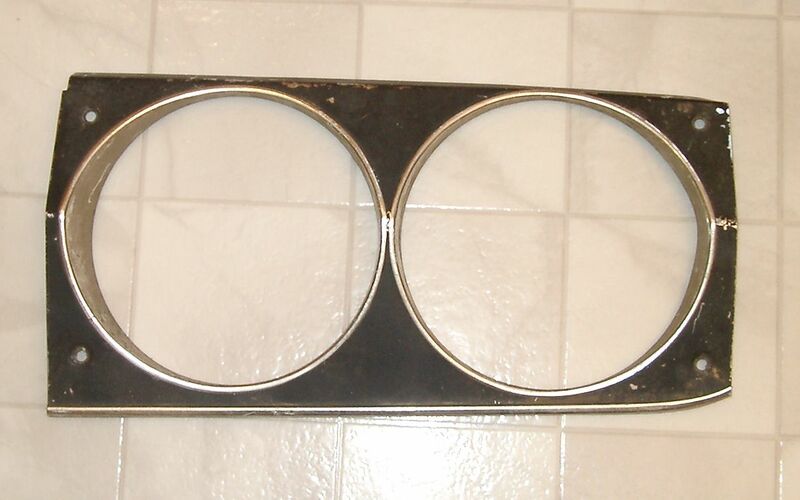 1979 to 1982 Mercury Zephyr Headlight Bezel Door NOS - Part # D9KB-13052-AWE. In very good condition - $30. 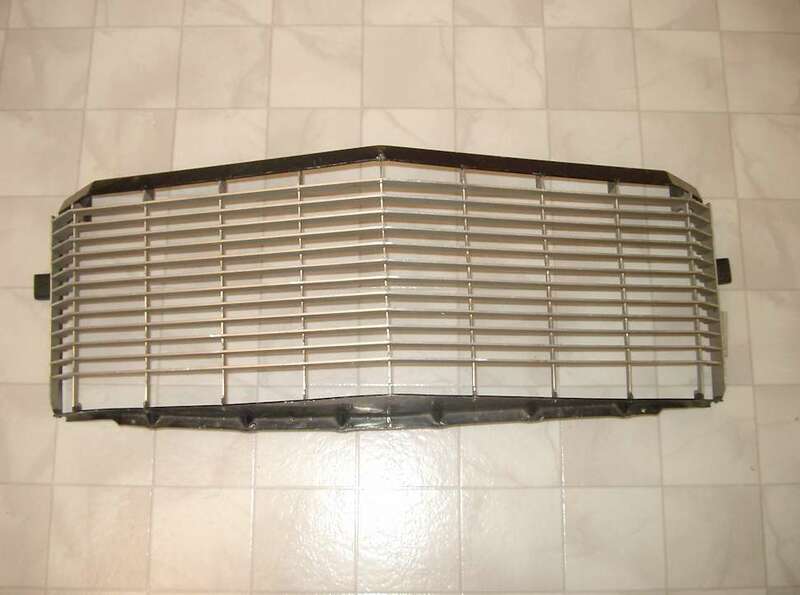 1981 Mercury Cougar Grille - Pt.# E14B-8150-AWF. In very good condition - $40. 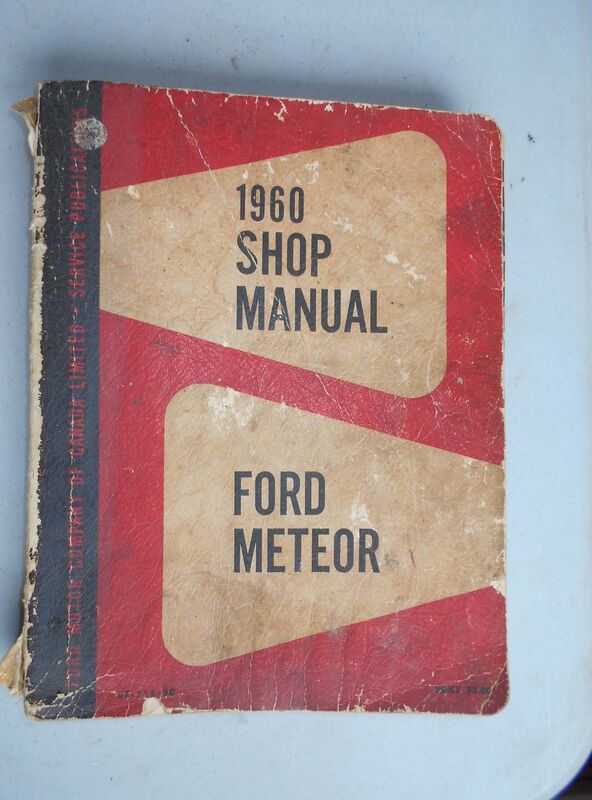 1960 Meteor Shop Manual - Ford of Canada. Lots of cover and spine wear but complete - $20. 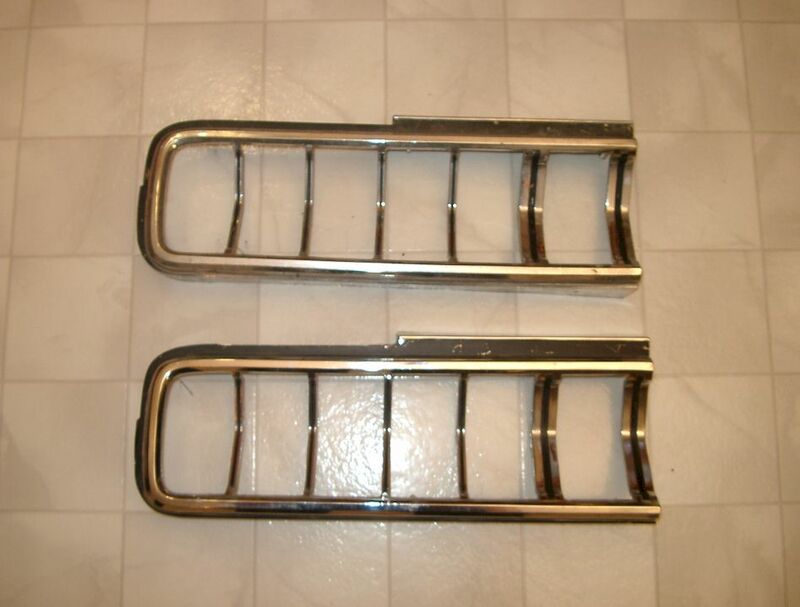 1967 Meteor Grille - Part number C7MB-8150-D. Cracked & professionally repaired. Rare Canadian piece - $SOLD. 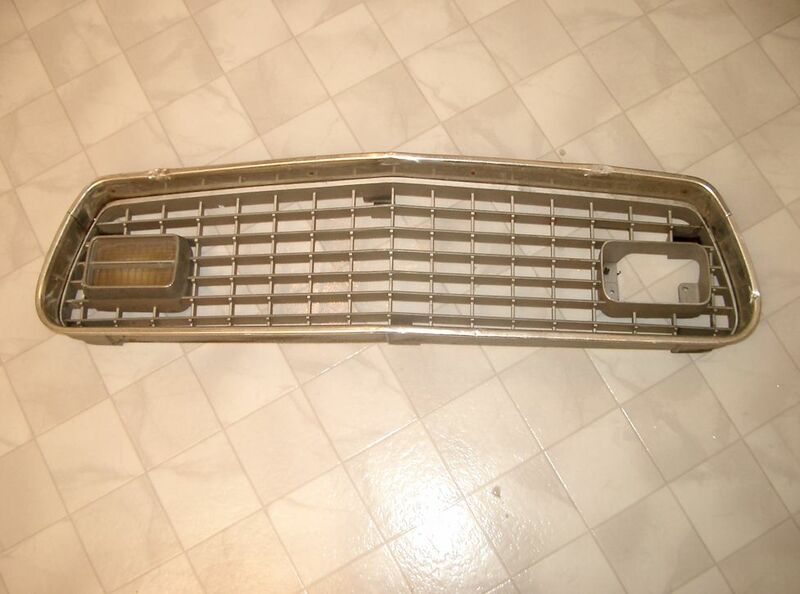 1969 Meteor Grille - Part # C9MY-8200-A. In good driver condition. A few minor dings. Same as Monterey - $20. 1959 to 1967 Magnette MkIII and MkIV Grille - No emblem. In poor condition with dents and cracks. For parts or restoration - $SOLD. 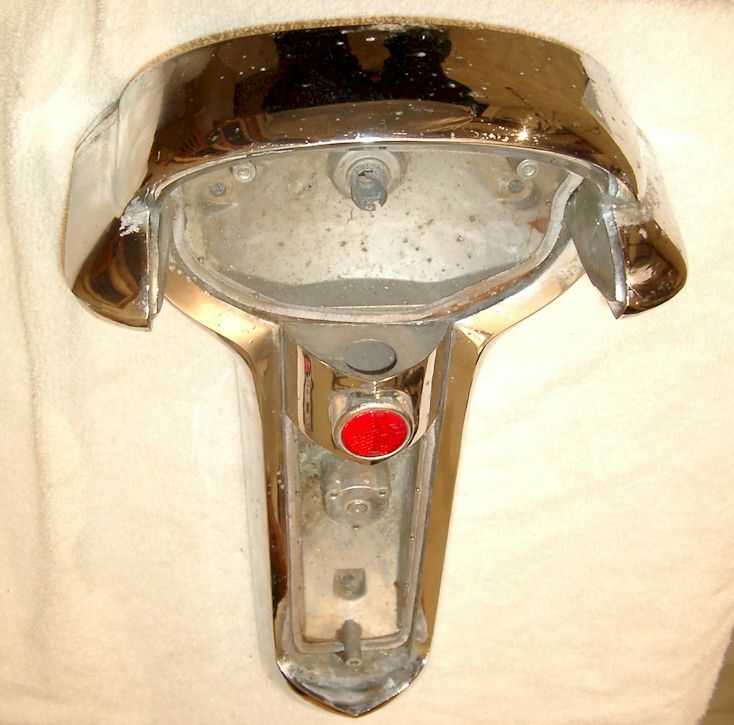 1956 Nash Statesman or Ambassador Tail Light Housing - Part number CB 25298. Chrome shows many small pits. Driver quality - $20. 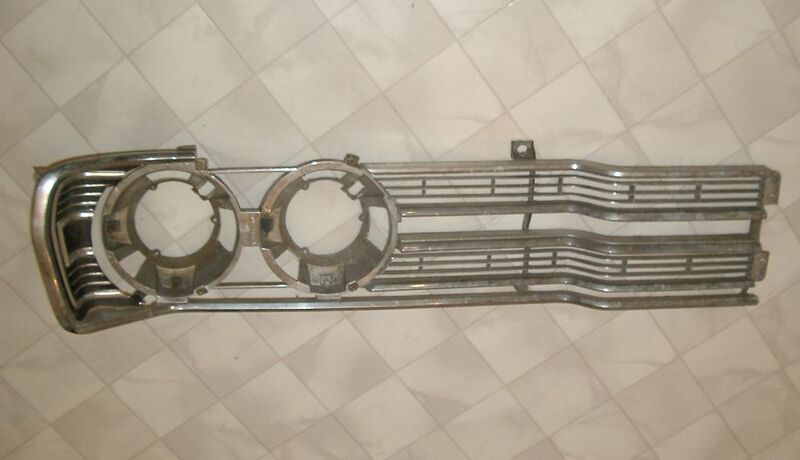 1960 Oldsmobile Right Hand Grille Assembly - Pt. # 577364. 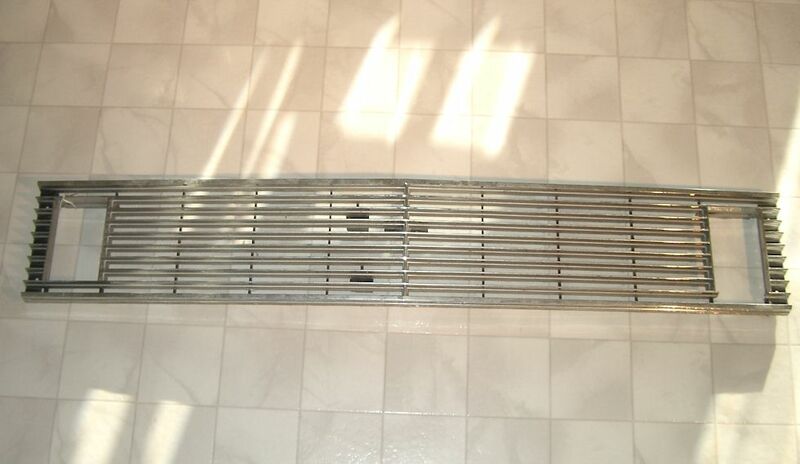 Some corrosion on outside edge but this should be hidden when installed - $20. 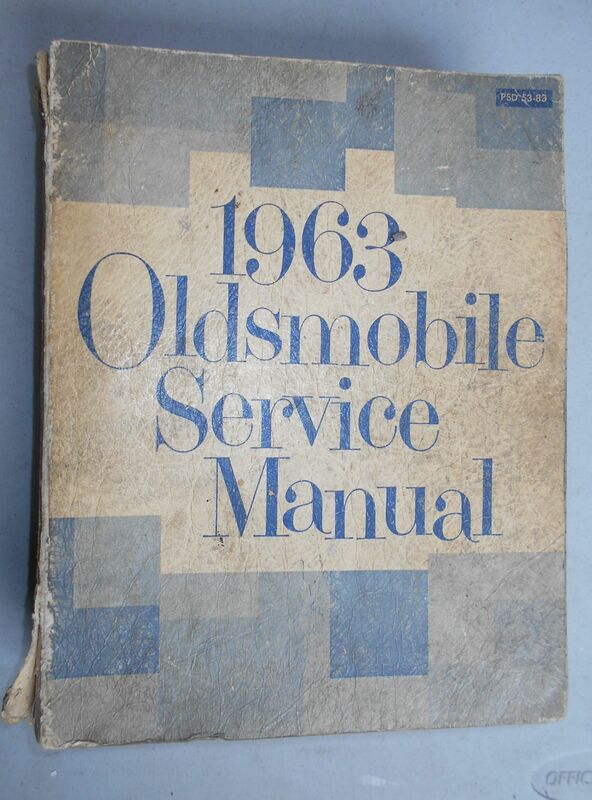 1963 Oldsmobile Shop Manual - GM of Canada. Lots of cover and spine wear but complete - $20. 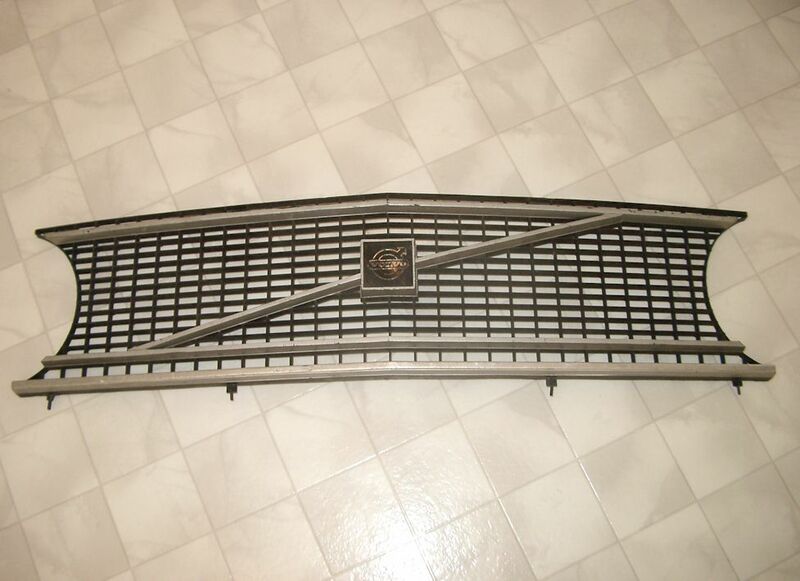 1963 Oldsmobile Starfire Grille LH - In good condition outside of a slight bend in its centre - $20. 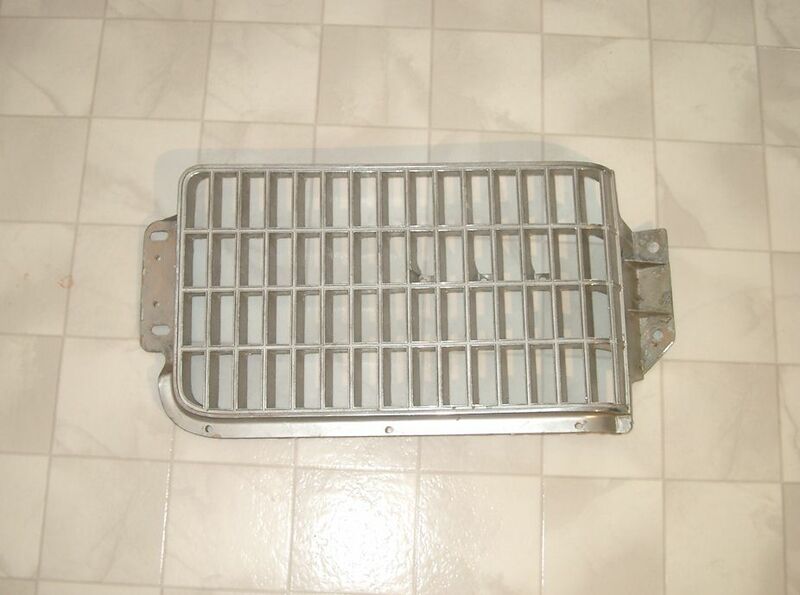 1963 Oldsmobile 98 Grille LH - Part number 586679. In good original condition - $50. 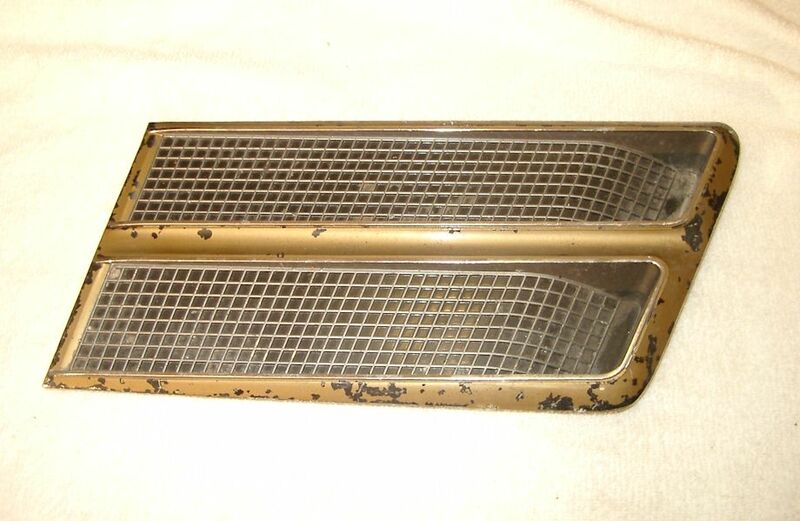 1964 Oldsmobile Jetstar Grille - Pt. # 5718588. In good overall but aged original condition. Good for a driver - $40. 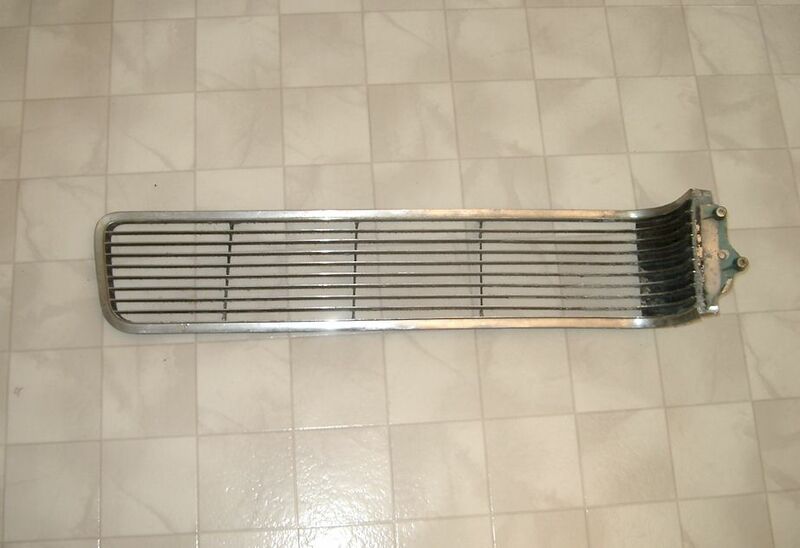 1964 Oldsmobile Starfire Grille - In aged condition with a cracked and bent bottom bar. Centre piece aged but useable. For restoration - $20. 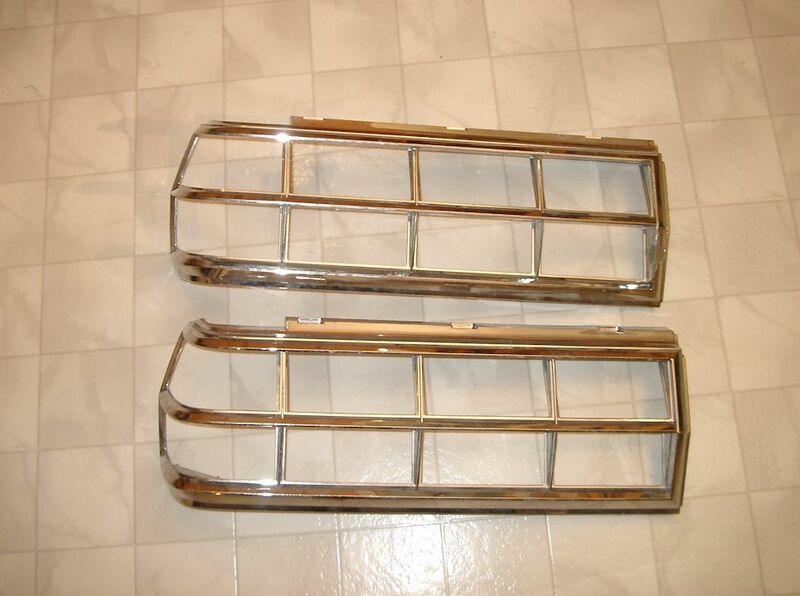 1965 Oldsmobile Delta 88 Holiday Coupe Body Side Moldings - Part #'s 387149 (LH), 387148 (RH), 4477578 (LH), 4477577 (RH), 4481787 (LH), 4481698 (LH). In driver condition with some pitting and paint loss- $10 each. 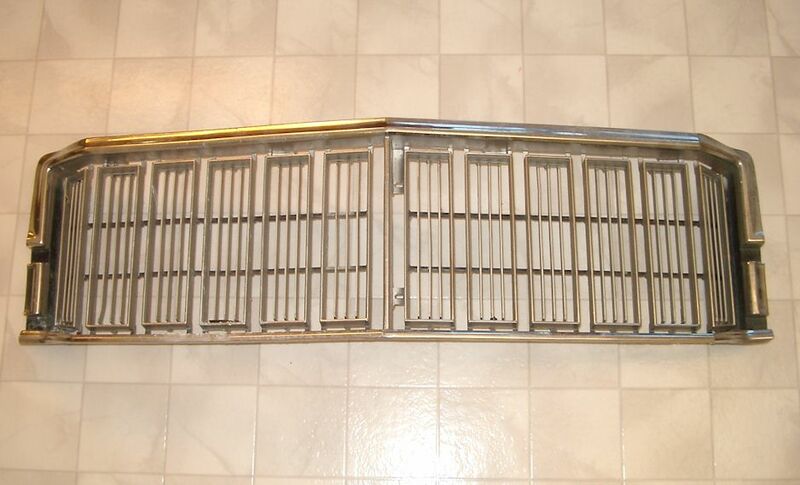 1965 Oldsmobile F-85 / Cutlass Center Grille Section - Part # 589789. This has been cracked and repaired. Useable on a driver - $10. 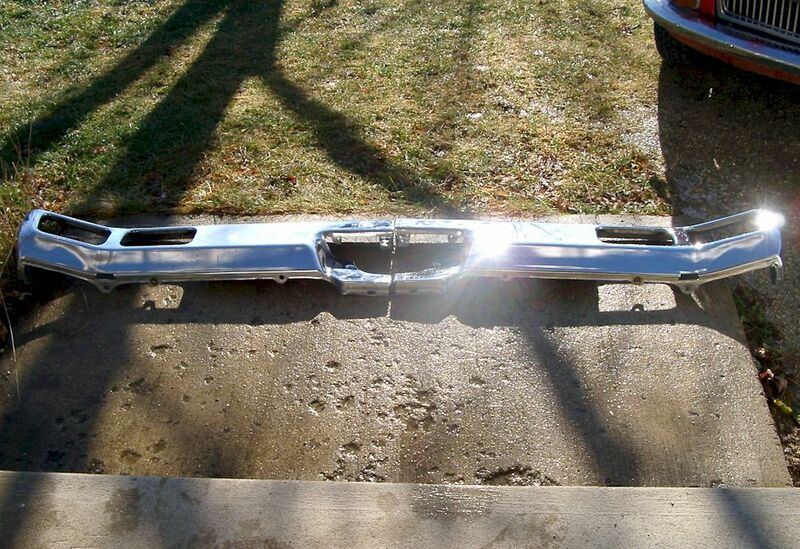 1966 Oldsmobile F-85 / Cutlass Fender Extension LH - Pt. # 390507. In aged condition with surface rust & repairs. Trim has broken stud - $SOLD. 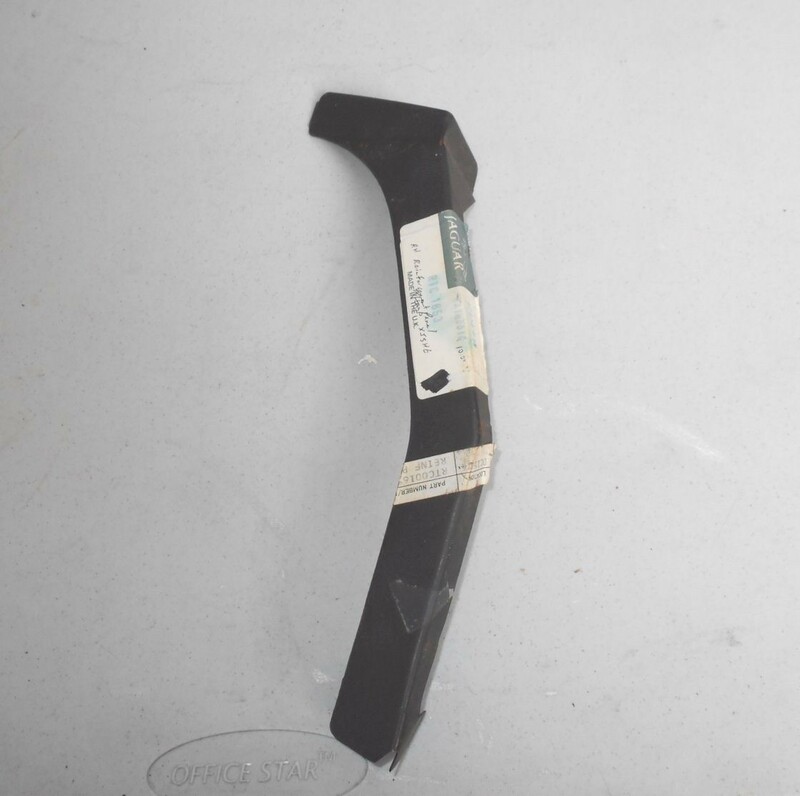 1966 Oldsmobile Cutlass Lower Rear Quarter Panel Trim RH - Part # 7650131. In good original condition - $20. 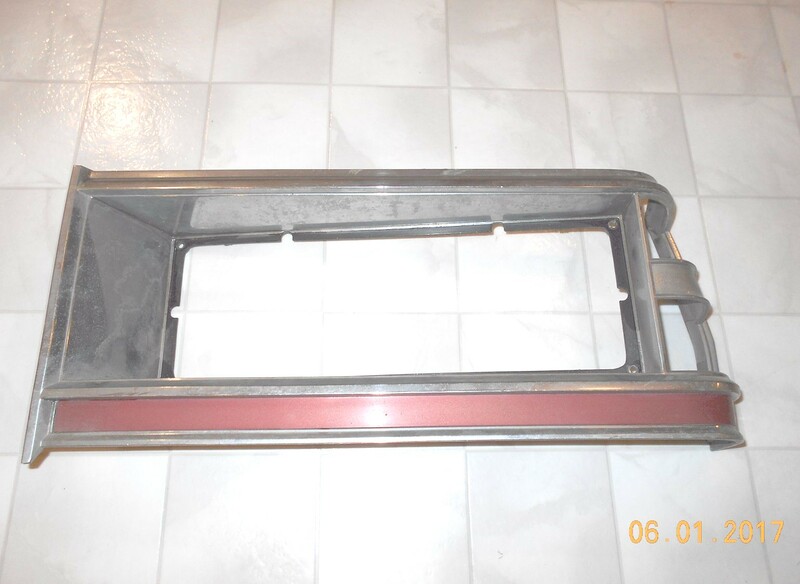 1966 Oldsmobile Delta 88 Tail Light Trim RH - Pt. # 5957842. One repaired crack along bottom edge (behind bumper when installed) - $5. 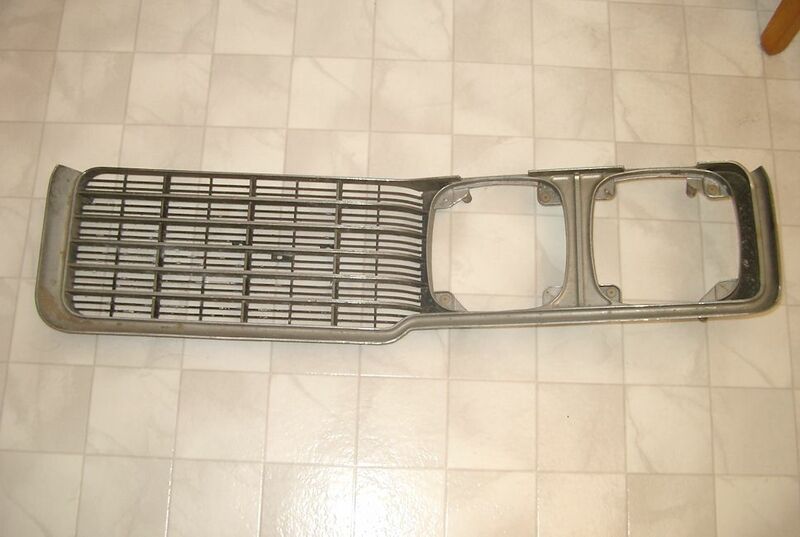 1966 Oldsmobile Jetstar 88 Grille Assembly - Pt. #529912. In good original condition. Two available - $50 each. 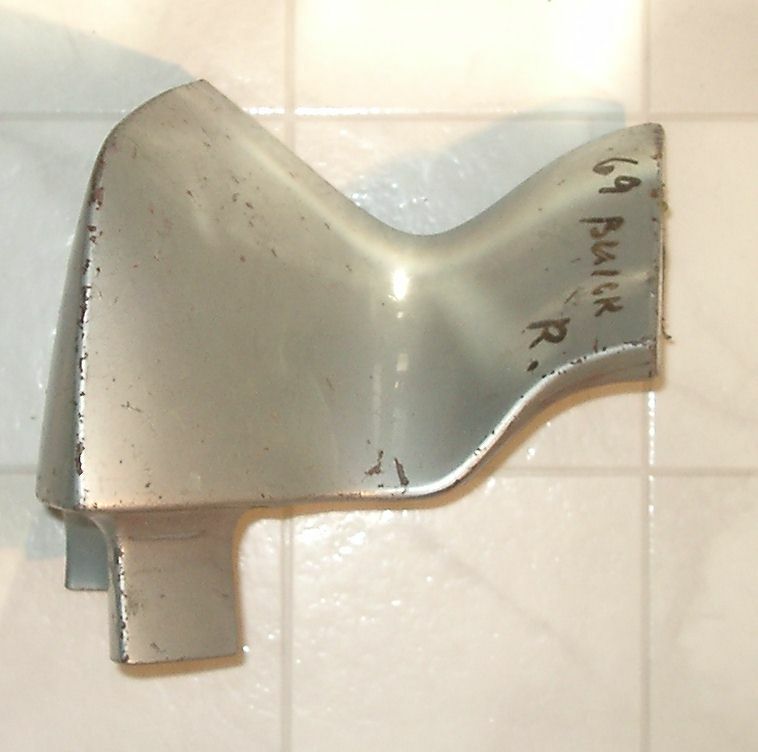 1967 Oldsmobile Cutlass Front Fender Extension RH - Part # 393322. One small repaired crack. Includes trim - $SOLD. 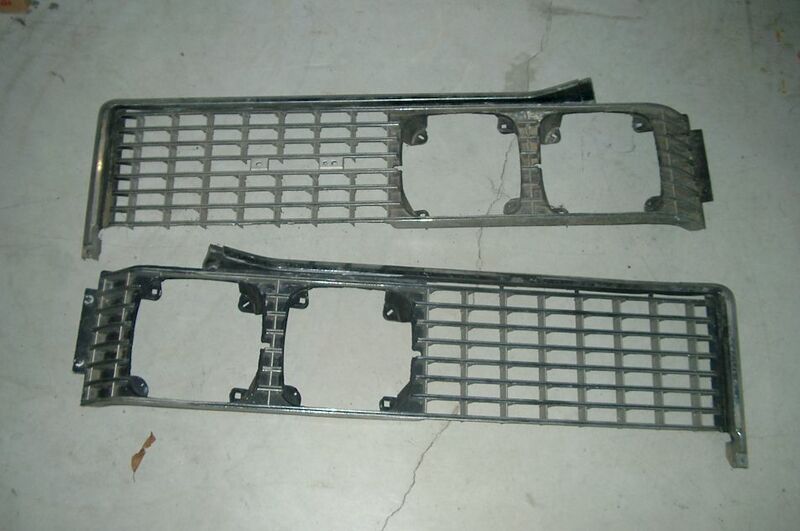 1967 Oldsmobile Delta 88 Grille Centre - In aged condition with repaired cracks and two damaged tabs. Emblem broken. Pt. # 394498 - $10. 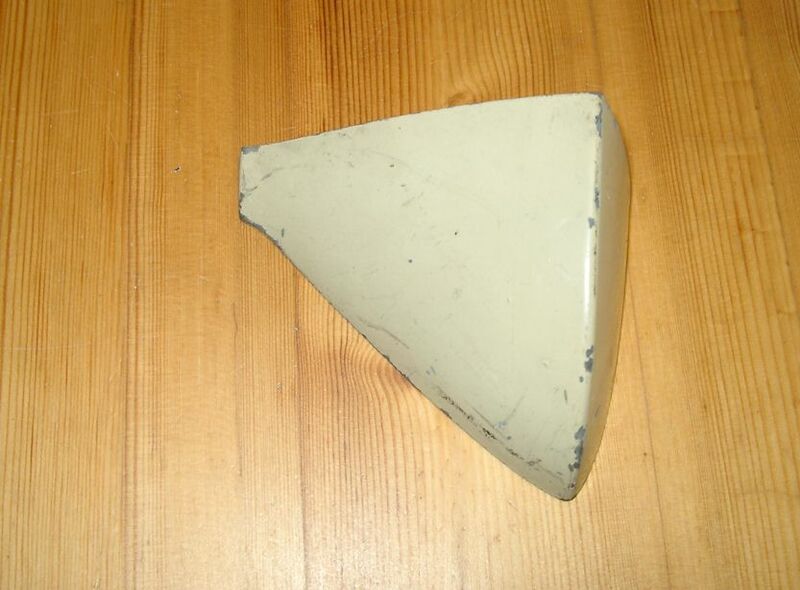 1967 Oldsmobile Delta 88 Turn signal Lens and Frame - Frame Pt. # 5958983, lens 5958979. Lens good, frame has crack at mounting screw - $10. 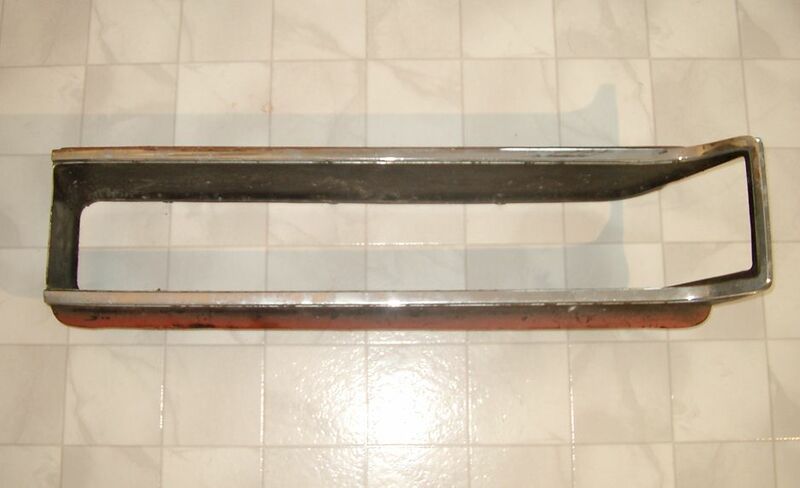 1968 Oldsmobile Delta 88 Quarter Panel Extension - Part # 7720346. Some surface corrosion. Includes good trim piece - $10. 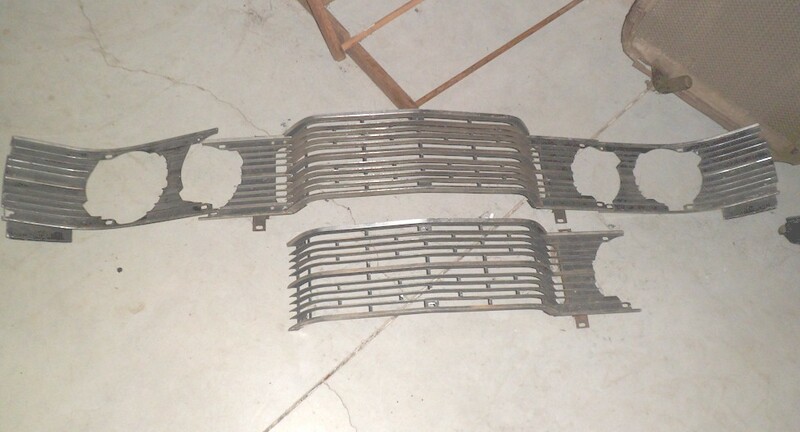 1968 Oldsmobile Delta 88 Grilles Left and Right - Pt. # 698390 and 698391. In driver condition with some professional repairs - $10 each. 1968 Oldsmobile 98 Parking Lamp Housing LH - Part #5960037. Chrome good with a few small pits. Small repaired crack at bottom. No wiring - $10. 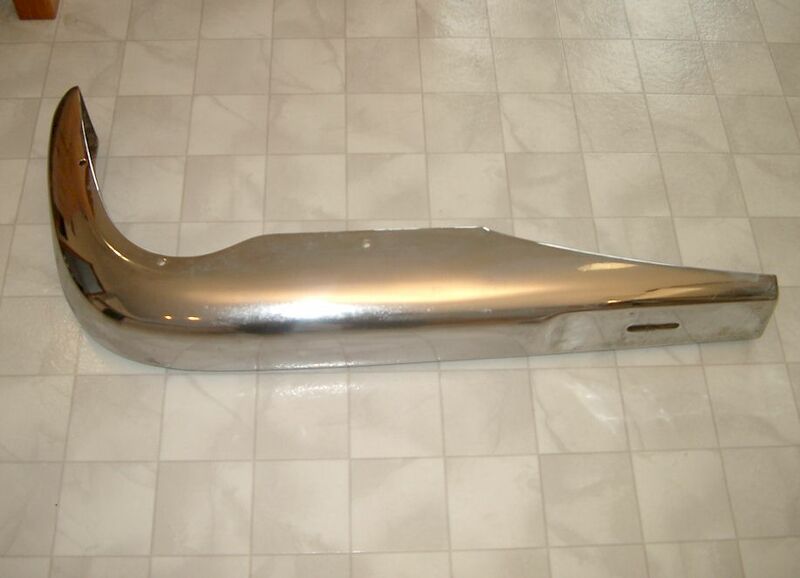 1969 Oldsmobile 88 Front Fender Extension RH - Pt. # 401678. In aged condition with surface corrosion. Includes trim and lens - $5. 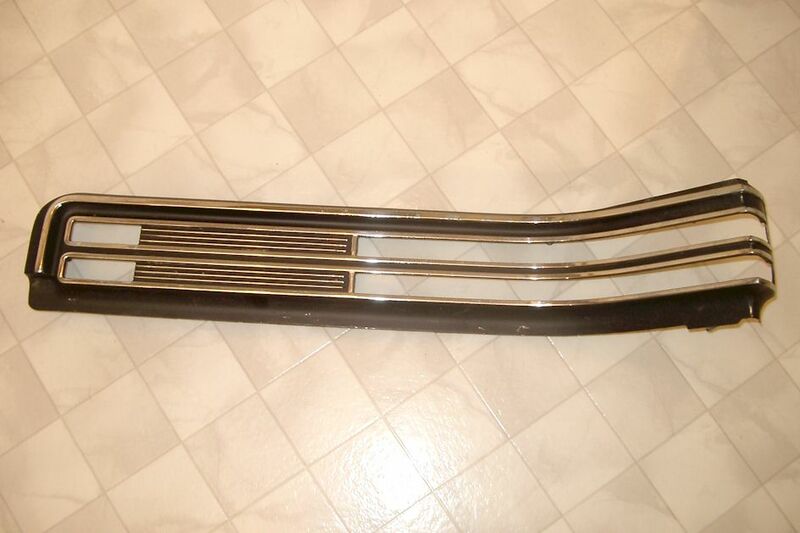 1969 / 1970 Oldsmobile 88 Rear Quarter Panel Extension RH - Pt. # 5961628. In good original condition - $5. 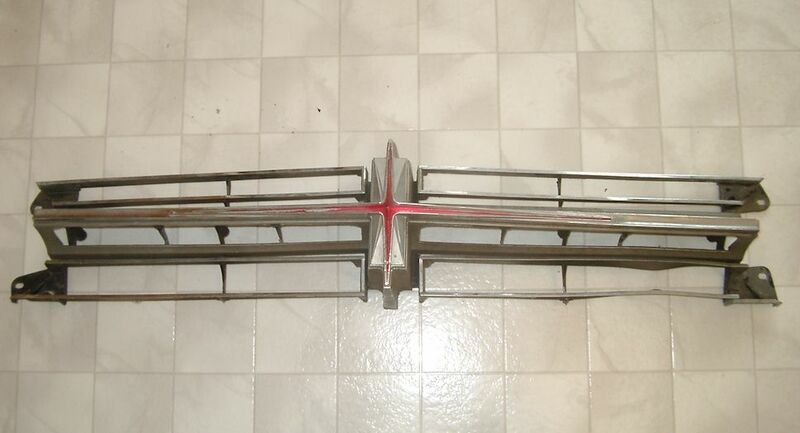 1969 Oldsmobile Delta 88 Front Grille LH - Part # 401957. In good original condition - $20. 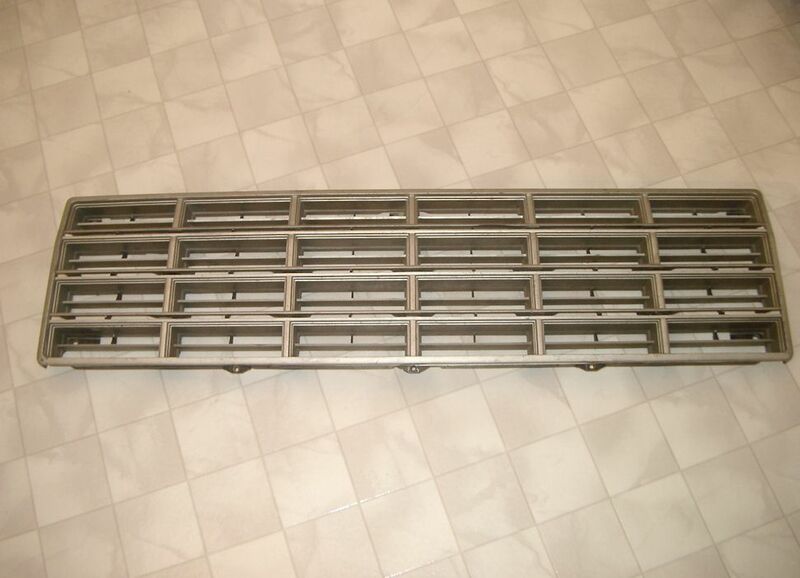 1969 Oldsmobile 98 Grille LH - Part # 401741. Two available. One as a repaired crack and slightly tweaked. One cracked but useable - $5 each. 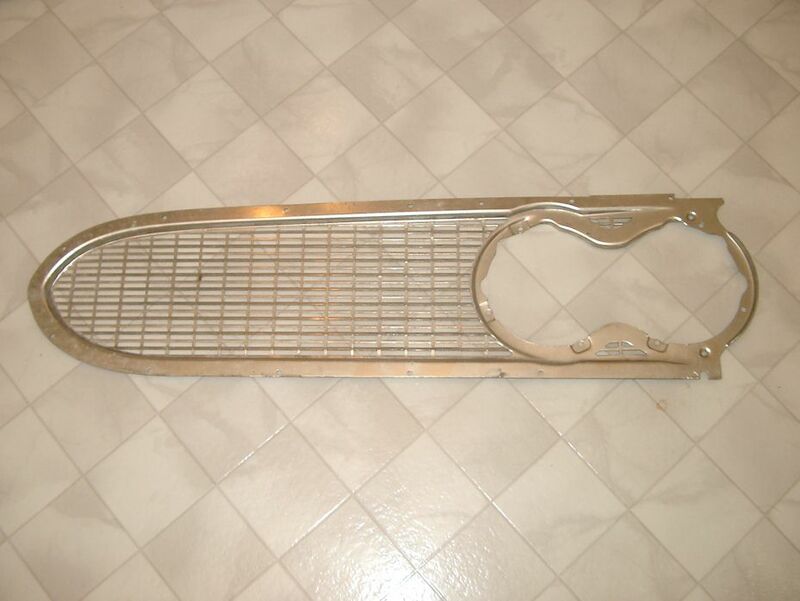 1969 Oldsmobile 98 Grille RH - Part # 401740. In aged original condition with a couple of repaired cracks - $5. 1970 Oldsmobile Delta 88 / Royale Right Side Taillight - Lens has no cracks but does show some scratches. Frame aged with one nick - $SOLD. 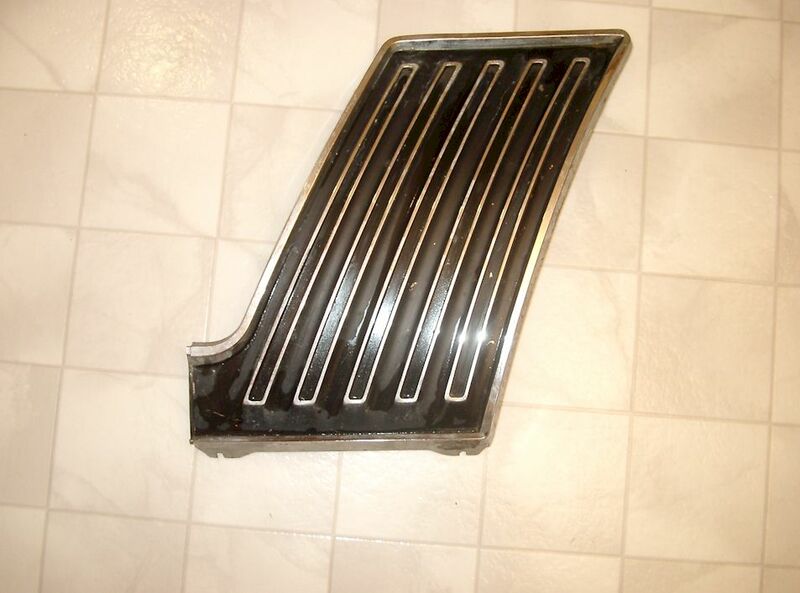 1970 Oldsmobile Delta 88 Royale Grille RH - Part # 405486. Two available in driver condition. One has broken mounting tab. Good - $40, w/missing tab - $20. 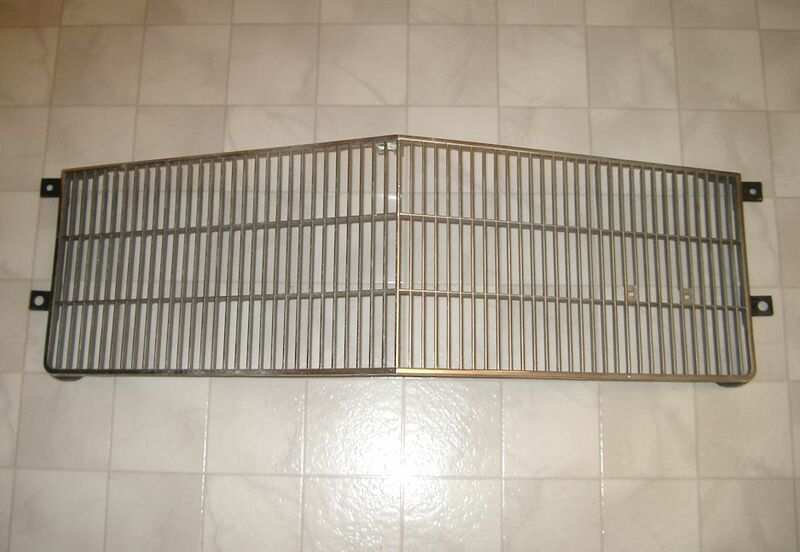 1970 Oldsmobile Delta 88 Grille - Regular 88. No part number on it. Not sure if it is left or right side. In good condition - $30. 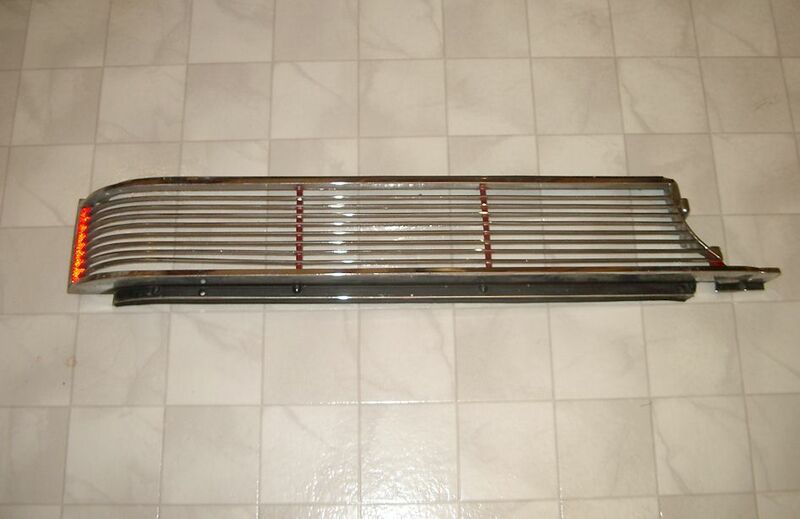 1971 Oldsmobile Delta 88 Grille RH - In good original condition. Three available. Part # 407348 - $20 each. 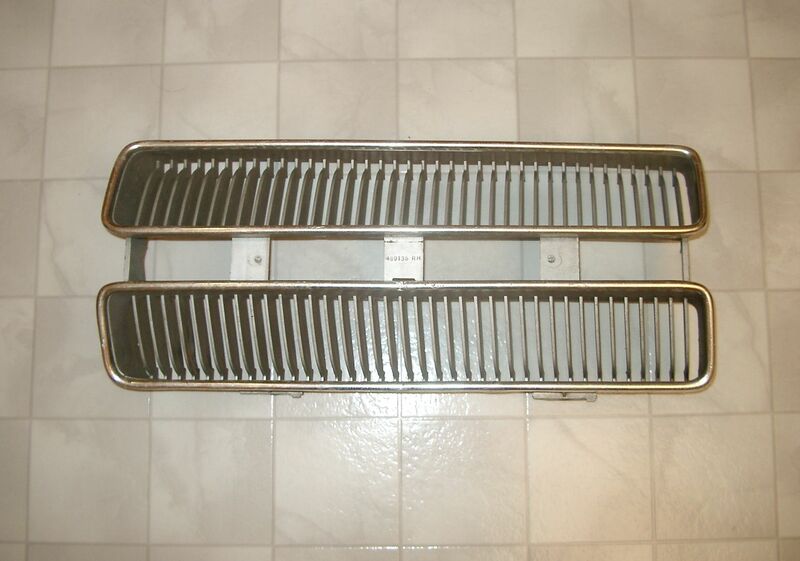 1971 Oldsmobile Toronado Grille LH - Part # 407459. In aged original condition. One stud slightly bent. One small crack top and side - $10. 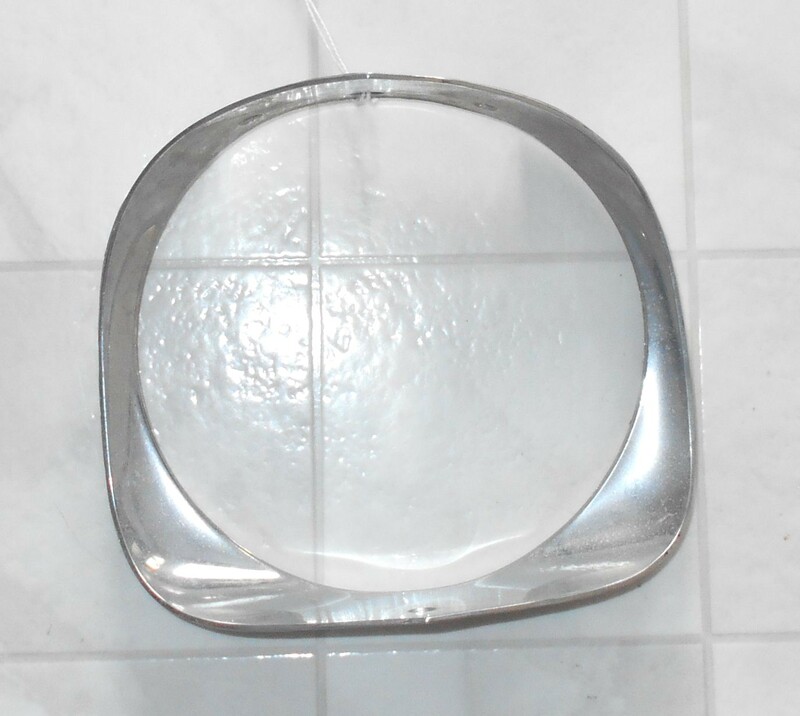 1976 1977 Oldsmobile Cutlass Headlight Bezel RH - Part #551468. In good original condition - $10. 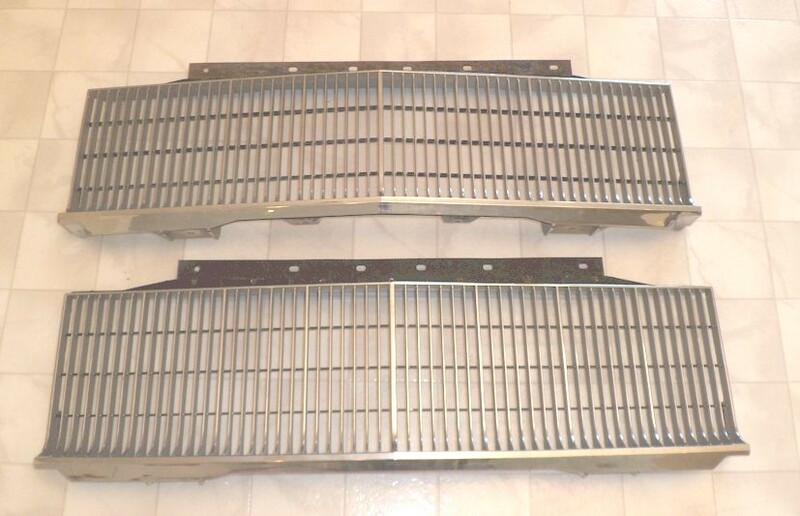 1977 Oldsmobile Delta 88 Grilles LH & RH - Part # 555318 and 555319. In good driver condition - $20 each. 1977 Oldsmobile Toronado Headlight Bezel Door RH - Part # 555256. In good condition showing only some minor blisters - $20. 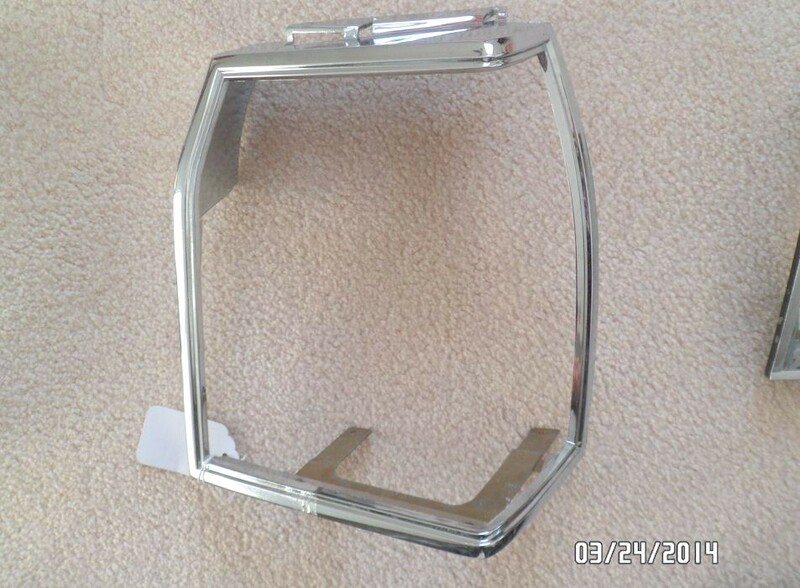 1978 Oldsmobile Omega Headlight Bezel Door RH - Part # 552290. Appears to be NOS. Some minor nicks and a scratch - $SOLD. 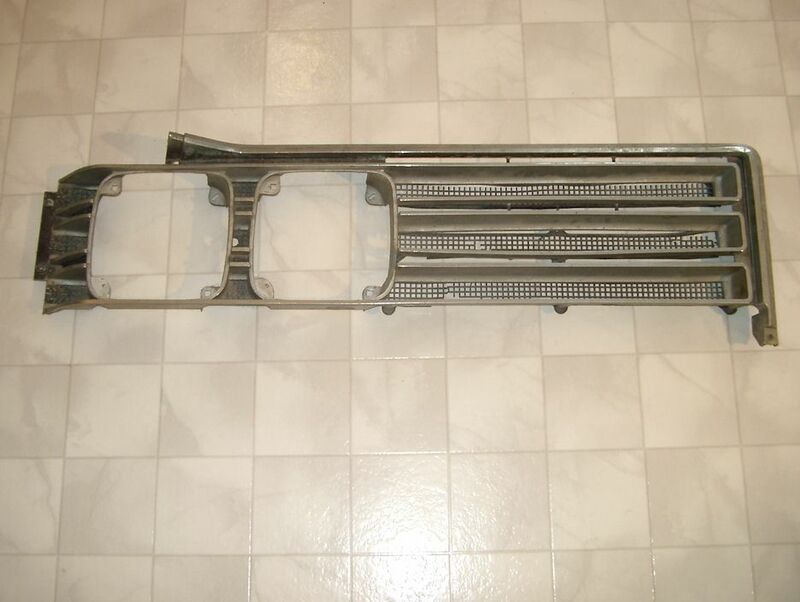 1982 Oldsmobile Cutlass Calais Grille RH - Part # 22510802. Has repaired crack on bottom edge. Out of sight when installed - $SOLD. 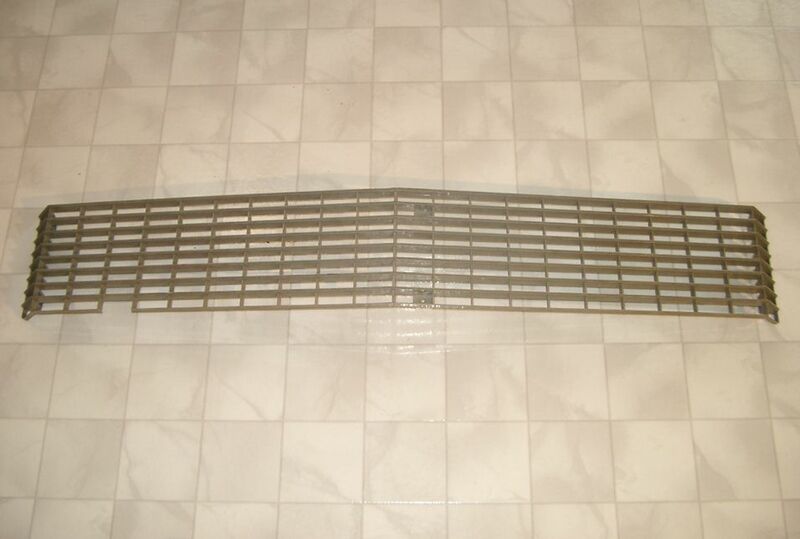 1984 Oldsmobile Cutlass Grille RH - Part # 22519954. Has a couple of repaired cracks. Won't be noticeable when installed - $SOLD. 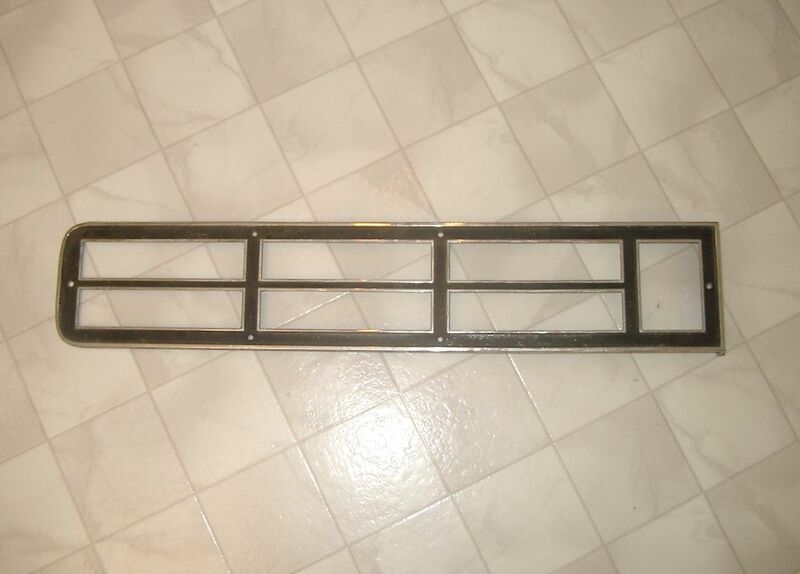 1984 & 1985 Oldsmobile Delta 88 Taillight Frame RH - Part # 5933162. Appears to be NOS but there is a damaged spot on the chrome at the bottom of the frame - $10. 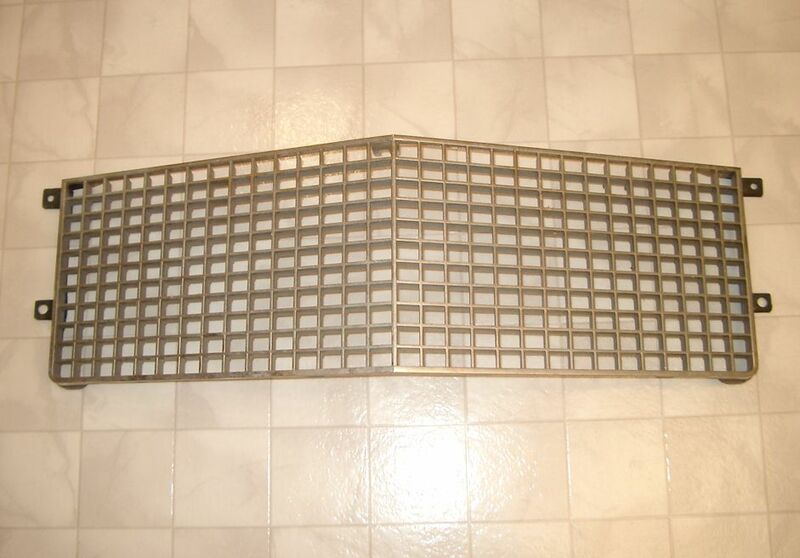 1986 Oldsmobile Cutlass Grille LH - Part # 22506831. Two available. 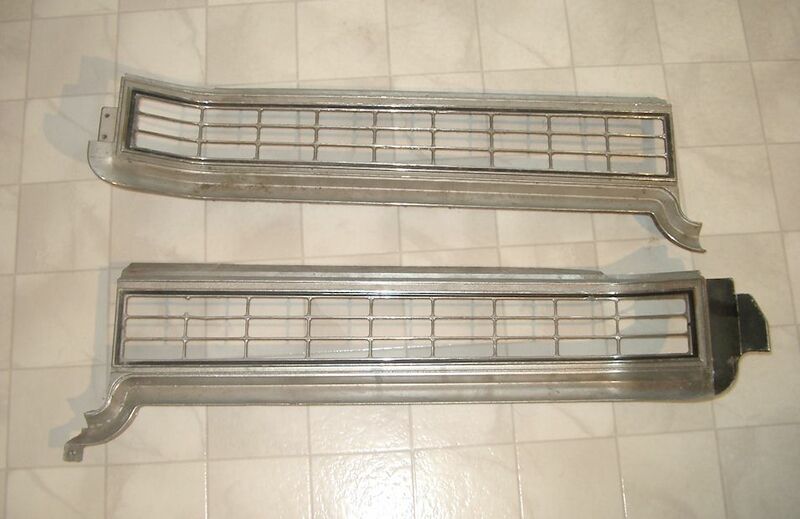 Both useable but have cracks and damaged mounting tabs - $SOLD. 1964 Plymouth Fury Headlight Bezel / Door LH - In aged original condition with some paint scratches, road abrasion and a ding - $10. 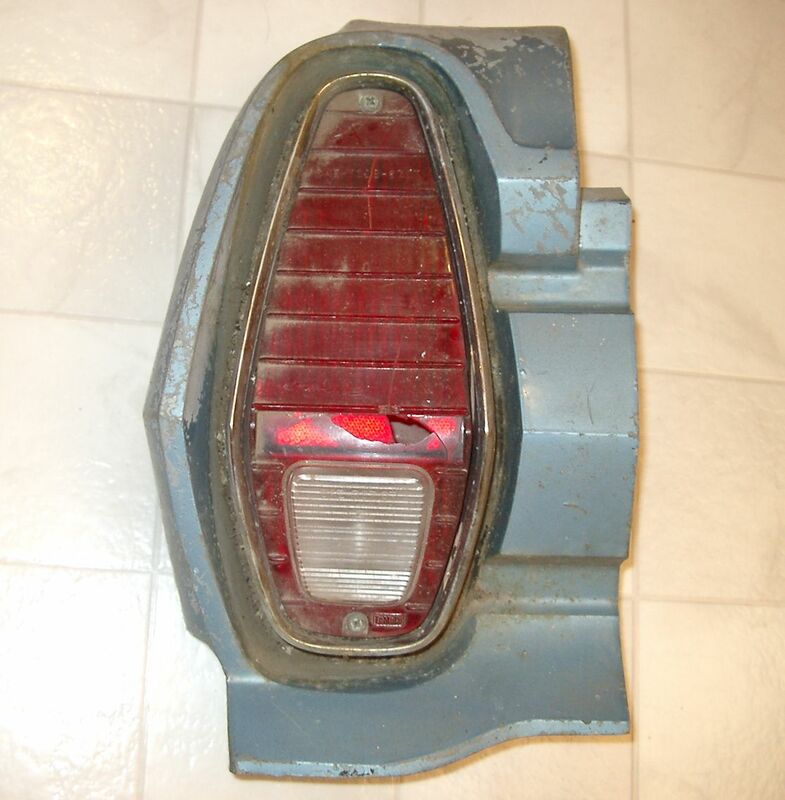 1967 Plymouth Barracuda Parking Light/Turn Signals - Lenses/reflectors poor, housings good. For parts or restoration - $10 pr. 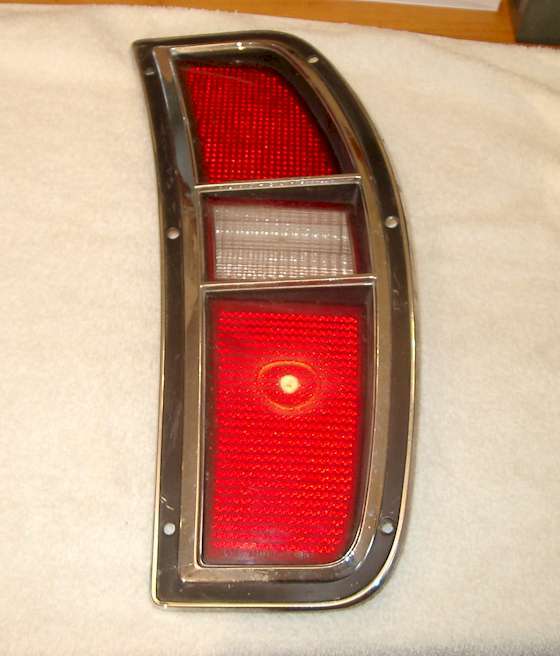 1969 Plymouth Satellite Station Wagon Taillight Bezel NOS LH - Part # 2930467. Some shelf wear - two small scratches and small chips in the textured area - $30. 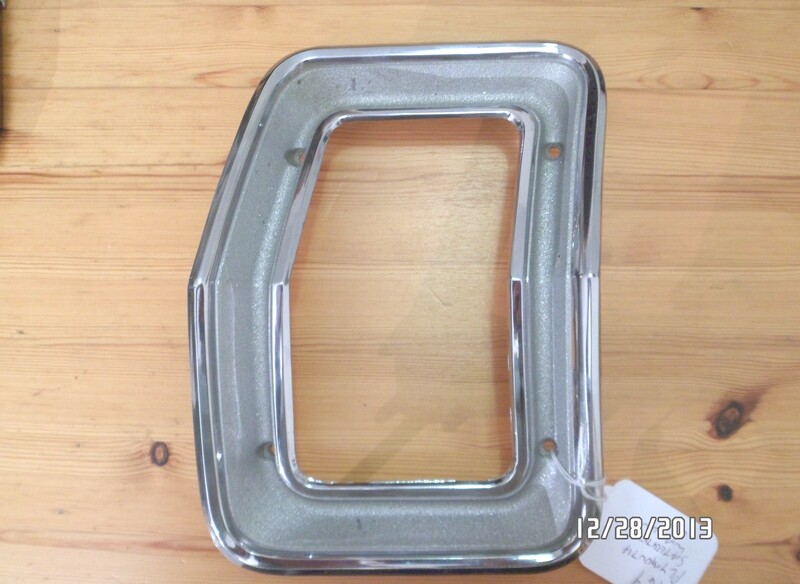 1980 Plymouth Volare Headlight Bezel LH - Part # 4074431. In driver condition. Some deep scratches on top edge and left corner - $10. 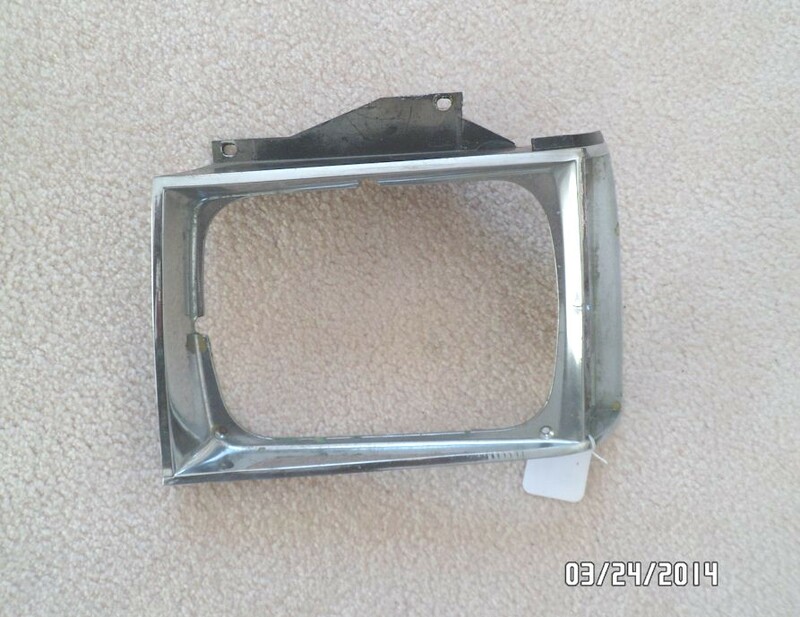 1984 to 1989 Plymouth Fury Headlight Bezel - Part # 4074626. In good driver condition. One broken tab. Needs a polish - $10. 1959 Pontiac Catalina / Safari Taillight Assembly - In aged original condition. No cracks in lens. Frame needs a polish. 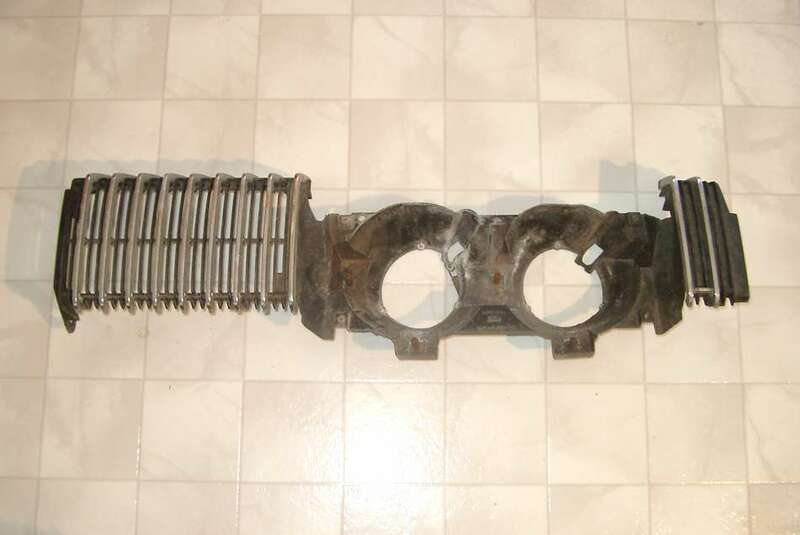 Part # R2-59 - $10. 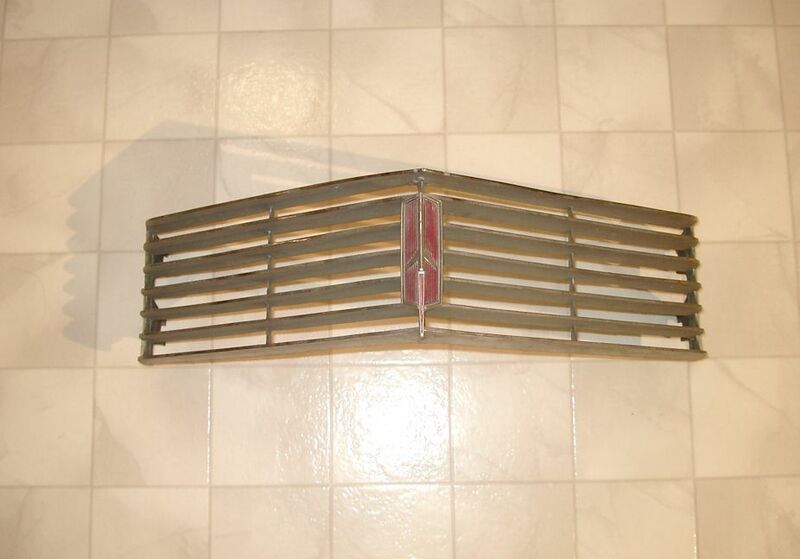 1959 Pontiac Driver's Side Grille - In good original condition - $40. 1963 Pontiac Catalina / Star Chief / Bonneville Grille LH - In good but aged original condition. Includes emblem. Part # 543734 - $20. 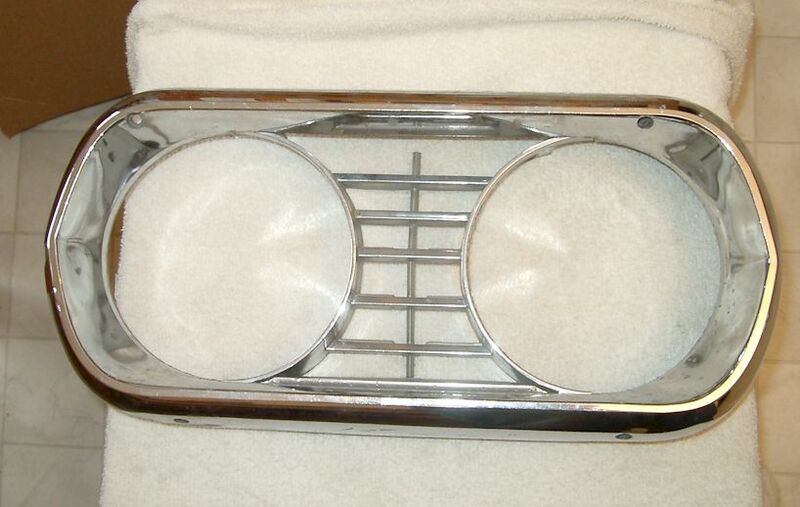 1963 Pontiac Catalina / Star Chief / Bonneville Grille RH - In aged condition with a repaired crack. Part # 543733 - $10. 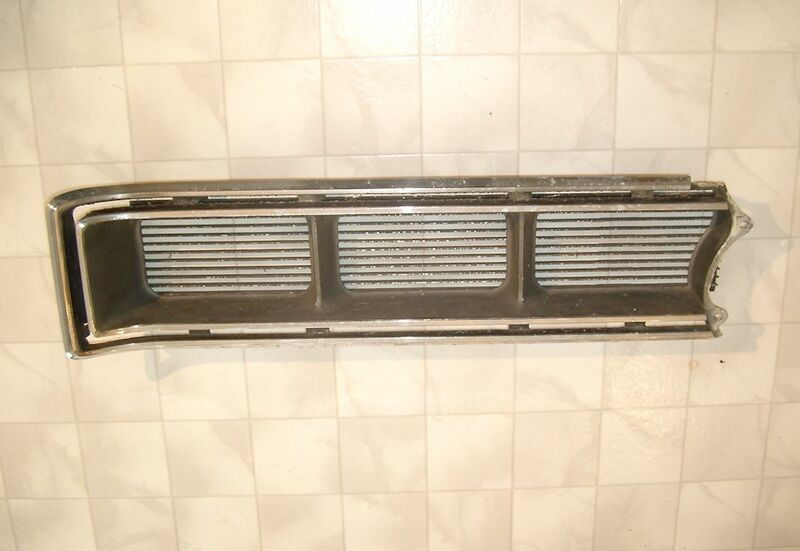 1963 Pontiac Grand Prix Grille Housing LH - In aged condition with a repaired crack. No bars. 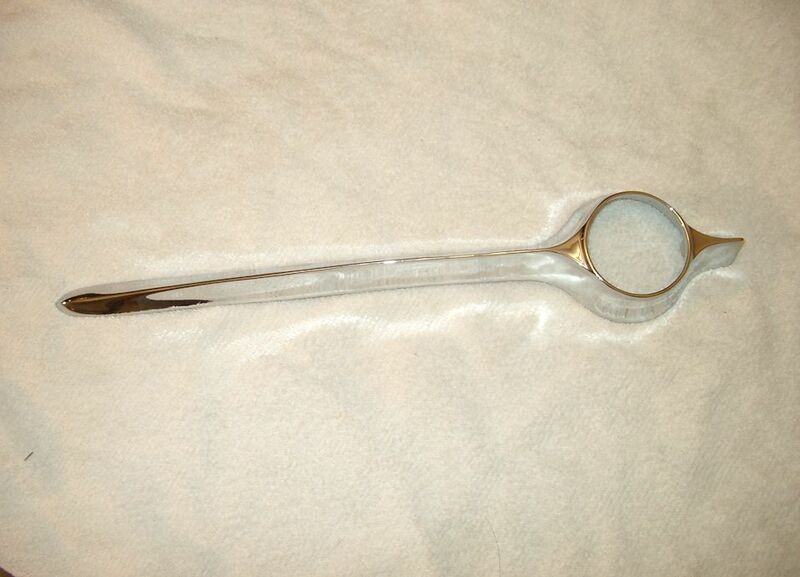 Fixable bend to top and bottom at rear- $5. 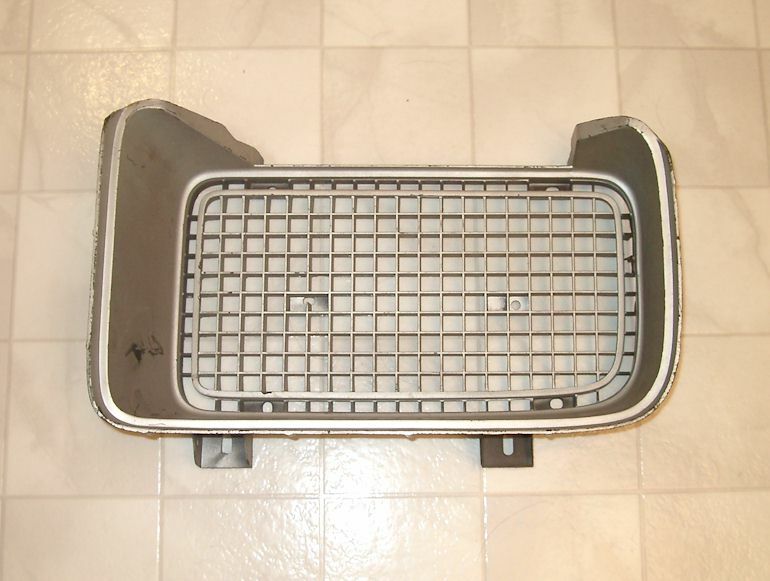 1964 Pontiac Grand Prix Grille Housing RH - Pt. # 9774220. In aged condition with some crack repairs. For restoration - $5. 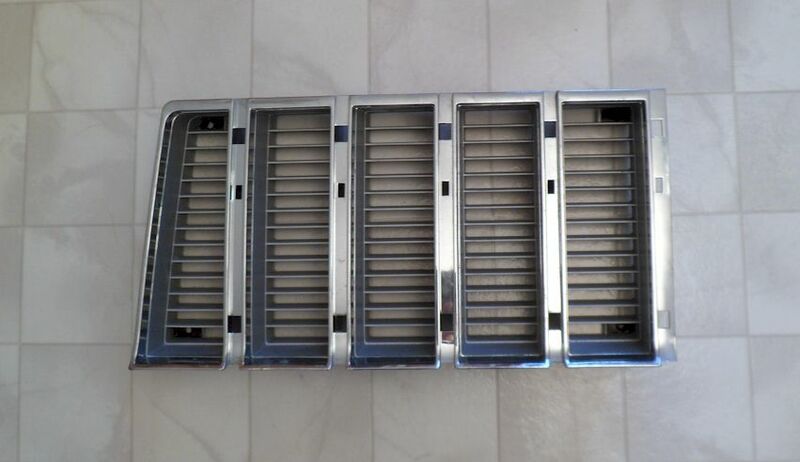 1964 Pontiac Grille Full Size LH - Pt. # 9773972. Two available. Both have repaired cracks. Good for a driver. $20 each. 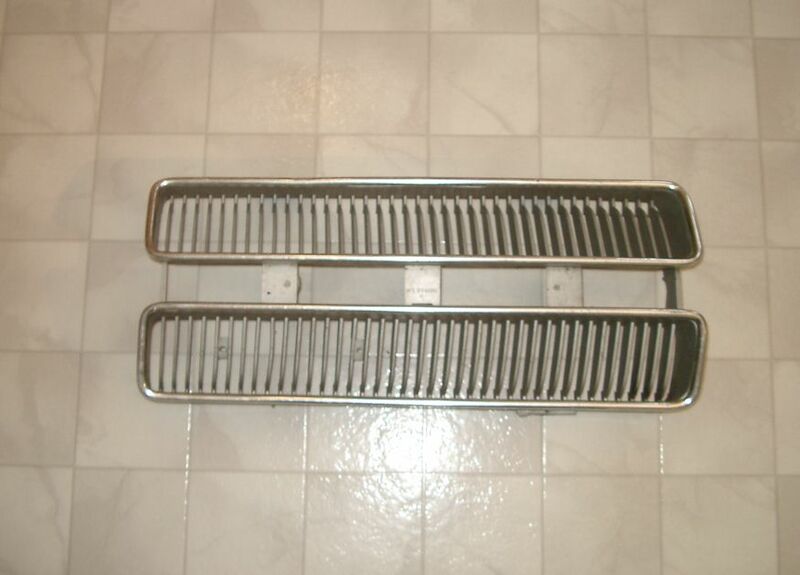 1965 Pontiac Grand Prix Grille LH - Pt. # 9779161. In aged original condition. Good for a driver - $20. 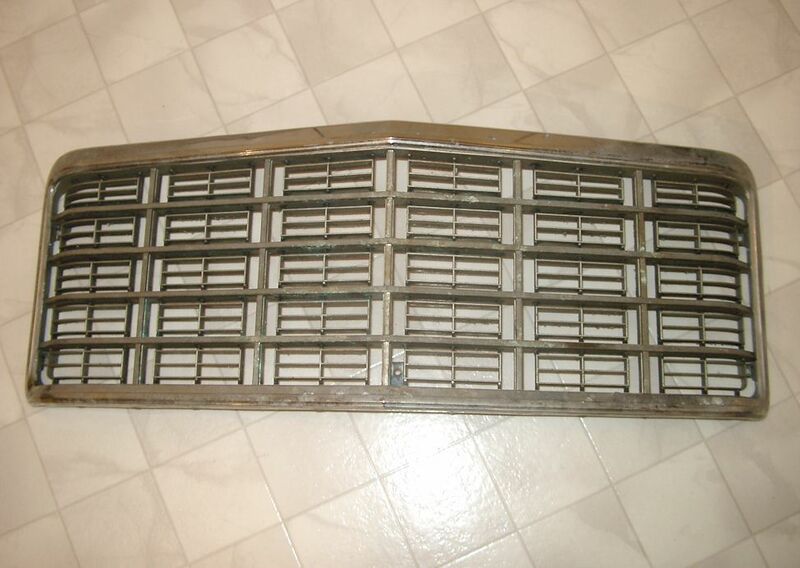 1965 Pontiac Bonneville LH Grille - Part # 9778833. In aged original condition with some repaired cracks. Good for a driver - $10. 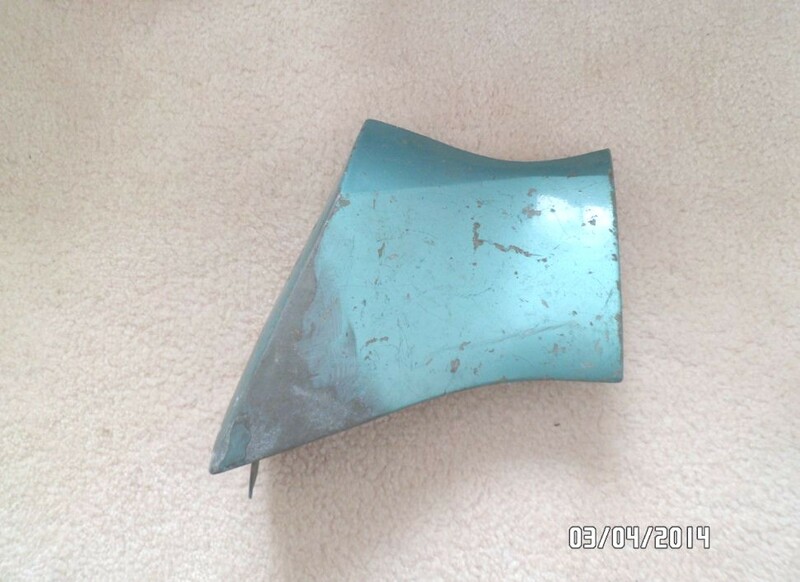 1965 Pontiac Parisienne Tail Trim Panel - Pt. # 5738411. 2 available. Both have repaired cracks. Better one SOLD, $20 for the one missing letters. 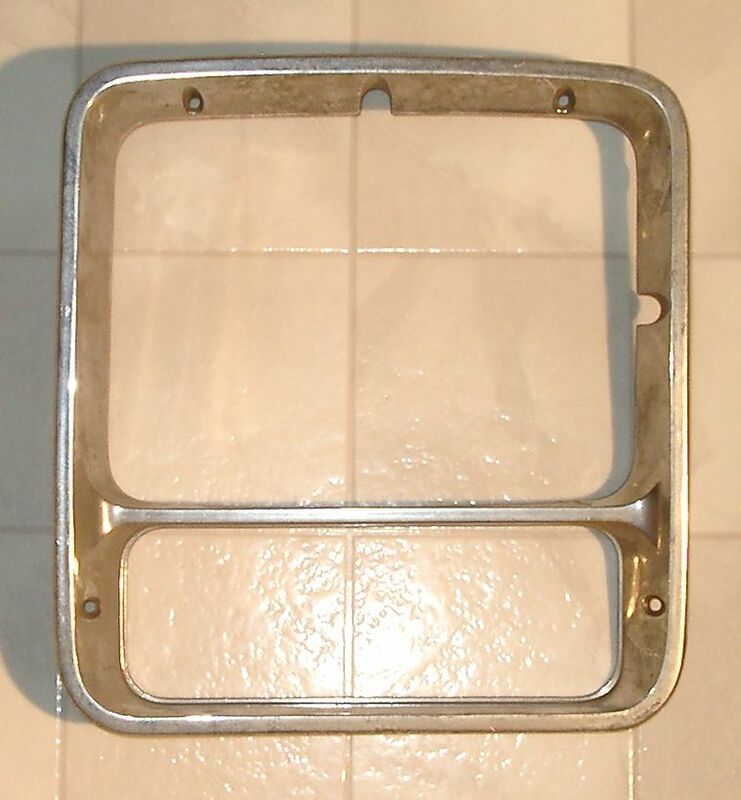 1965 Pontiac Star Chief & Catalina Tail Trim Panel - Pt. # 5738417. One repaired crack. All studs present. Good for a driver - $30. 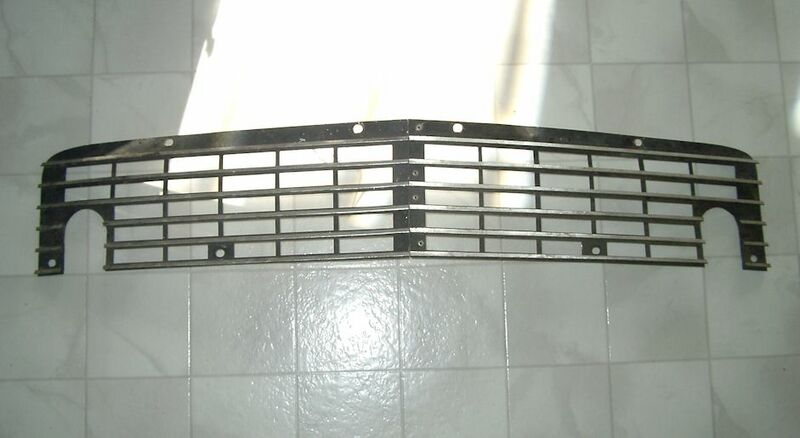 1966 Pontiac Bonneville / Catalina Grille LH - Part # 9785465. 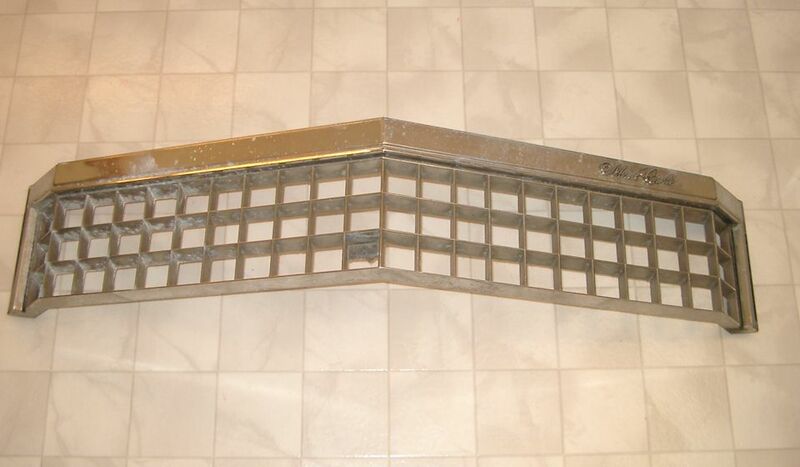 In aged condition with some cracks to the plastic grille section - $10. 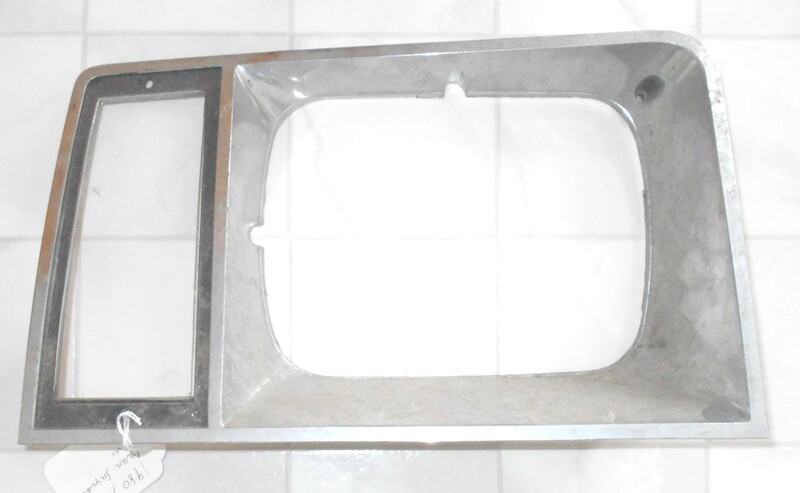 1967 Pontiac Bonneville and Catalina Headlight Bezel RH - Part # 9787080. In good driver condition - $10. 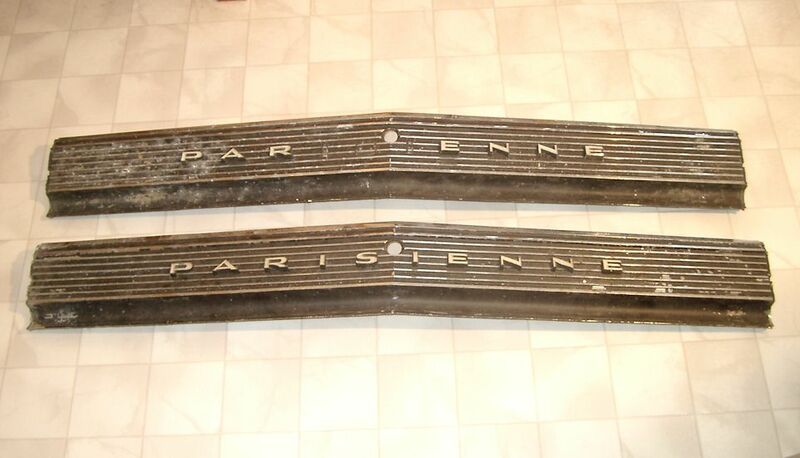 1968 Pontiac Grand Parisienne Grille RH - Part # 9790975. Inside edge mounting tabs broken. Balance of grille good. For restoration - $10. 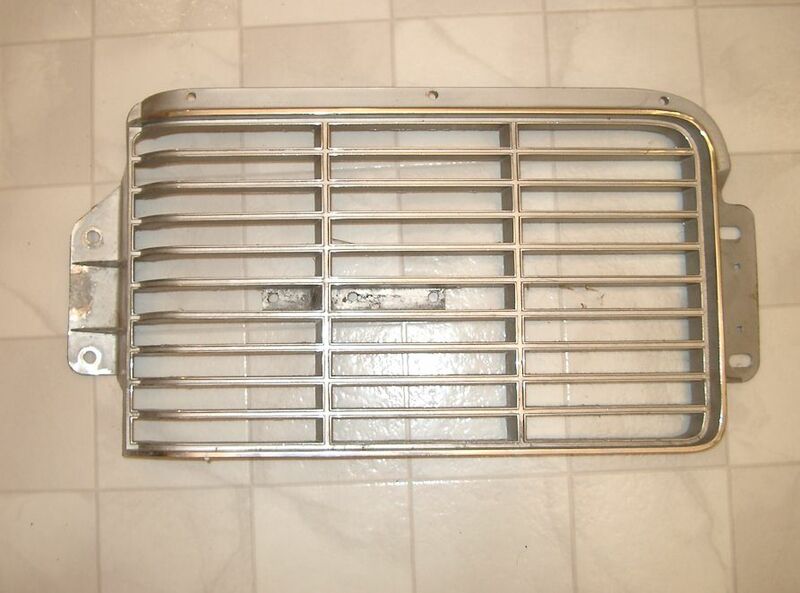 1970 Pontiac Firebird Grille Assembly LH - Part # 478515. In aged condition - $SOLD. 1970 Pontiac Firebird Taillight Bezel RH - Part # 5963096. In good original condition but does have a few pits - $15. 1970 - 1973 Pontiac Firebird Taillight Housing RH - Part #5963090. In good original condition - $10. 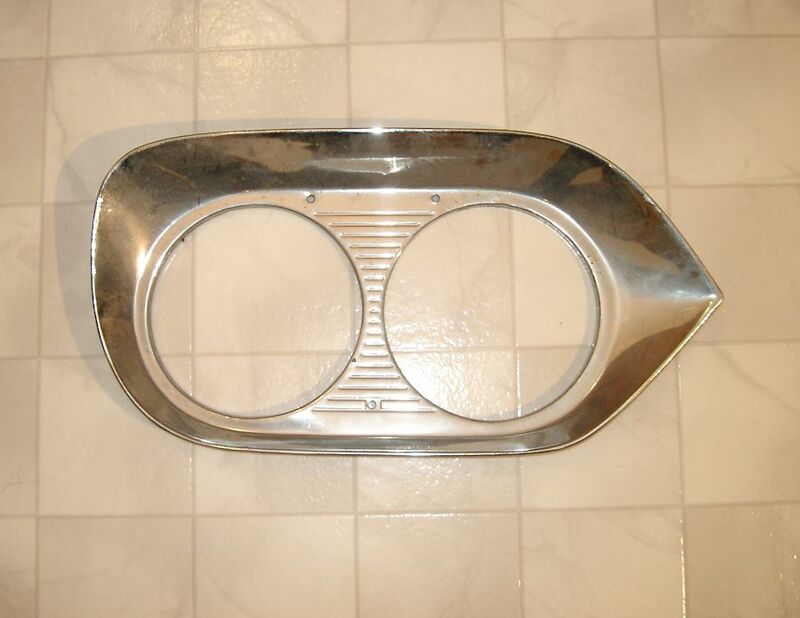 1970 Pontiac Bonneville, Catalina, Executive, Parisienne, Laurentian, Stratocheif, 2+2 Headlight Bezel LH - Part # 9799828. Very good, NOS? - $20. 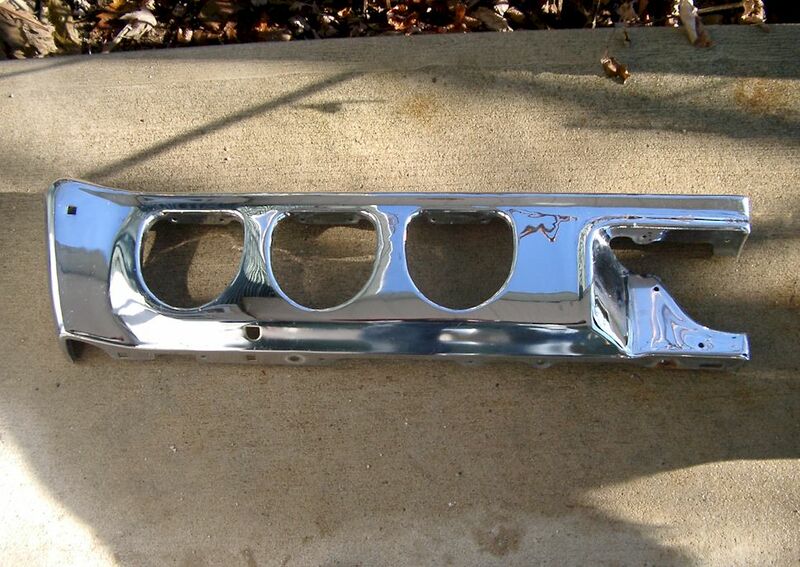 1970 Pontiac Bonneville, Catalina, Executive, Parisienne, Laurentian, Stratocheif, 2+2 Headlight Bezel RH - Part # 9799827. Very good, NOS? - $20. 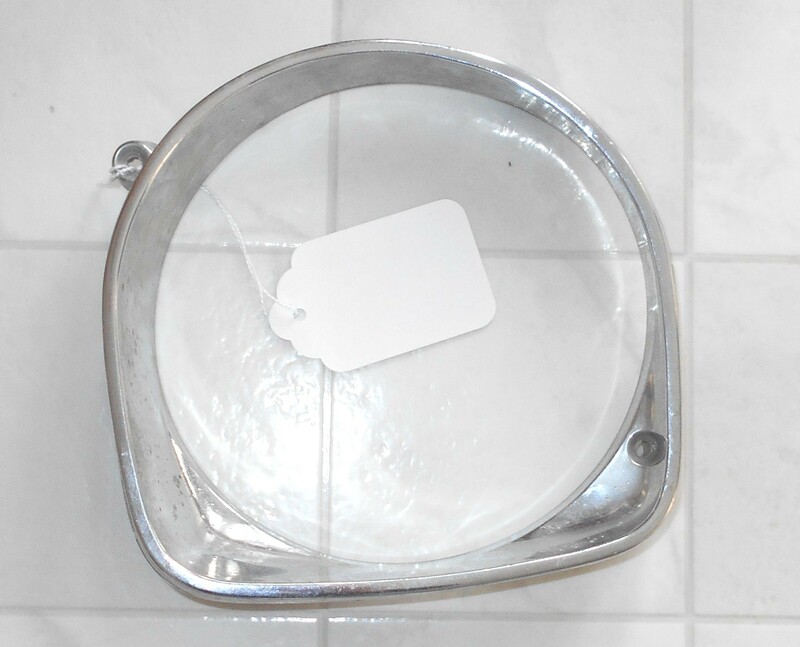 1971 Pontiac Bonneville Tail Light Bezel LH - Part # 481262. In good but aged original condition. Two available - $10 each. 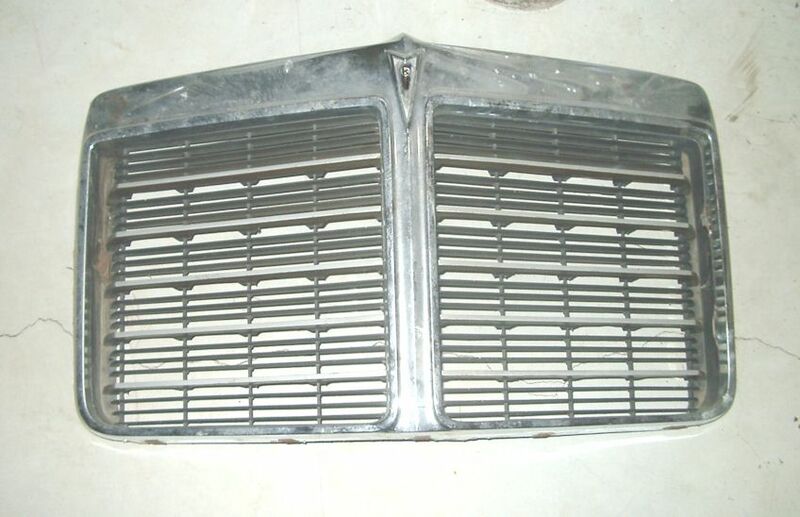 1971 Pontiac Catalina Grille LH - In good original condition. Part # 481607. May be correct for Parisienne - $40. 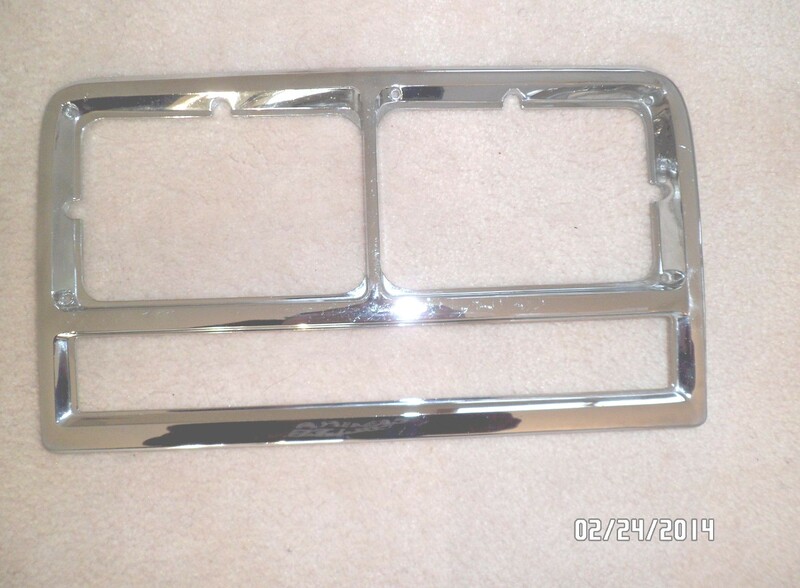 1973 Pontiac Catalina Lower Grille LH - Part #488278. In very good condition - $10. 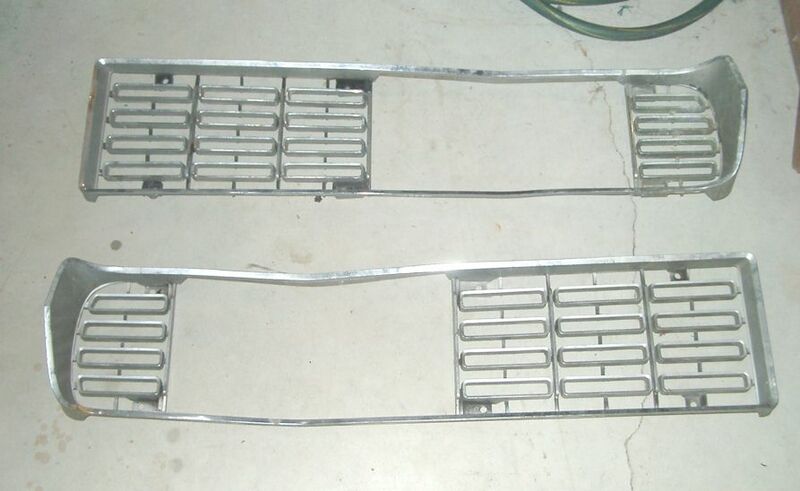 1973 Pontiac Grand Prix Upper Grille LH & RH - Part # 488126 (photo) & 488125. In good original condition. 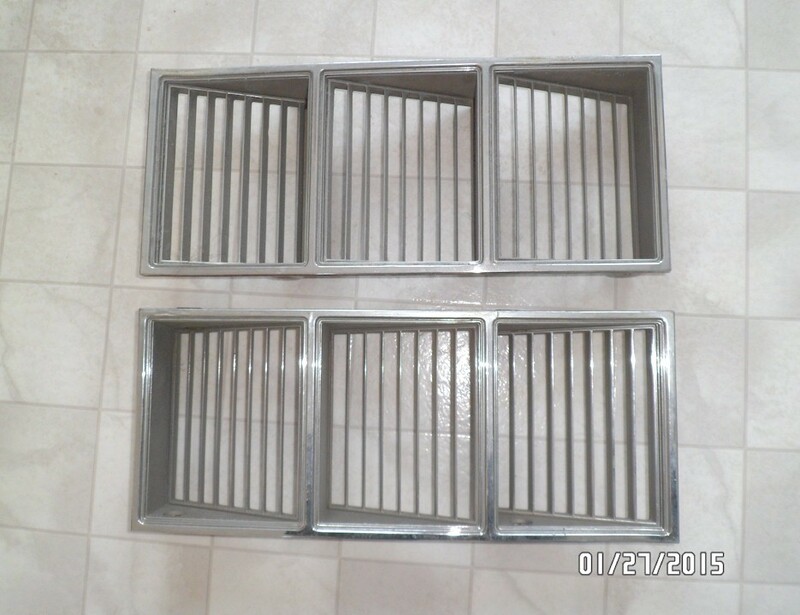 Some pitting to fins - $20 each. 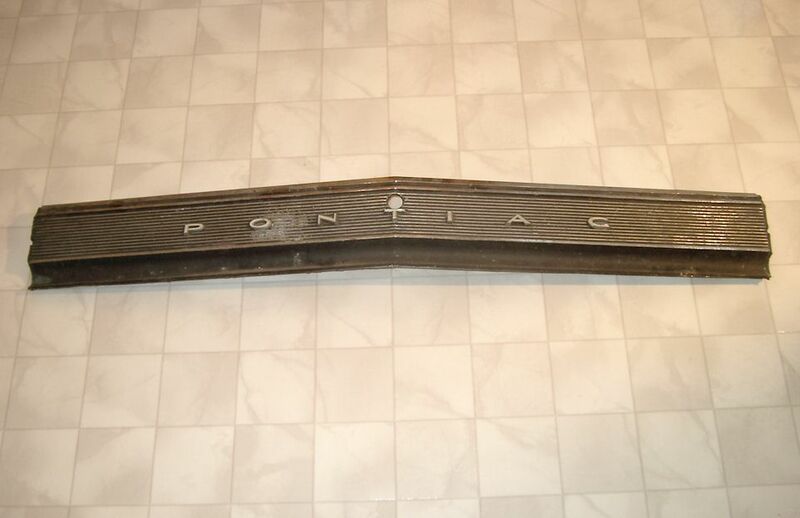 1973 Pontiac Ventura Grille Assembly RH - Used original part # 489135. In good driver condition - $20. 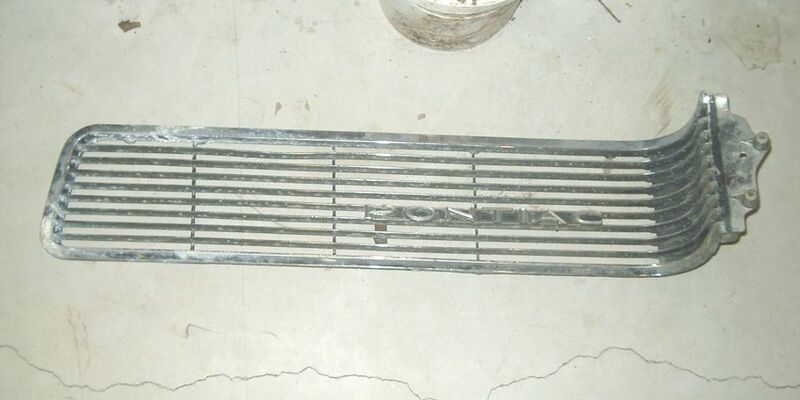 1973 Pontiac Ventura Grille Assembly LH - Used original part # 489136. Useable but has crack and one missing mounting tab - $5. 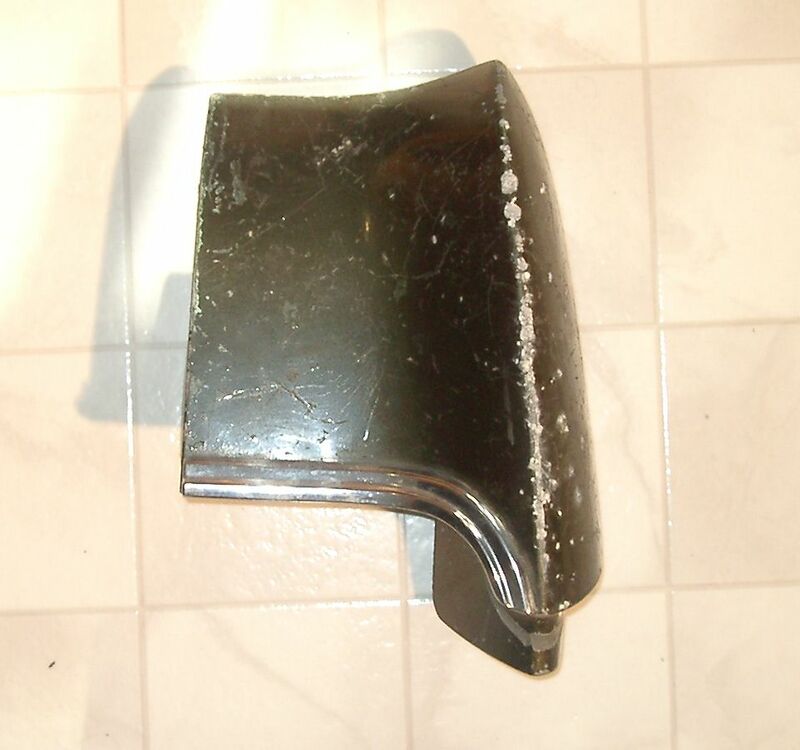 1974/1975 Pontiac Luxury LeMans/Grand LeMans Fender Skirt LH - Driver's side fender skirt in good condition. Part # 494492 - $50. 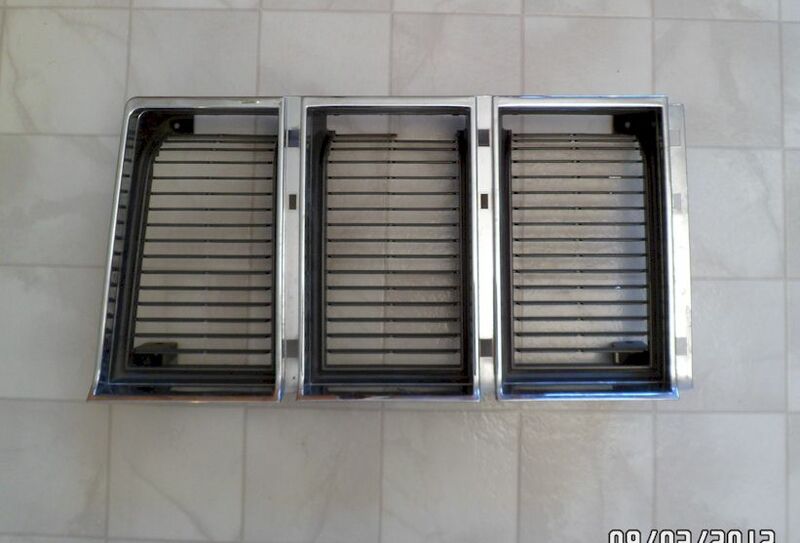 1974 Pontiac Parisienne Grille - In good original condition. Missing emblem - $20. 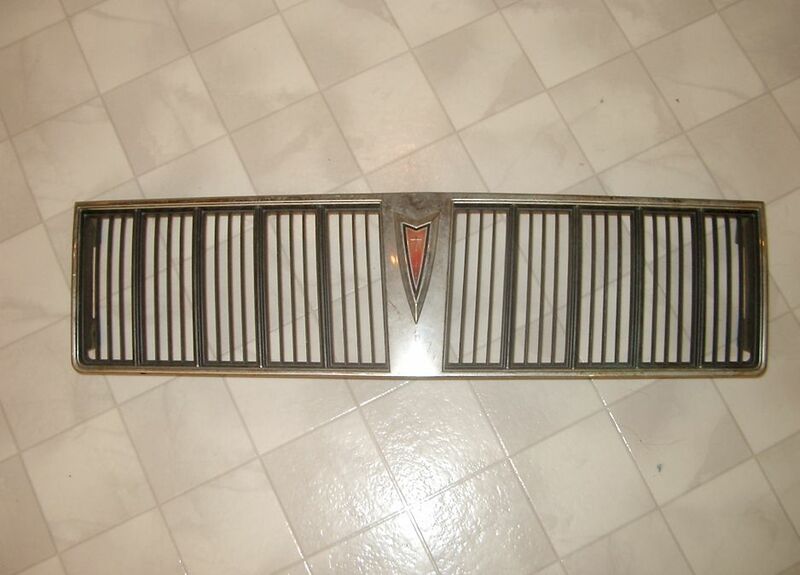 1975 Pontiac Venture Grille LH - Part # 496317. 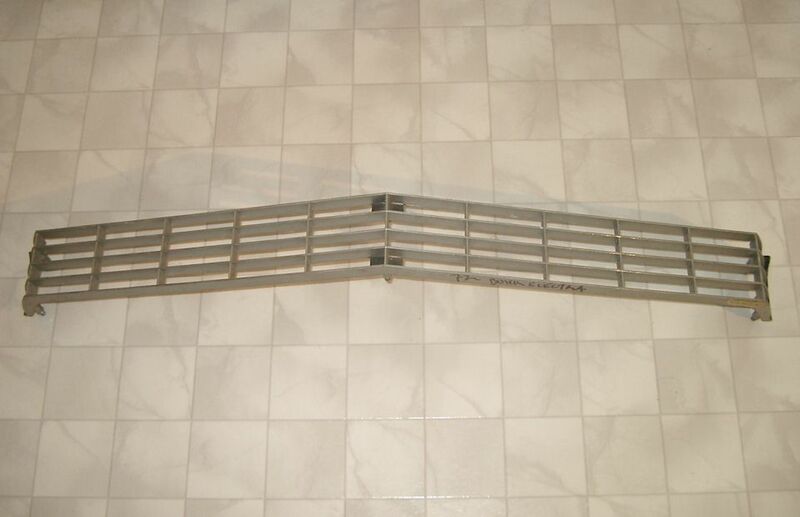 Three broken vertical slats. 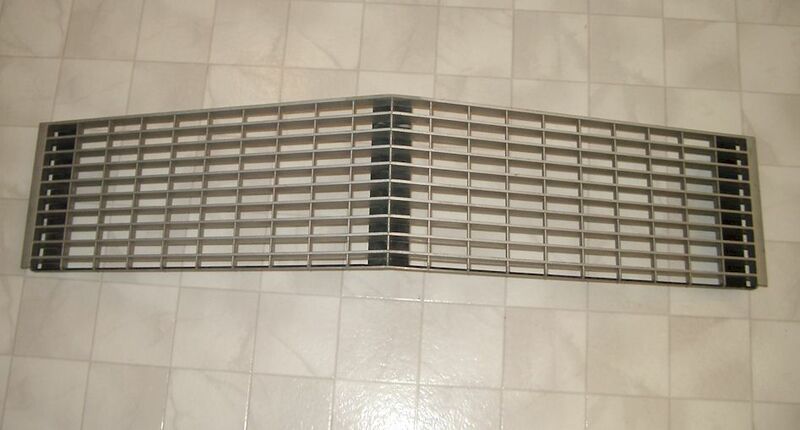 Horizontal slats good. Some corrosion on trim - $10. 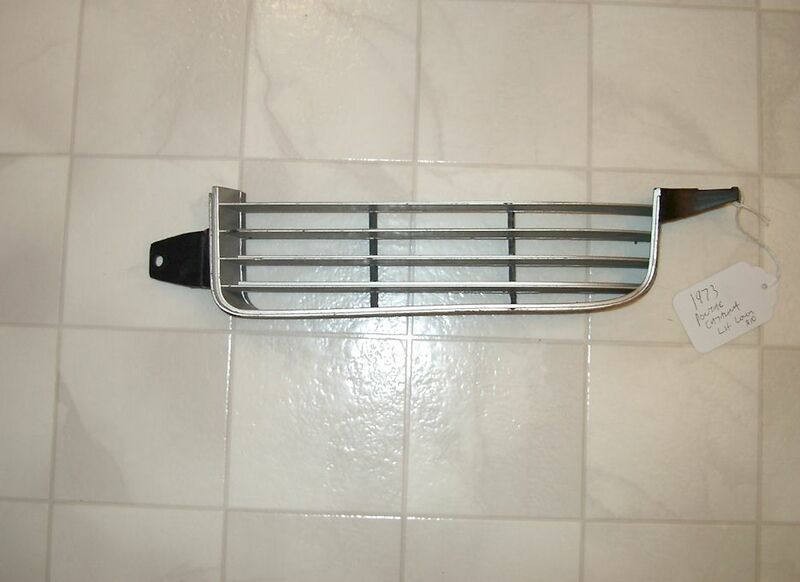 1976 Pontiac Firebird Grille Assembly RH - Part # 498835. In good "driver" condition. 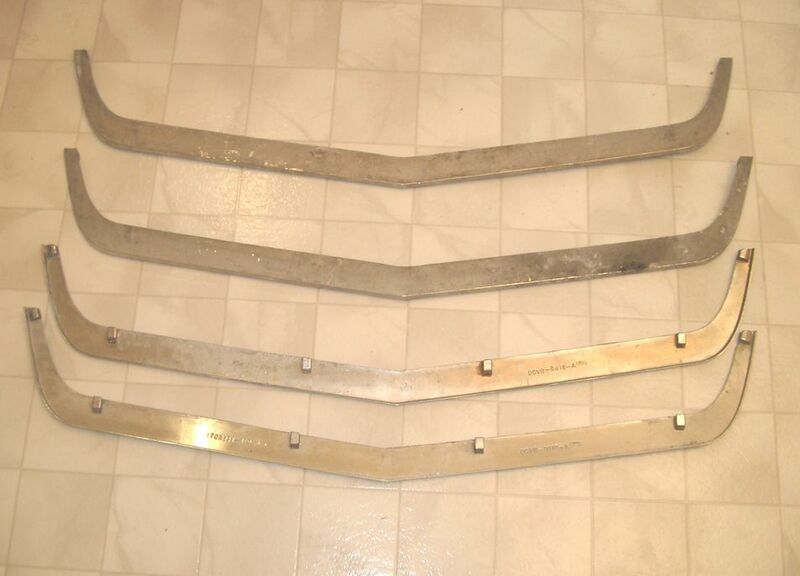 Mounting tabs have been repaired - $10. 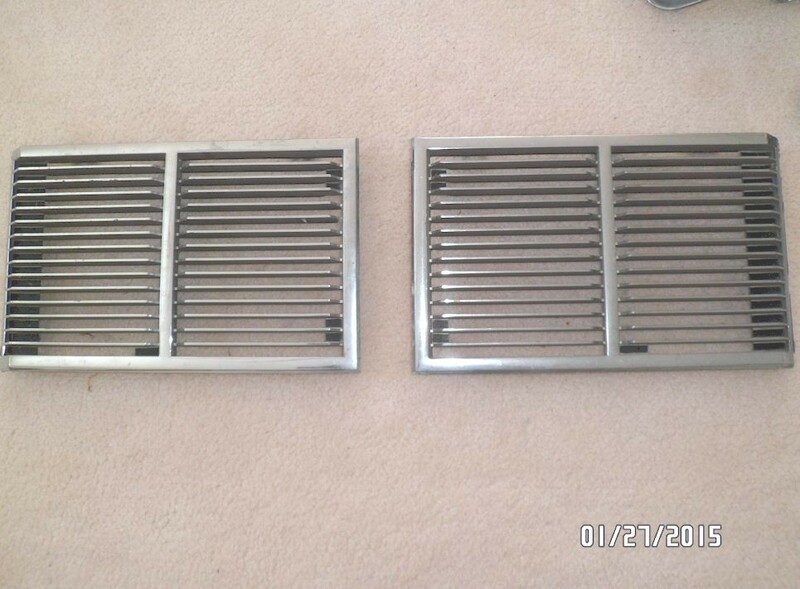 1976 Pontiac Grand LeMans Grilles LH and RH - Part # 498632 and 498633. In "driver" condition with repaired mounting tabs - $10 each. 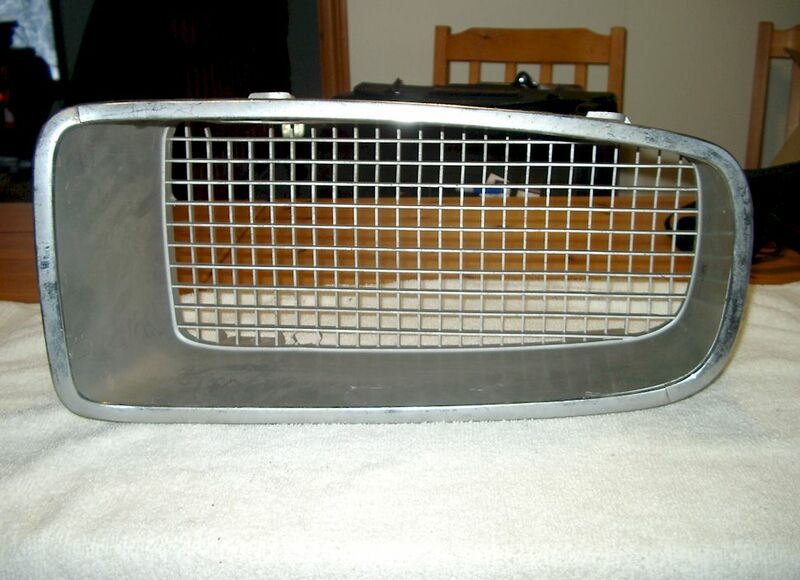 1976 Pontiac Lemans Grille RH - Part # 499781. In good original condition - $20. 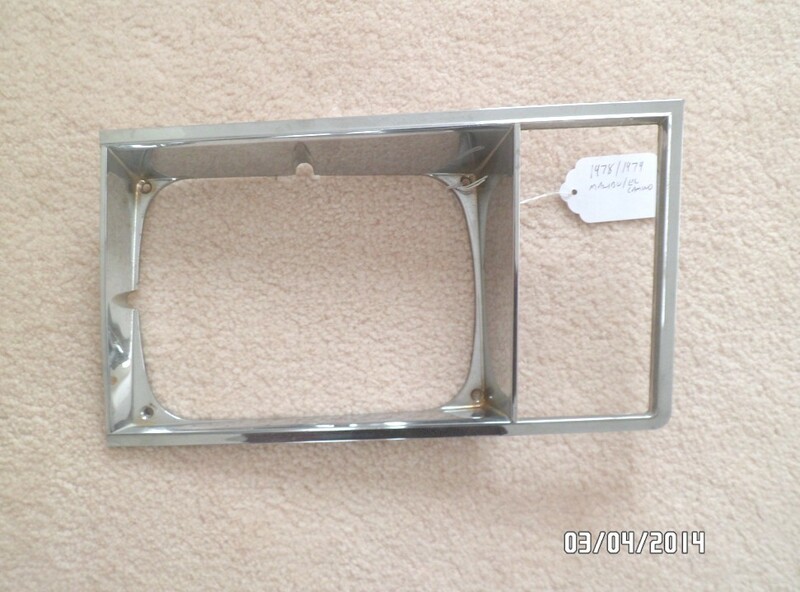 1977 Pontiac Parisienne/Bonneville Headlight Bezel RH - Part # 526037. In driver condition. One repaired crack and a small divot in the same spot - $10. 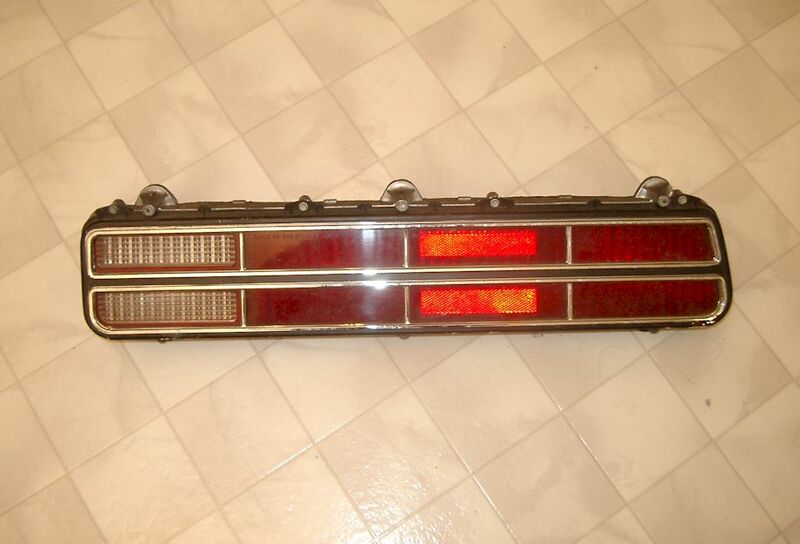 1978 Pontiac Parisienne/Bonneville Tail Light Bezel LH - Pt. #5969611. NOS. Two available. 1 very good - $25. 1 has spot of chrome missing - $5. 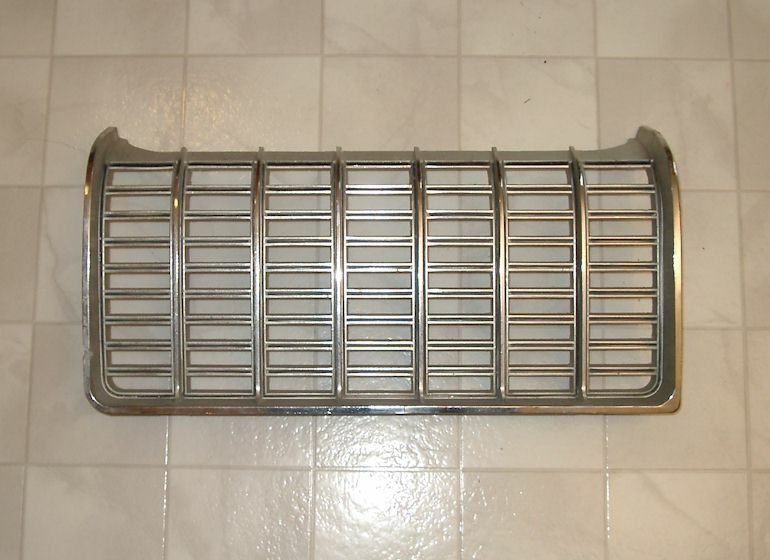 1978 Pontiac Lemans Grille LH - Part # 10000229. In good driver condition. Some minor pits and cracks - $20. 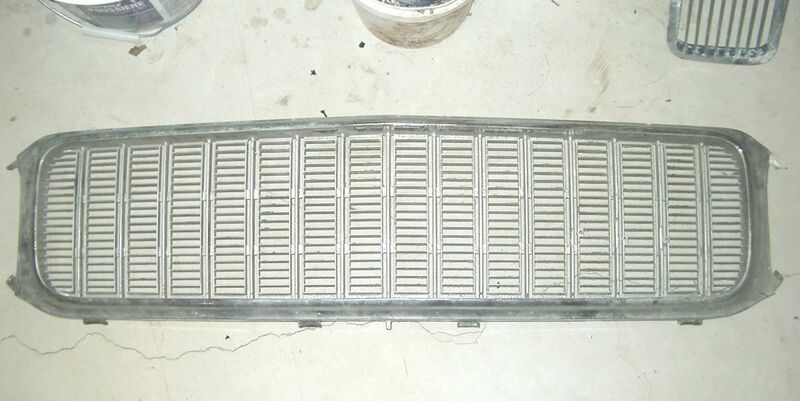 1978 Pontiac Grand Am Grille LH - Part #10000521. New Old Stock in excellent condition - $SOLD. 1978 to 1980 Pontiac Grand Prix Headlight Bezel LH - Part # 549481. In driver condition with one repaired crack on top edge - $SOLD. 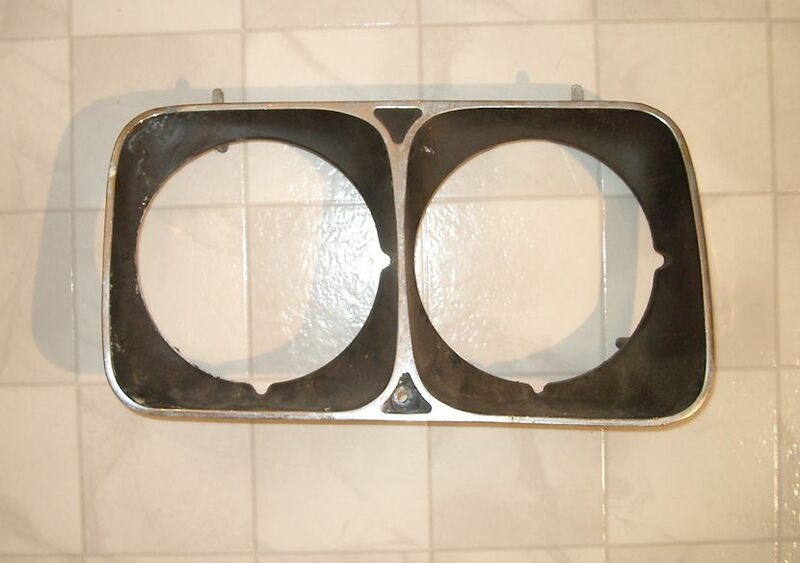 1979 Pontiac Parisienne, Bonneville Headlight Bezel/Door LH - Part # 10009667. In driver condition with aged chrome and one small crack - $10. 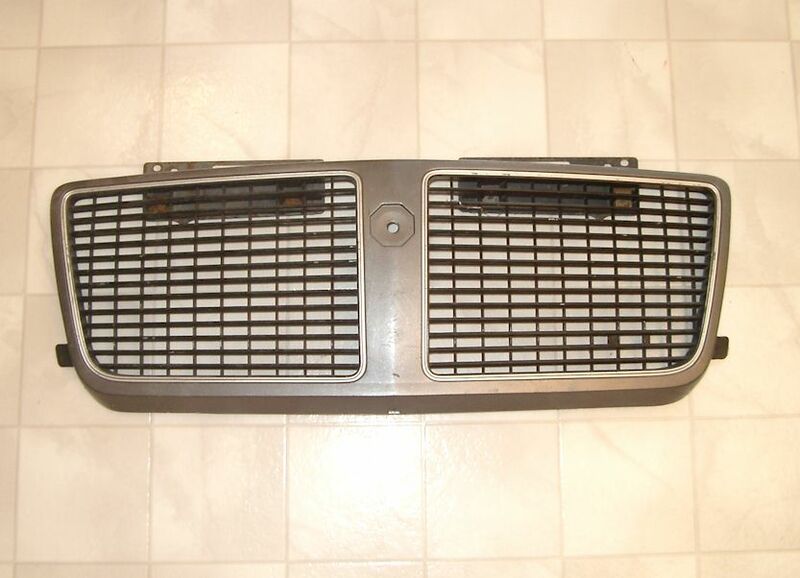 1980 Pontiac Grand Am Grille LH - Part #10004708. New Old Stock but has two broken slats. Repairable or use as is - $SOLD. 1980 Pontiac Phoenix Taillight Assembly LH - Part # 5970667. In very good condition - $20. 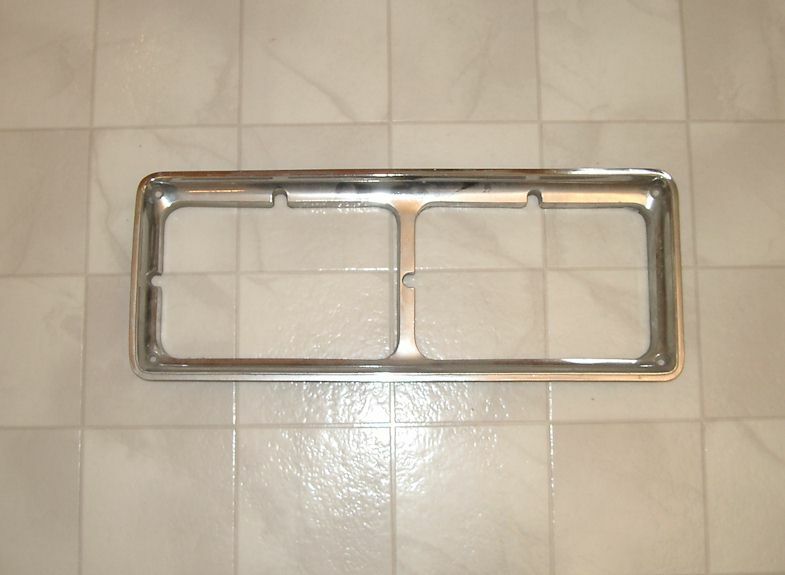 1981 Pontiac Bonneville Lower Grille LH - Part # 10013028. In aged original condition. Should clean up to driver level - $5. 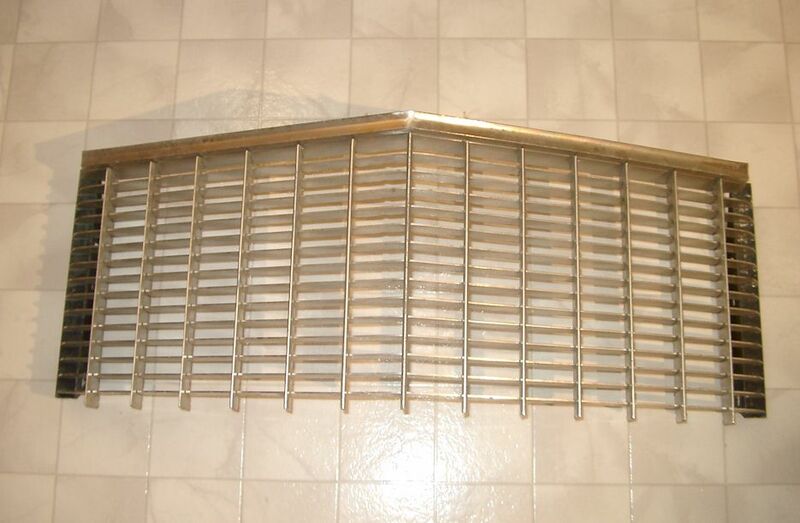 1981 to 1984 Pontiac Grand Prix Grille - Pt. # 10011598. In good condition outside of one scratch in the chrome - $20. 1982 Pontiac Acadian and T1000 Headlight Bezel LH - Part # 474755, 10030817, 10019615. Two mounting studs repaired, needs some additional sanding and accent paint refinished at repairs. Good chrome - $10. 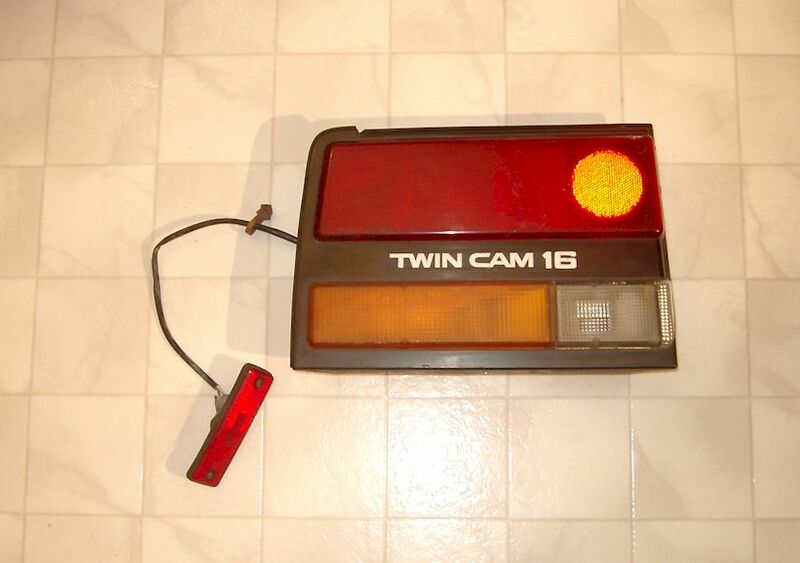 1982 Pontiac Firebird / Trans Am Left Taillight Lens - In good condition outside of one small crack in its centre. GM pt. # 5972885 - $10. 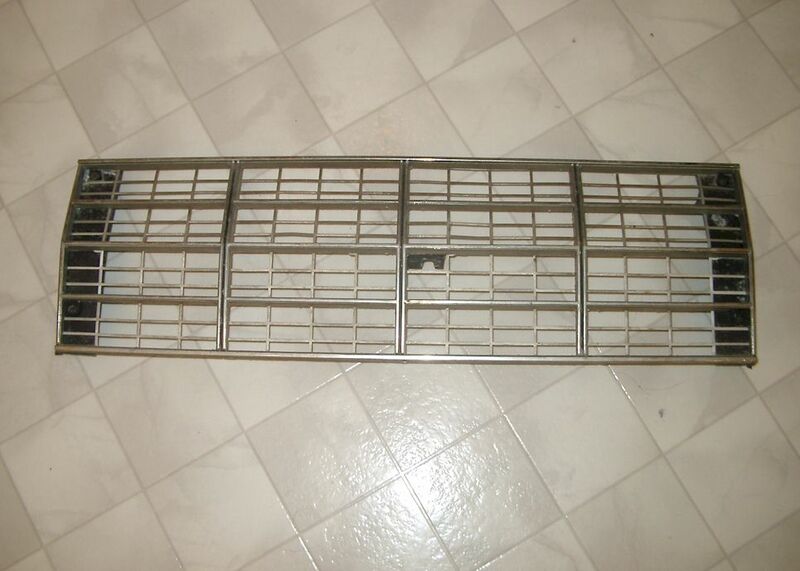 1982 - 1983 Pontiac 6000 Grille Assembly - Part # 10018453. In good original condition - $10. 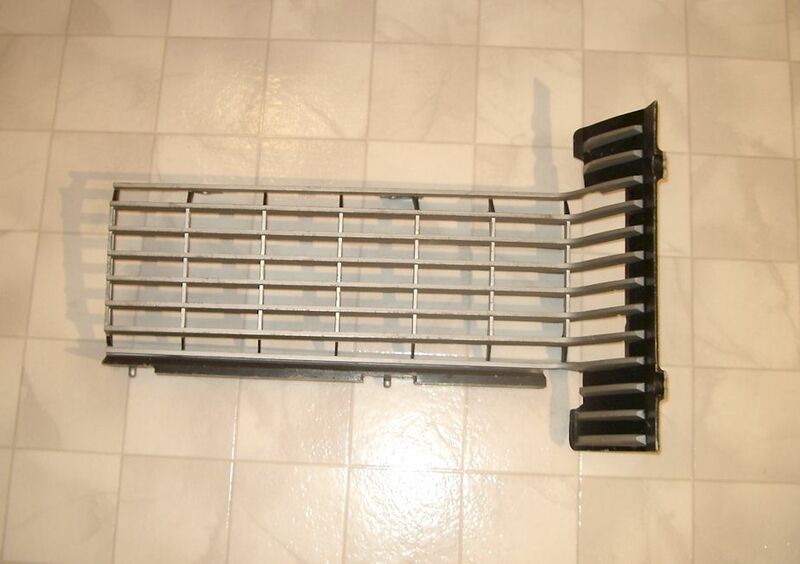 1985 to 1988 Pontiac Grand Am Grille - Part # 10037254. In driver condition with one crack at top - $5. 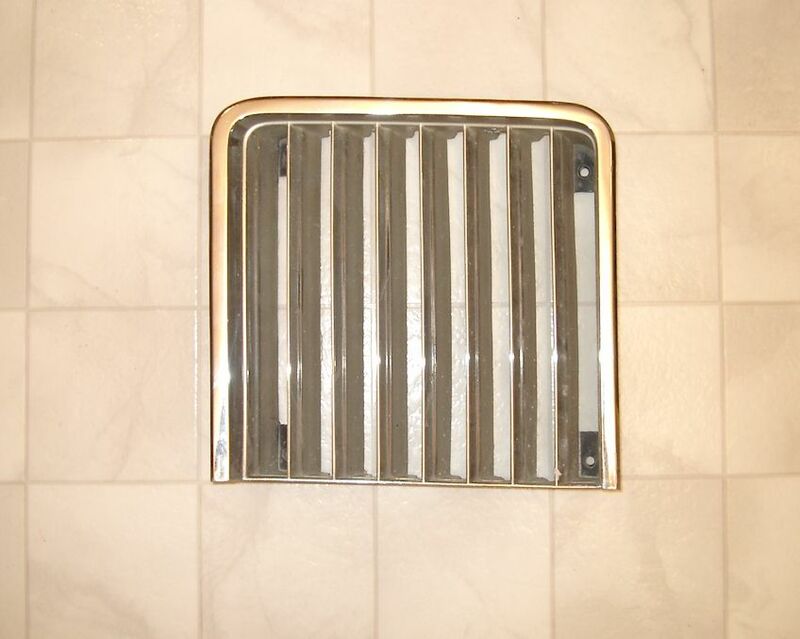 1984 to 1989 Toyota MR2 Side Vent - Part number 879B. In good condition - $10. 1984 to 1989 Toyota MR2 Tail Light LH - In good condition. One broken stud. Some light scratching to lens. Includes side marker - $10. 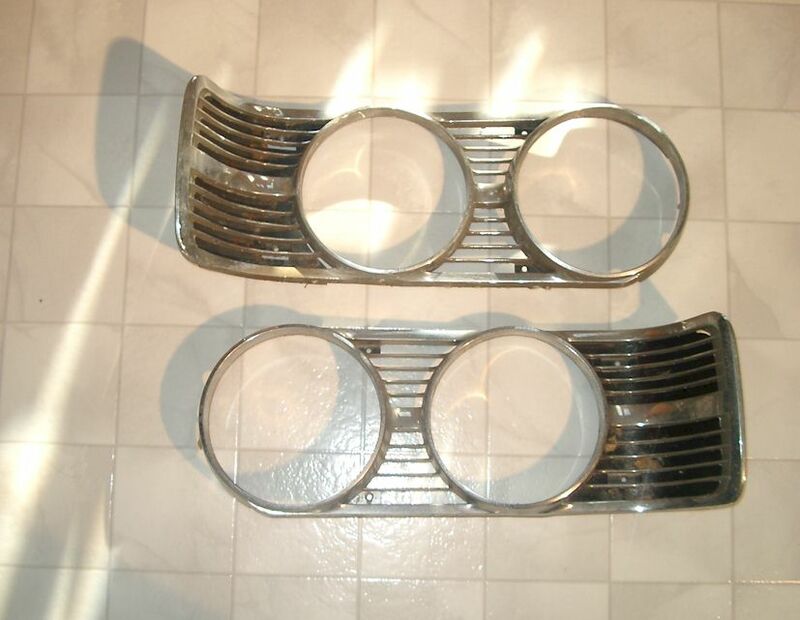 Triumph Spitfire MkIII or GT6+ Late Grille - In good condition - $SOLD. 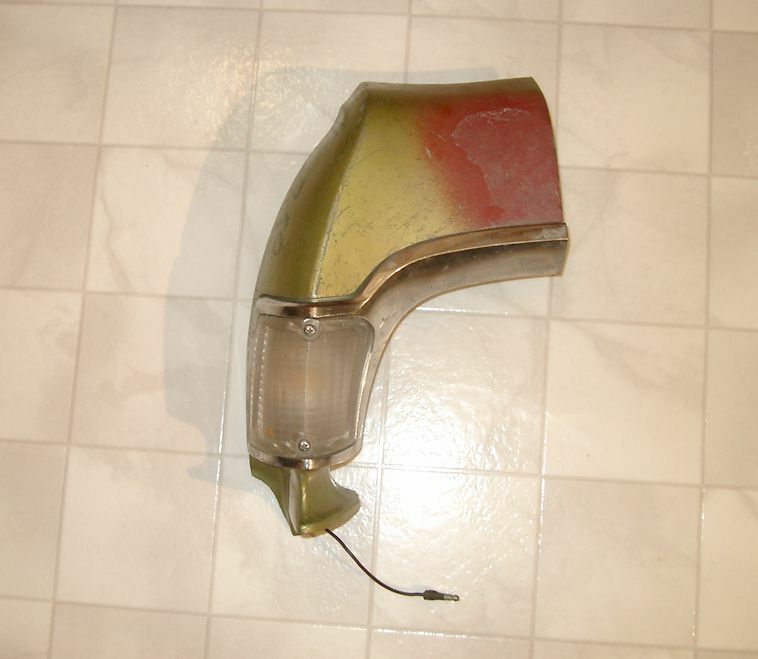 Vauxhall Viva Deluxe HA Rear Triple Tail Light Assembly Housing - Rare piece in aged original and restorable condition - $10. 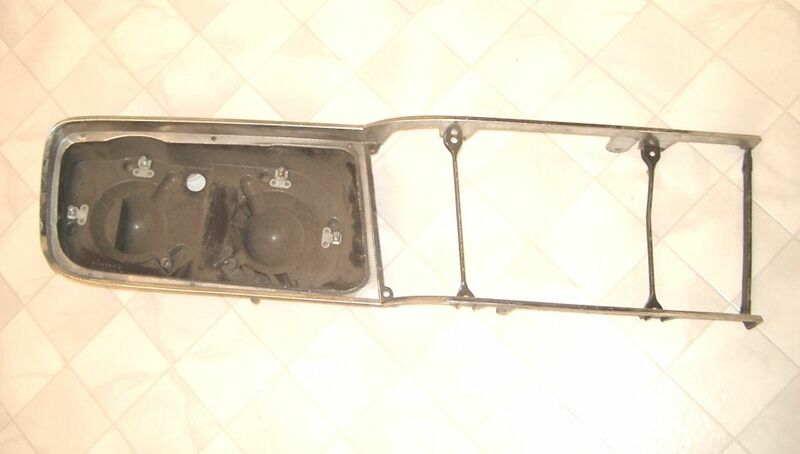 1968-74 VW Type 3 Fastback License Plate Light Housing - Housing in good condition. One stud broken on chrome trim. No light - $20. 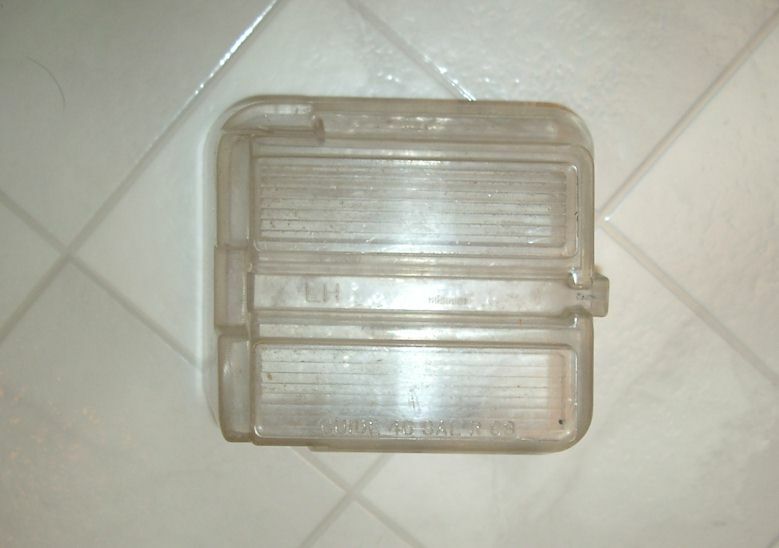 1968 and up VW Beetle License Plate Light Housing - Hassia Pt. no. 23502, 12930. Has a ding on either side. Includes lens and wiring - $10. 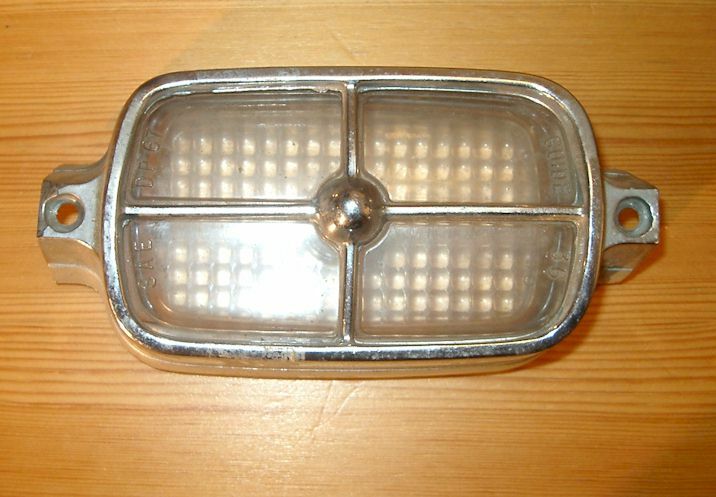 1970 Volvo 142GL Headlight Bezel RH - In driver condition - $10. 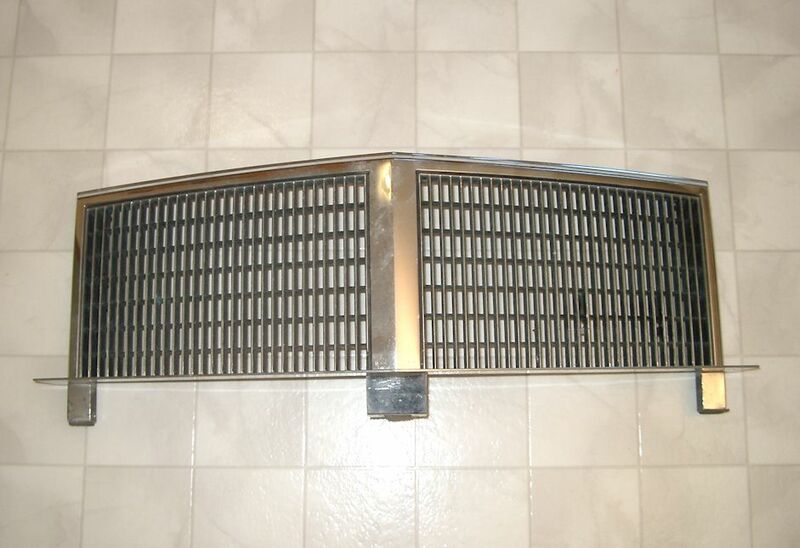 1974 Volvo 140 Plastic Grille - In aged original condition with many light scratches but no cracks- $SOLD. Click on blue links for photo. Keep checking back as I have several hundred parts to list here.